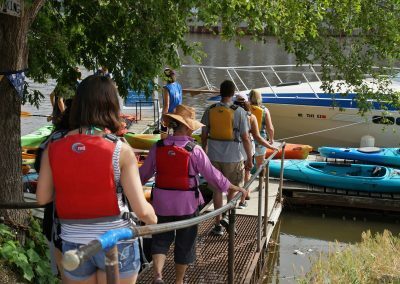 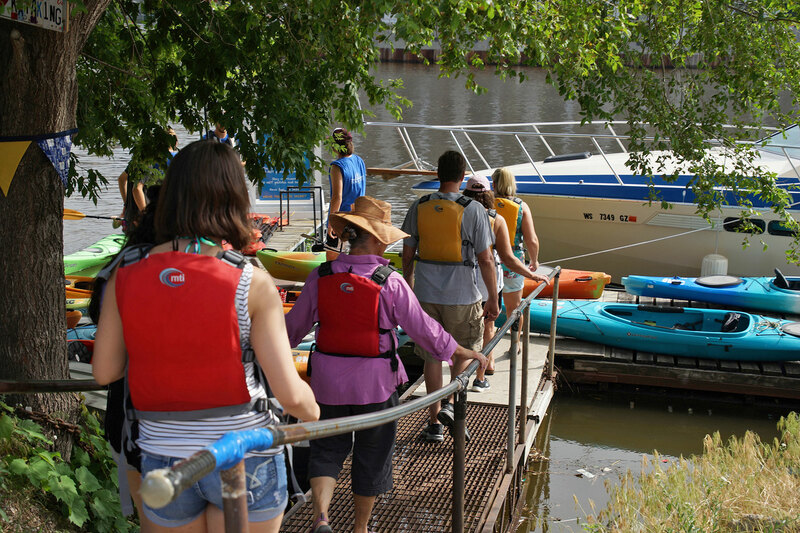 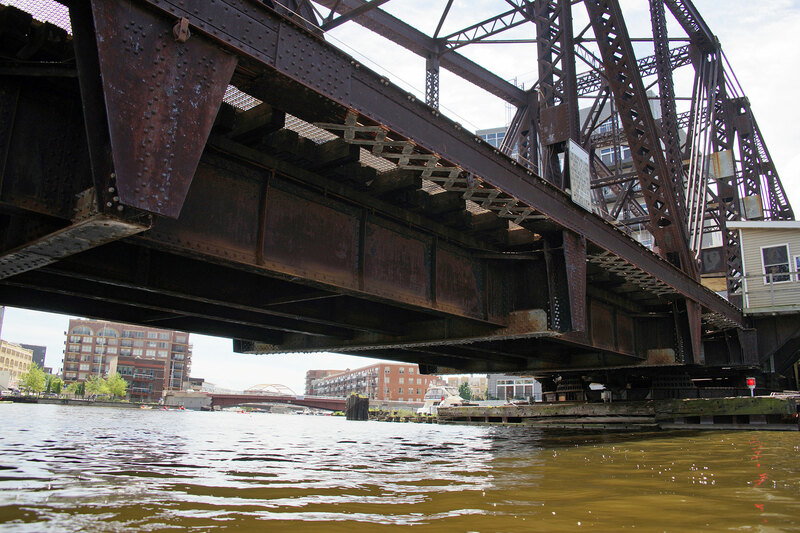 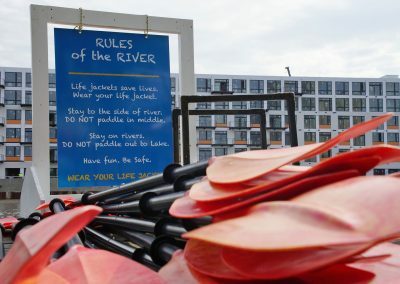 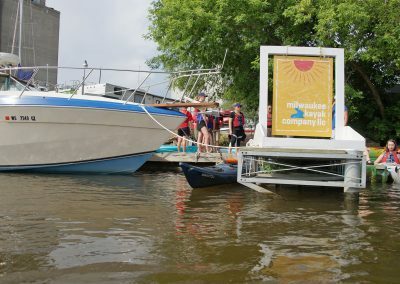 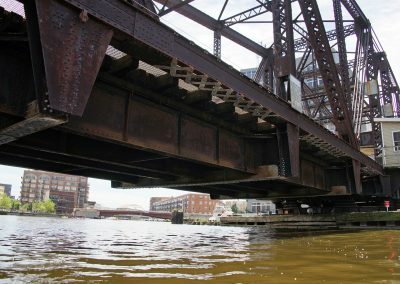 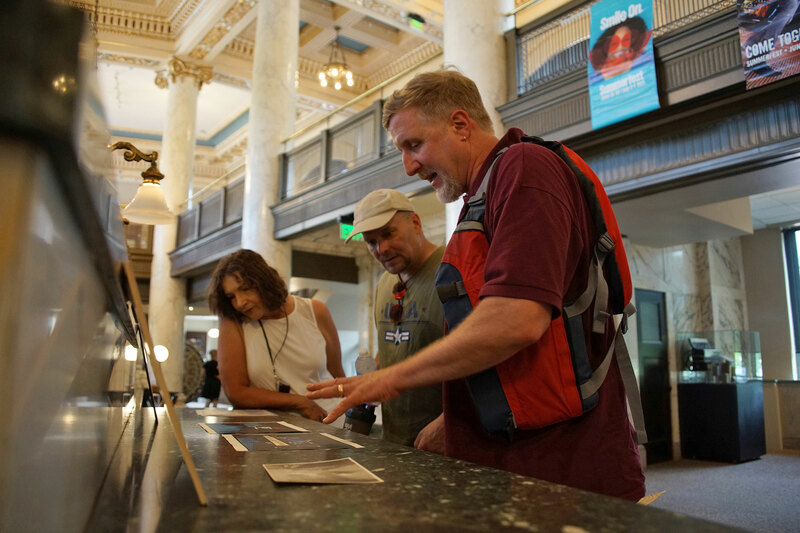 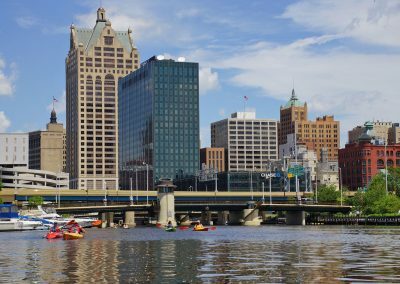 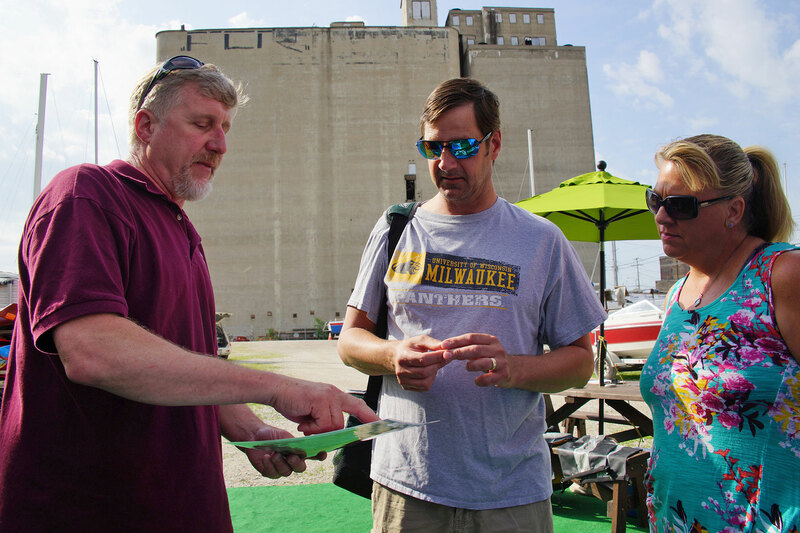 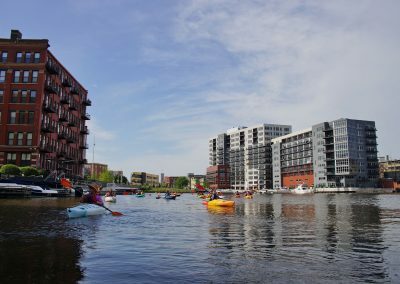 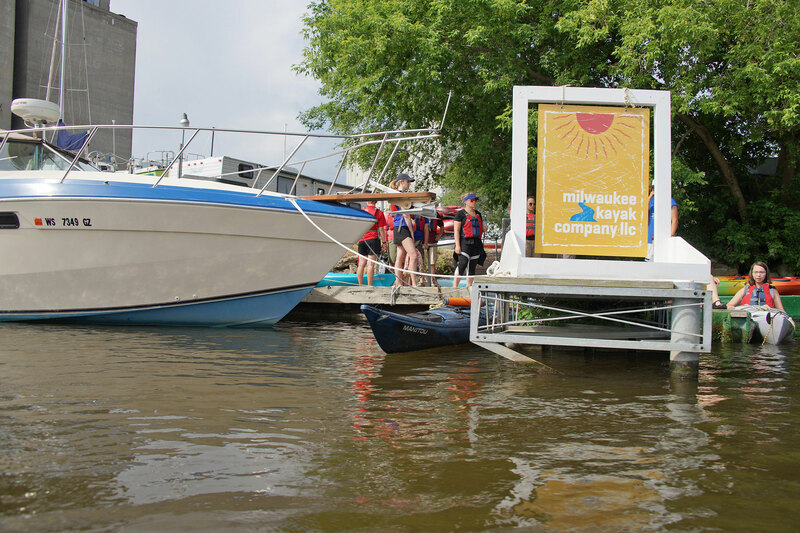 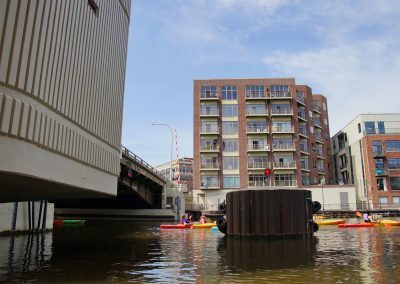 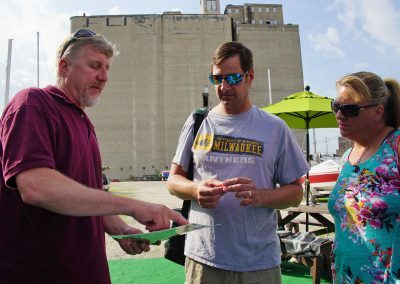 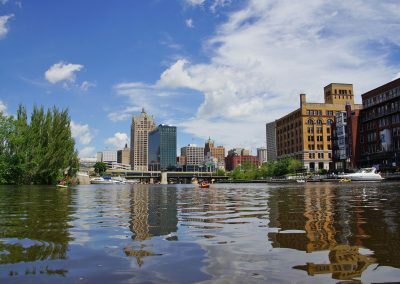 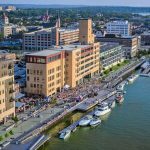 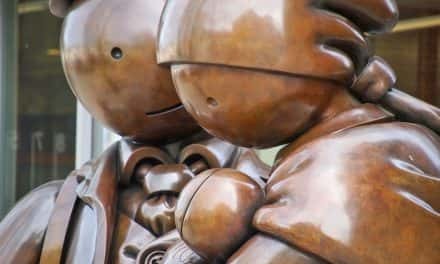 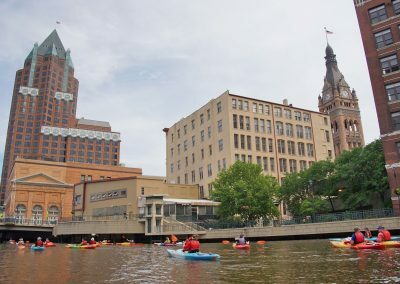 In its second year, the Milwaukee River History Tour offers a unique view of the city from the waterway that allowed a small fur trading post to become a metropolis. 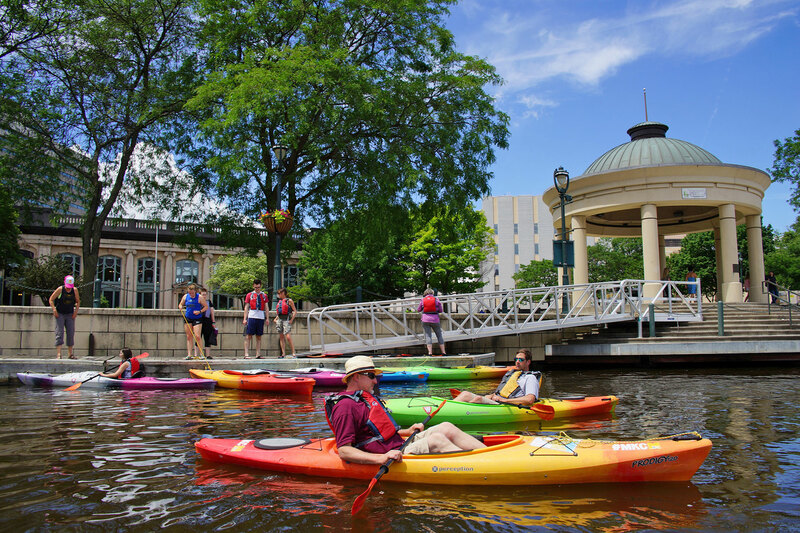 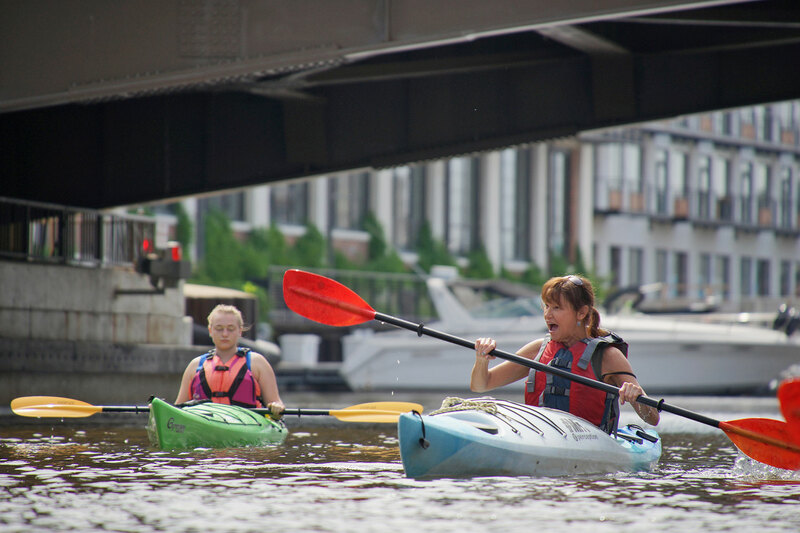 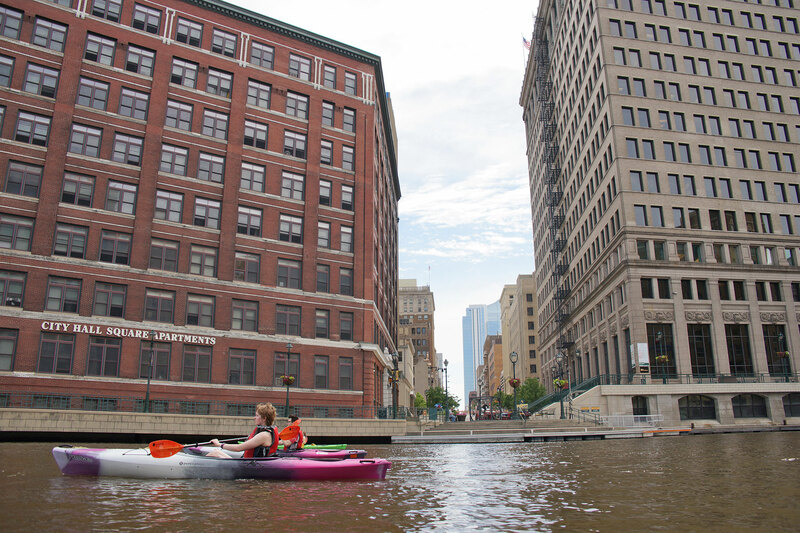 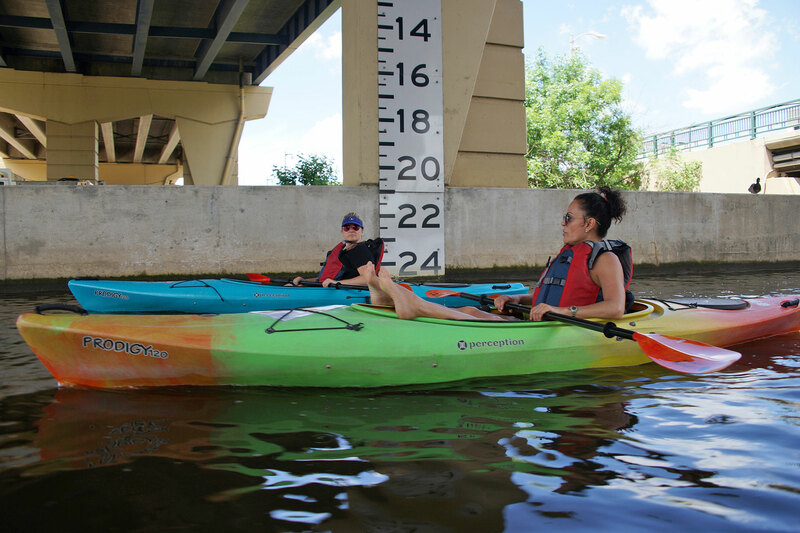 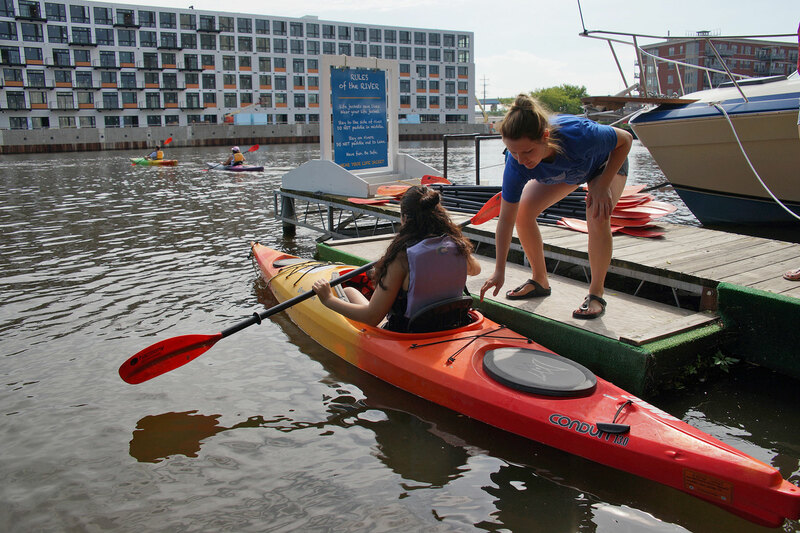 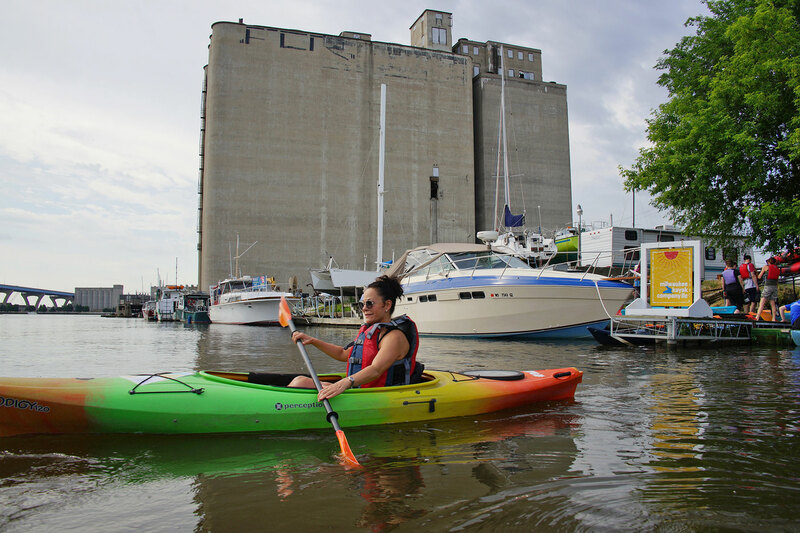 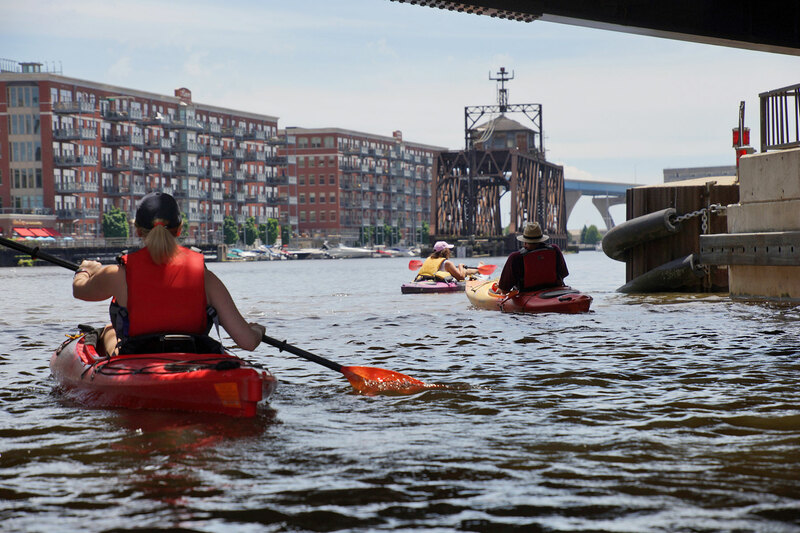 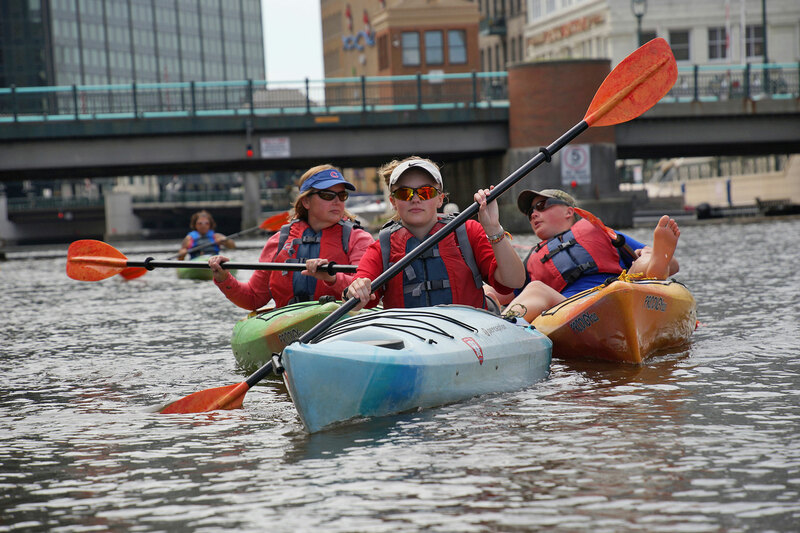 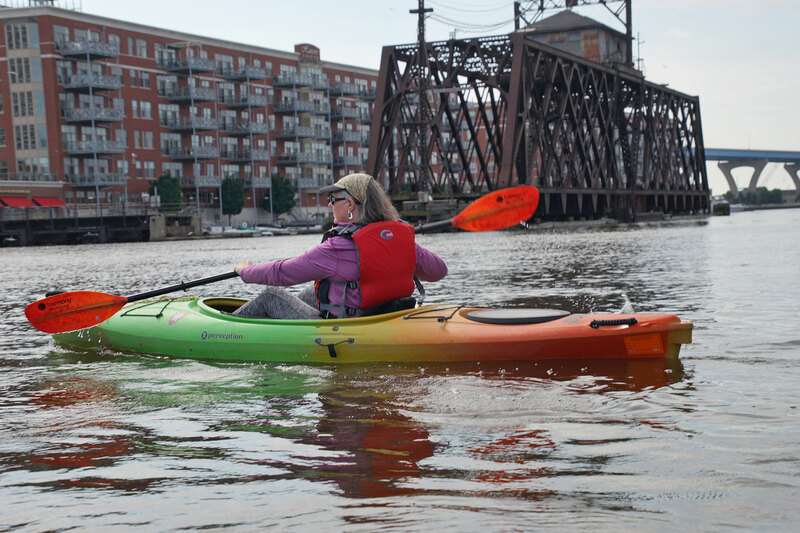 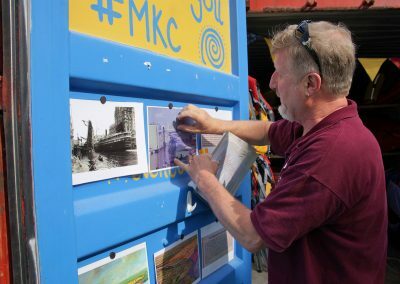 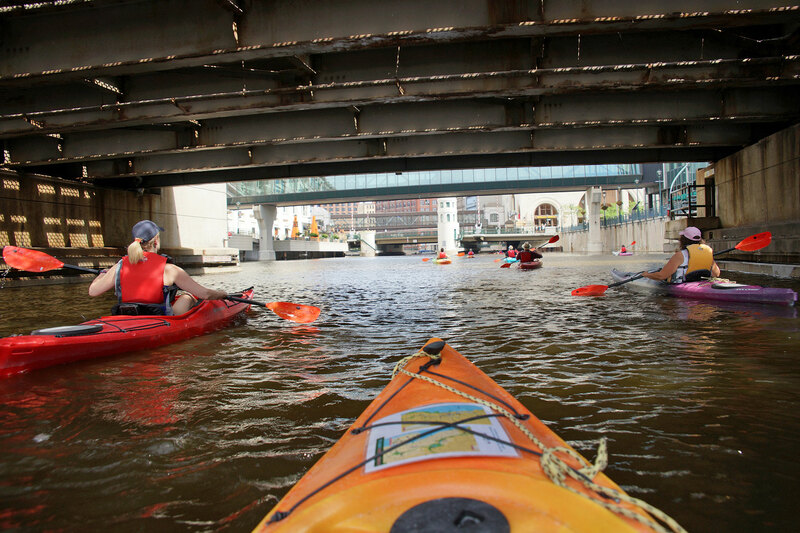 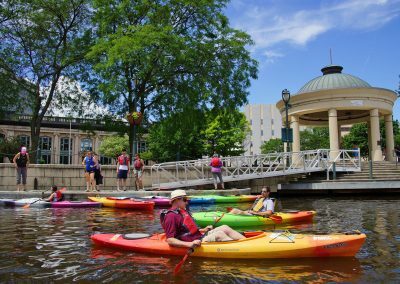 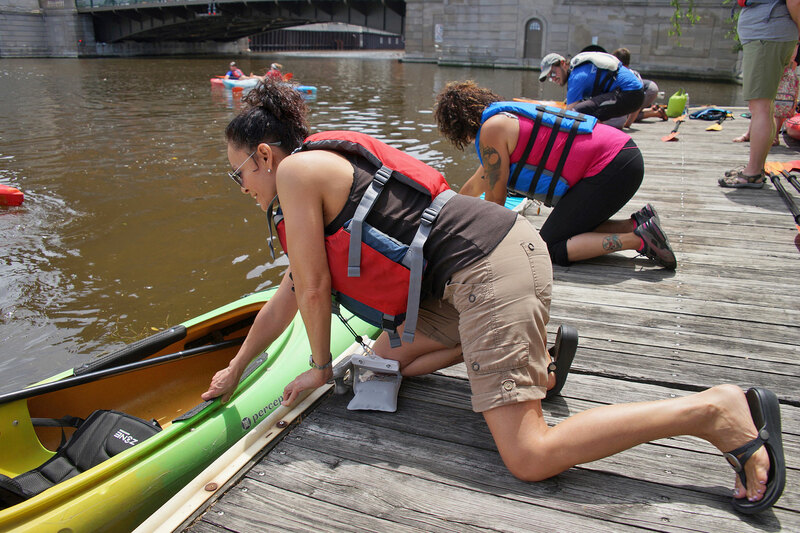 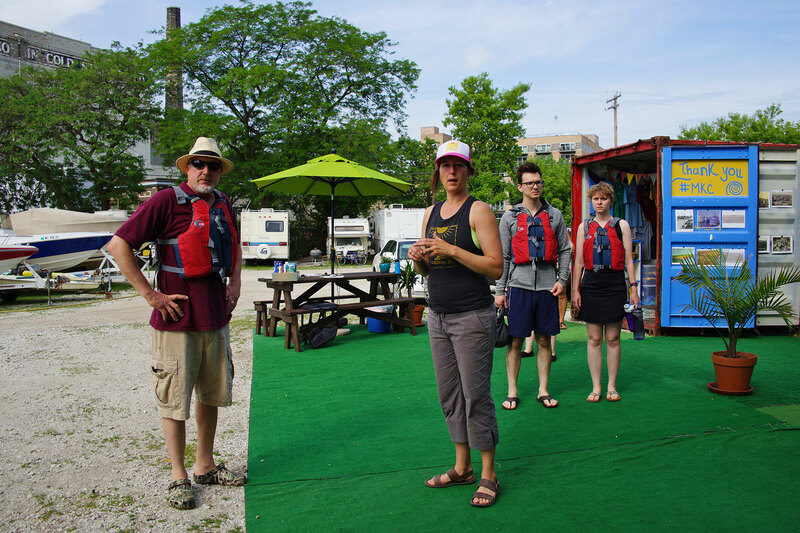 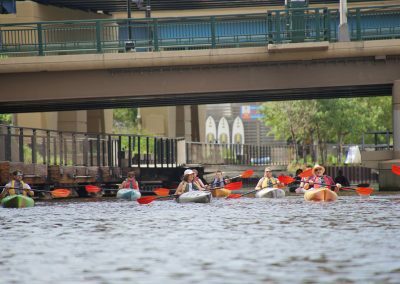 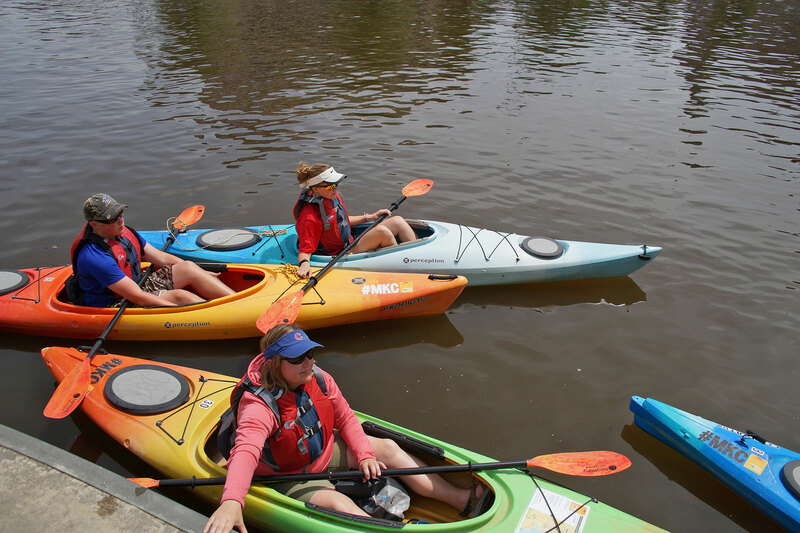 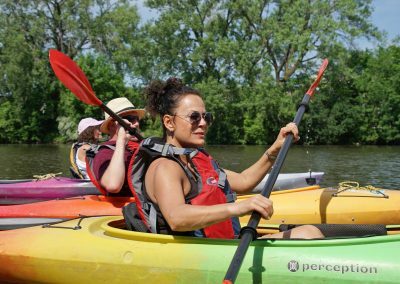 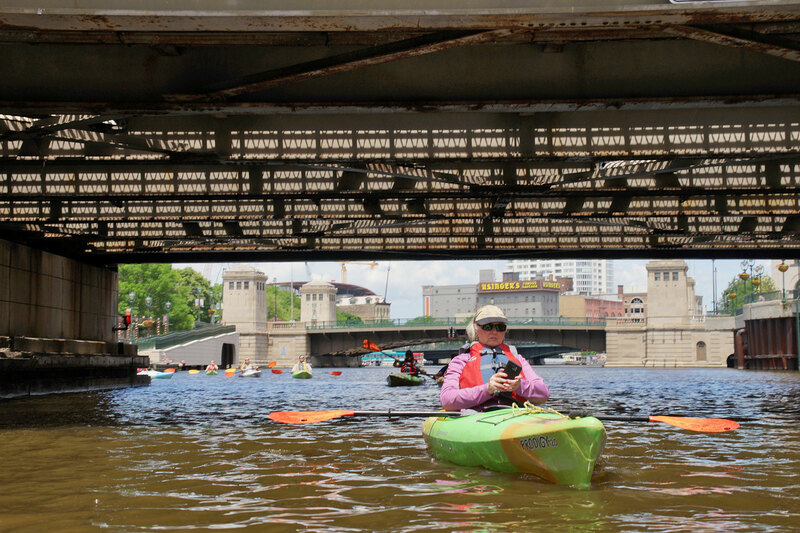 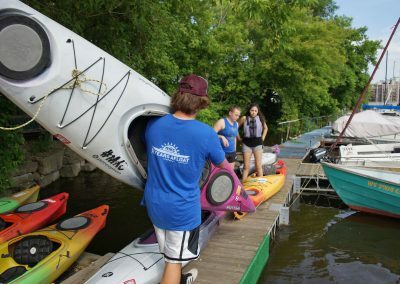 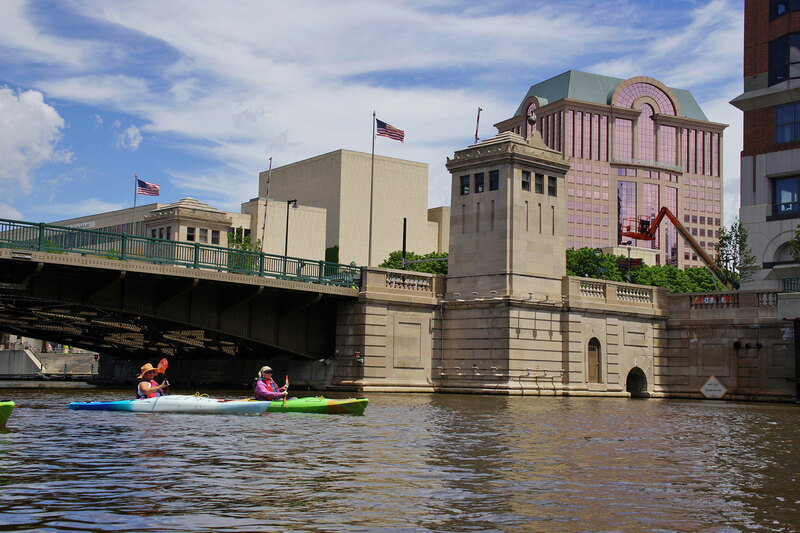 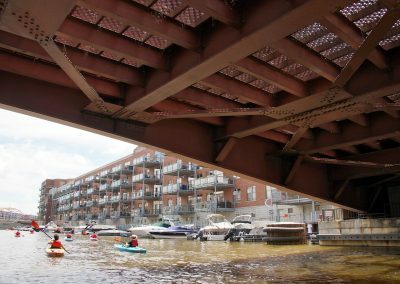 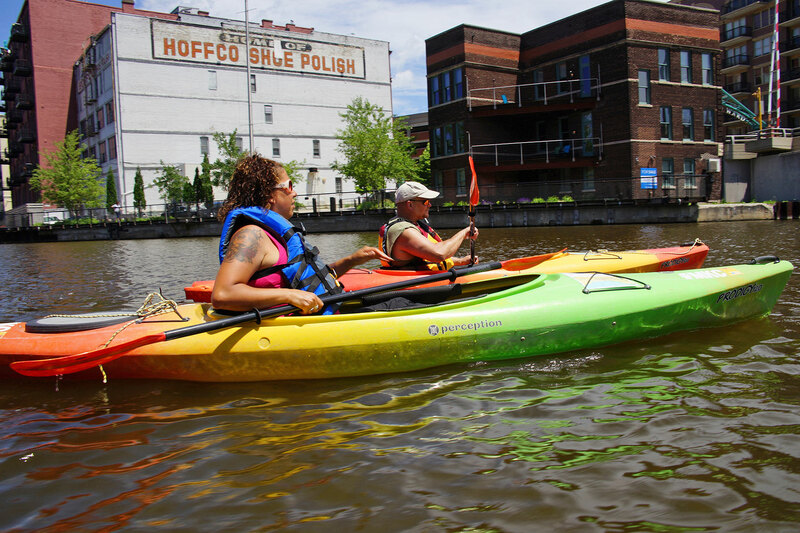 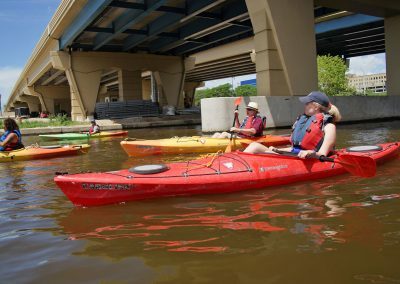 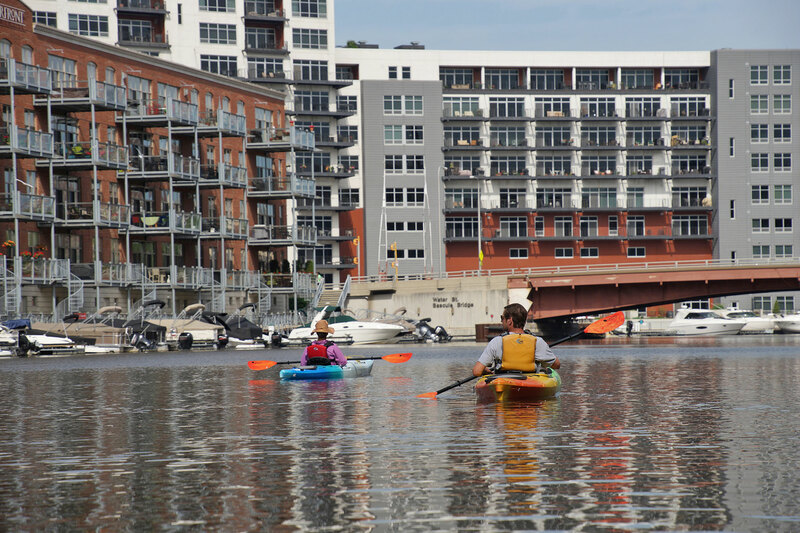 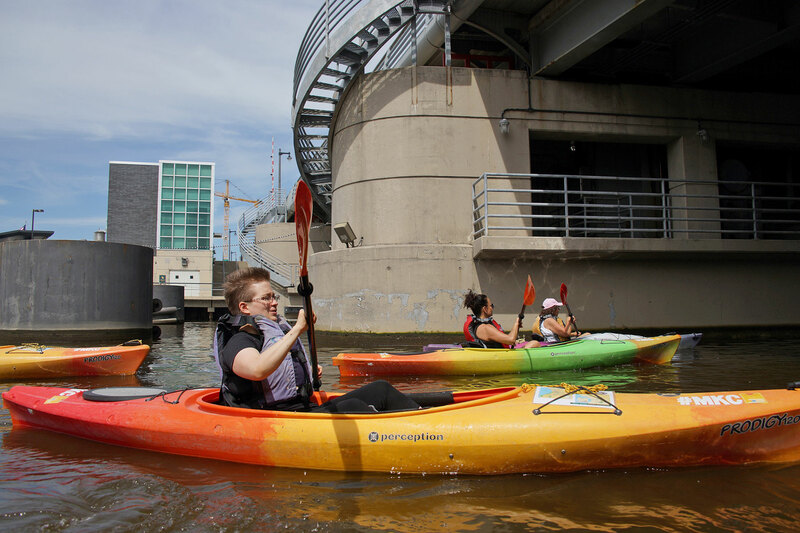 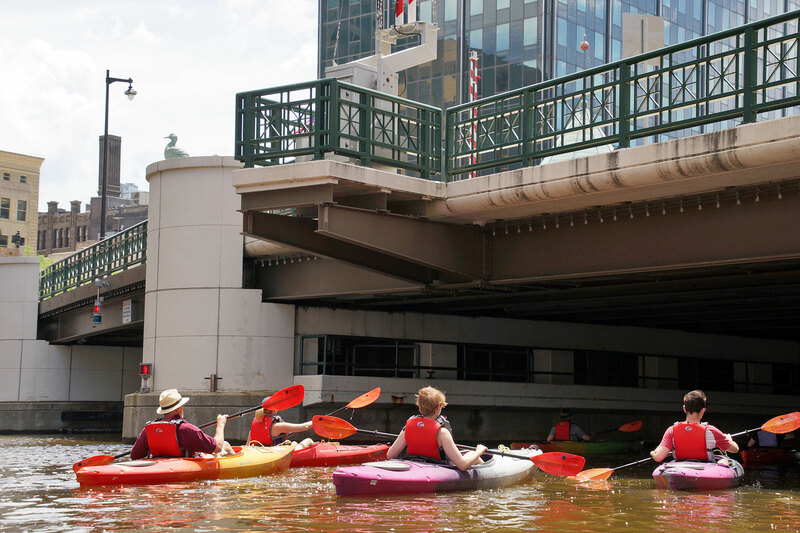 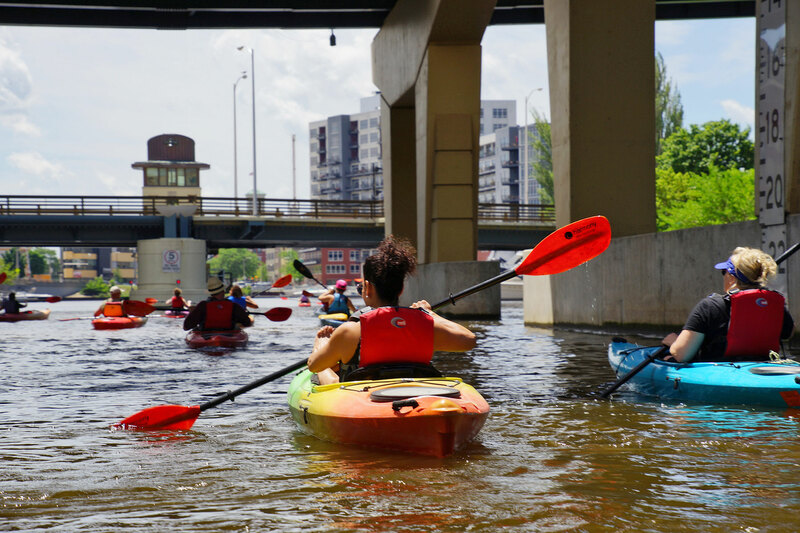 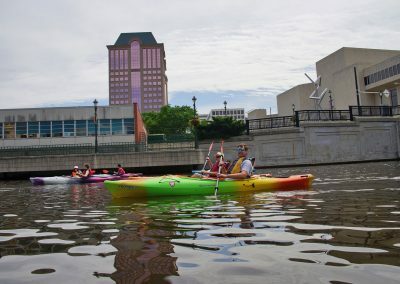 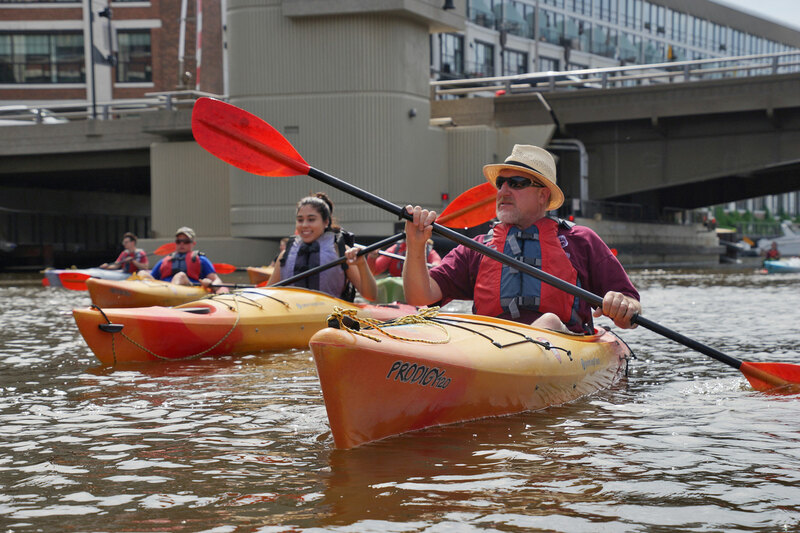 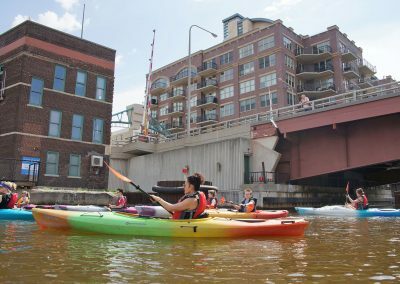 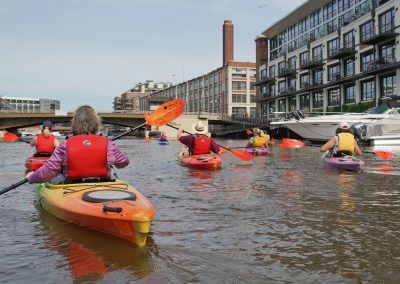 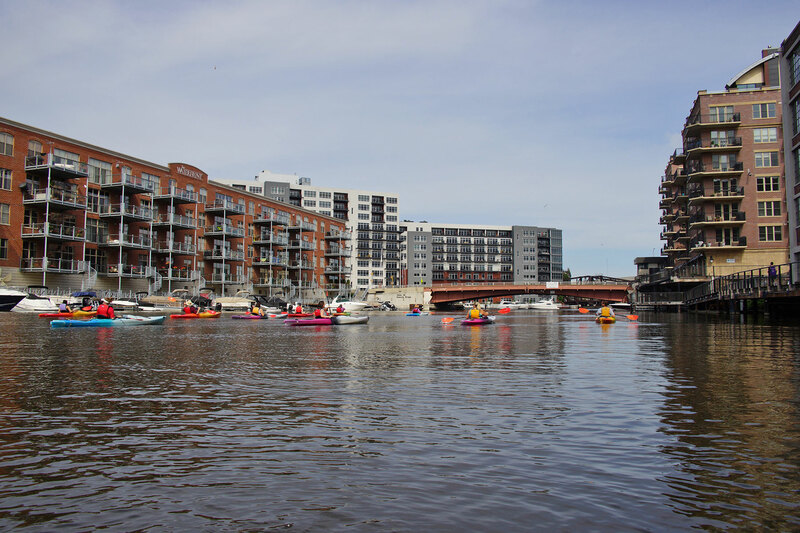 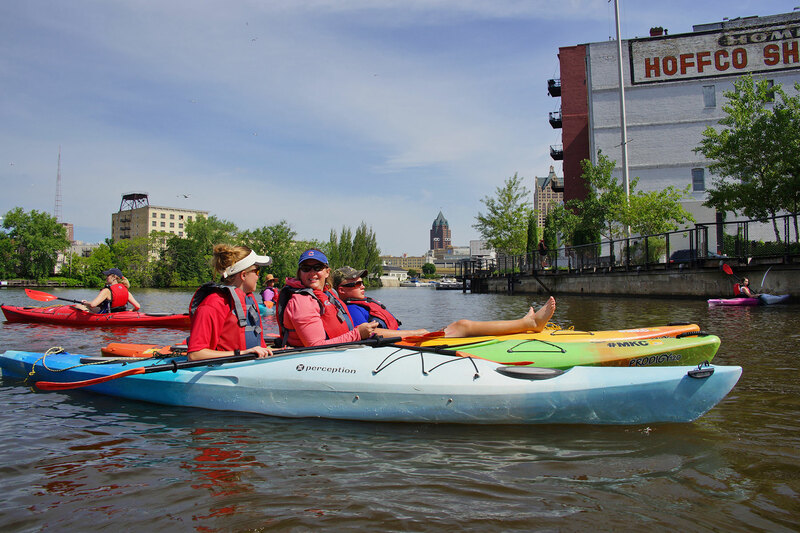 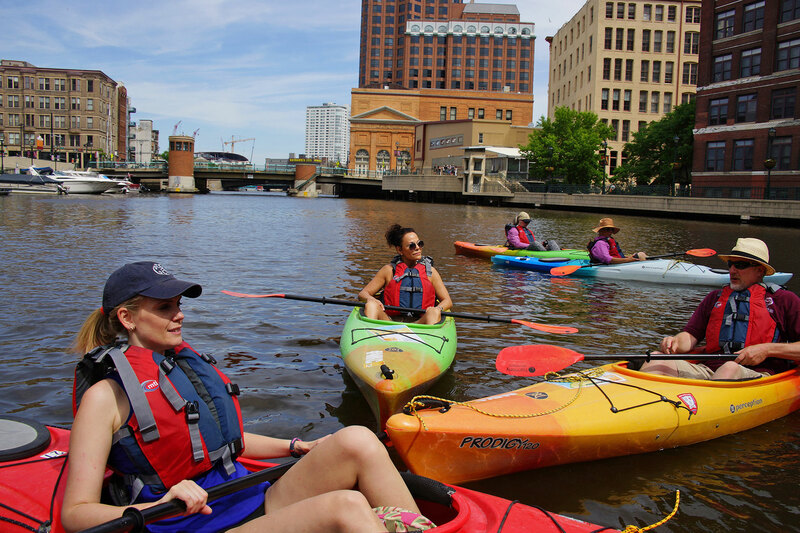 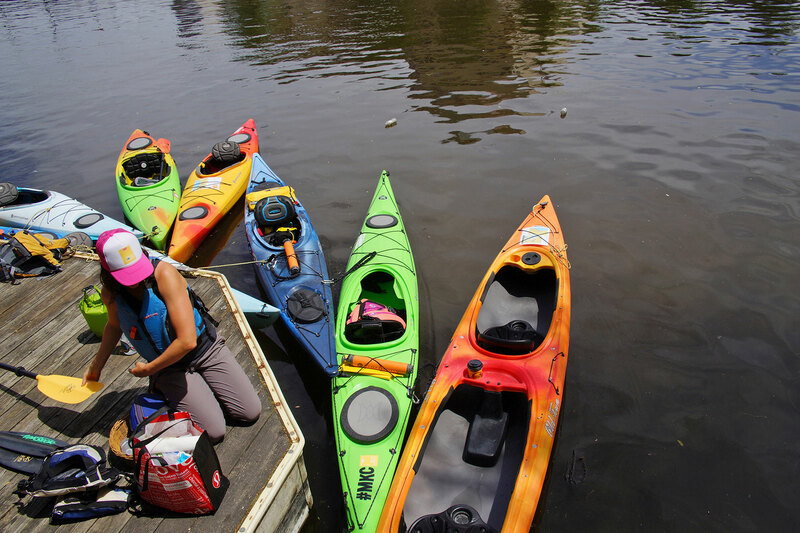 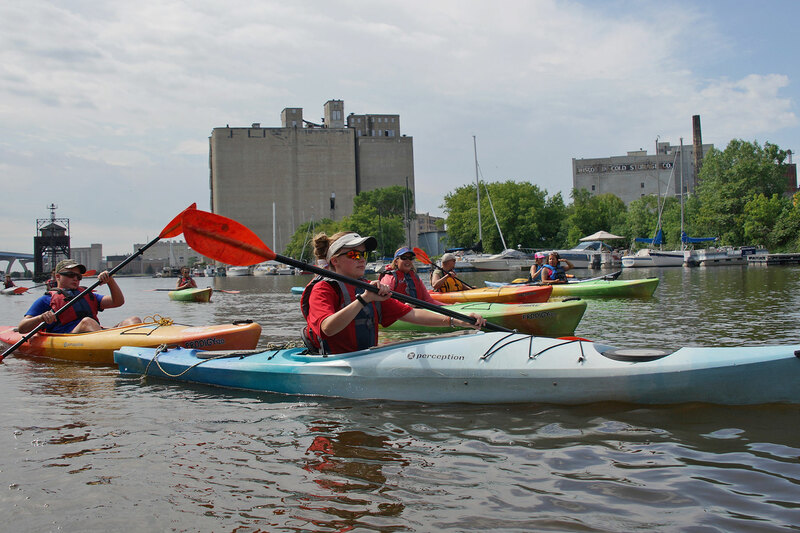 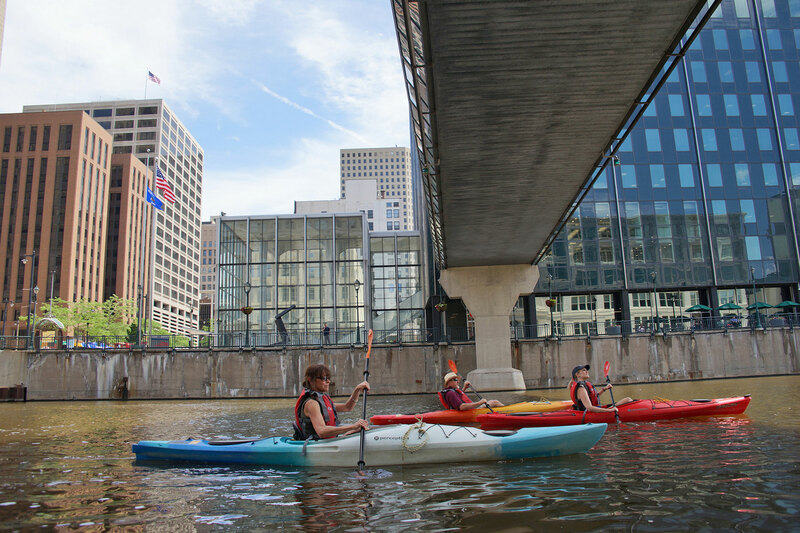 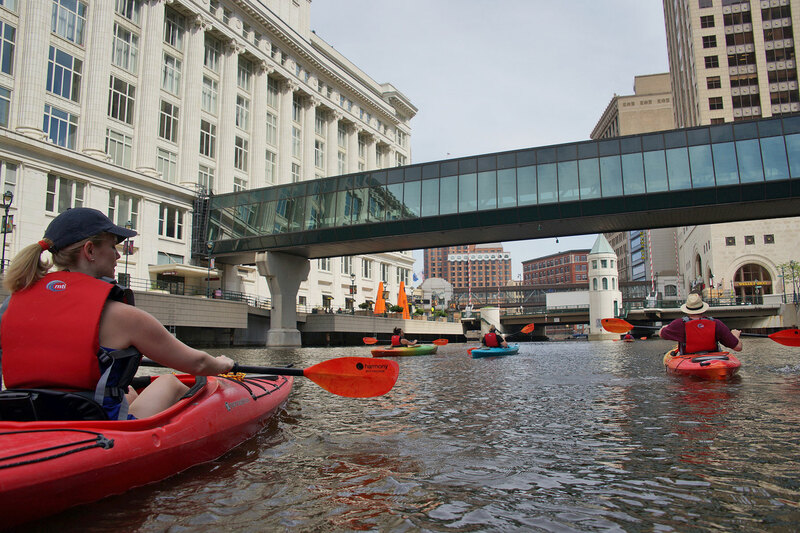 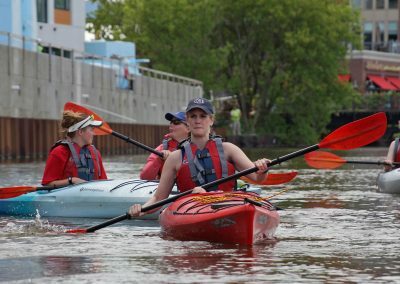 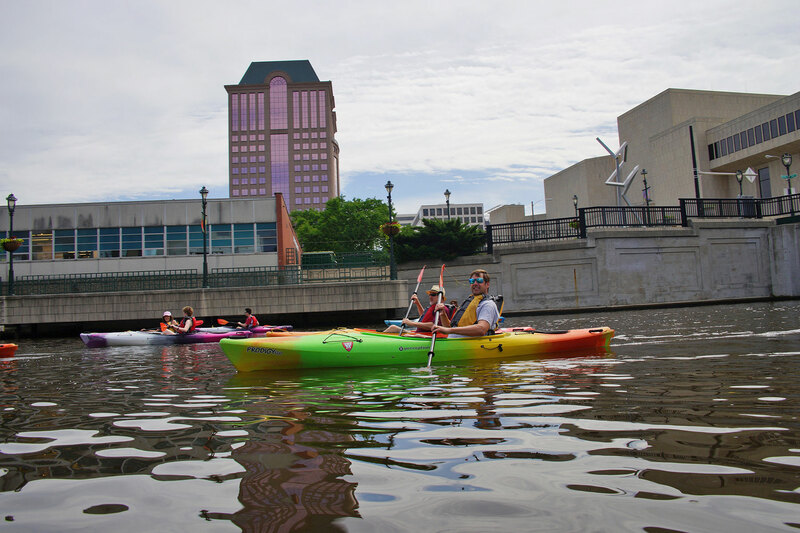 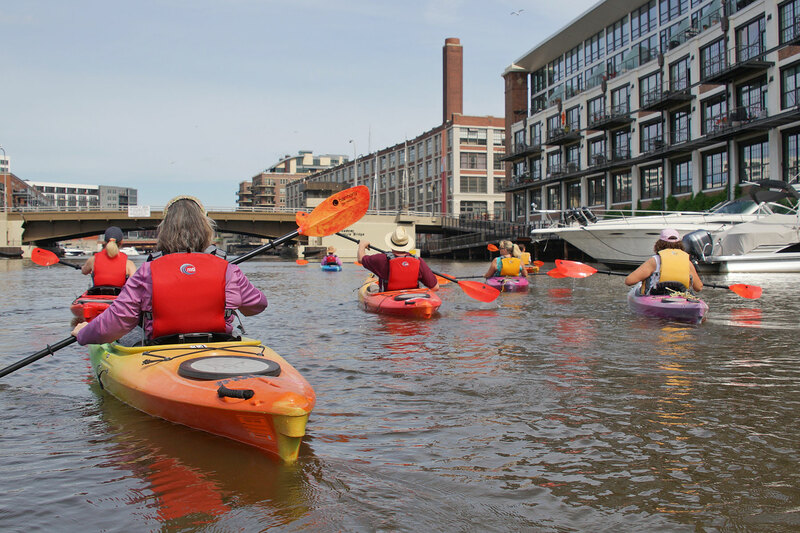 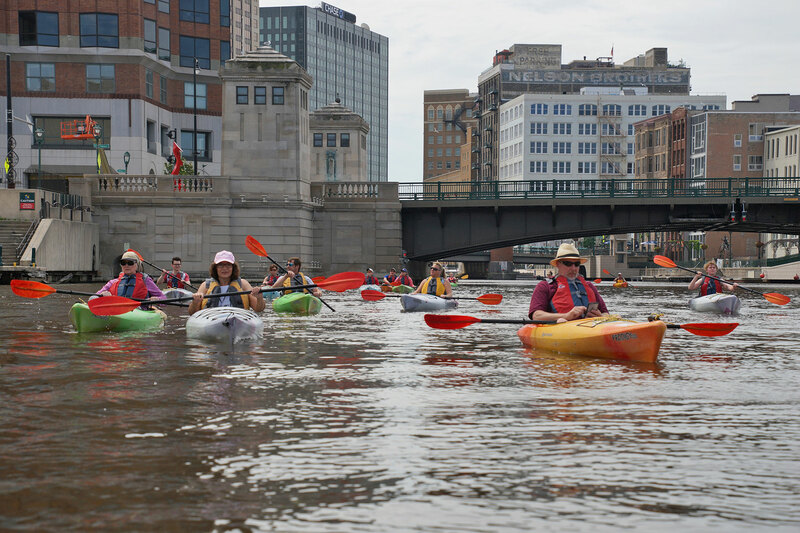 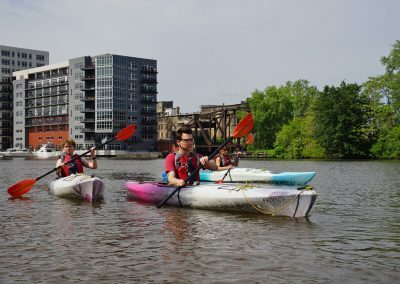 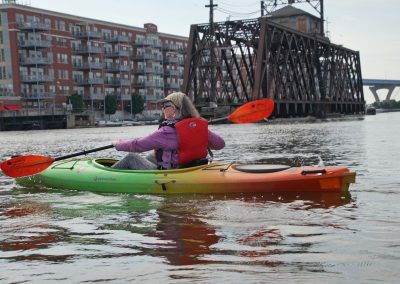 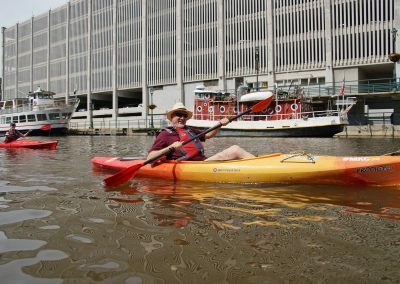 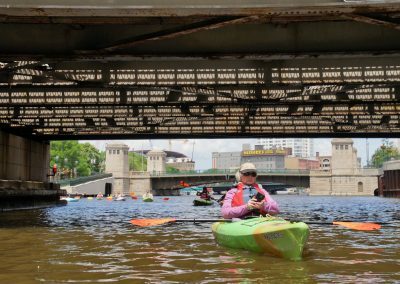 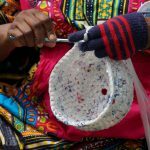 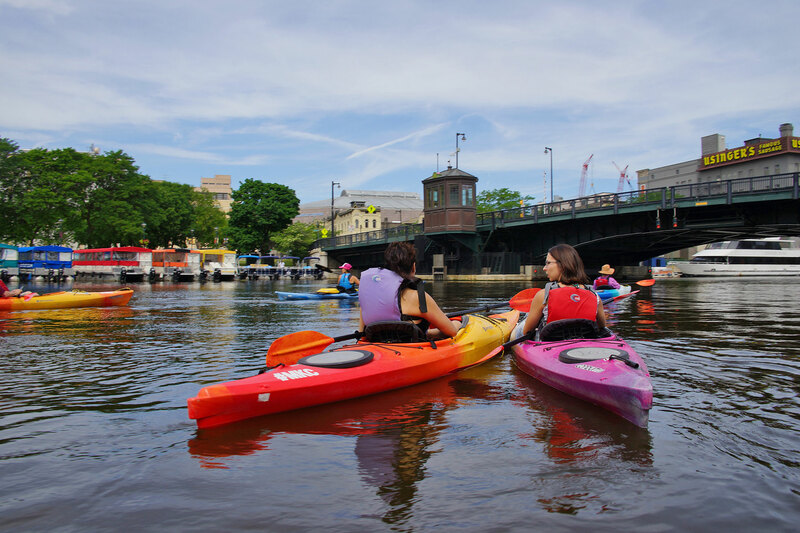 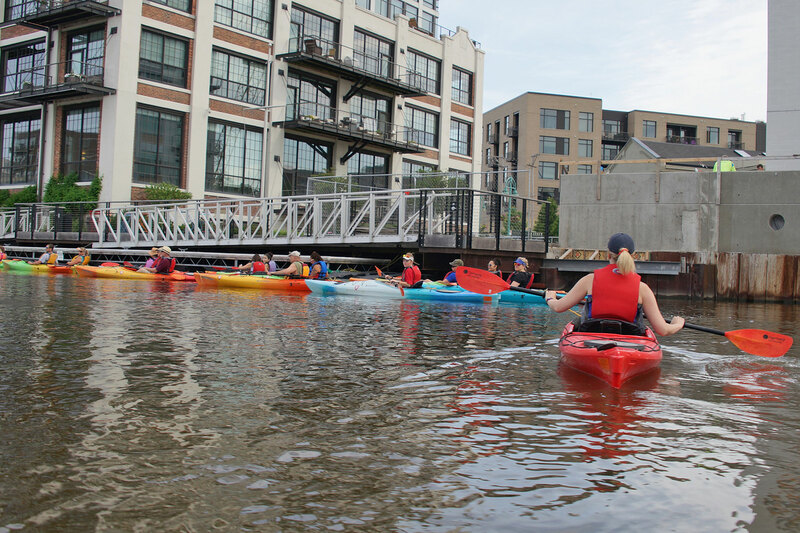 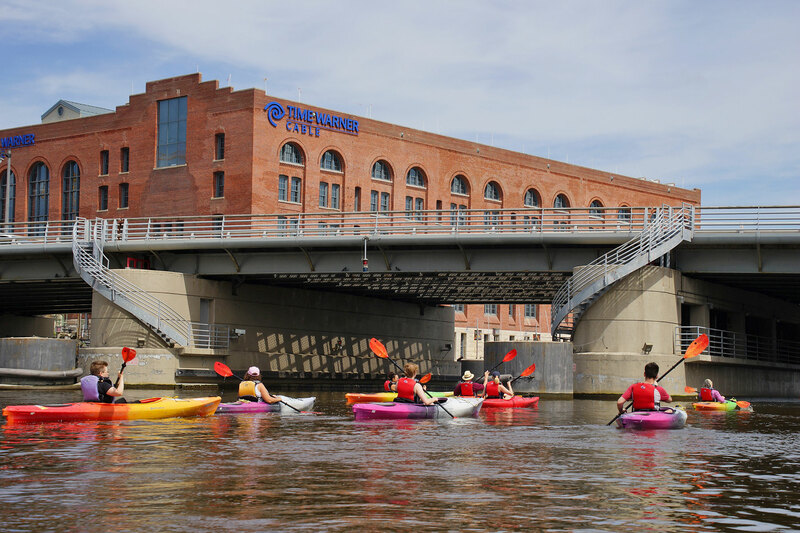 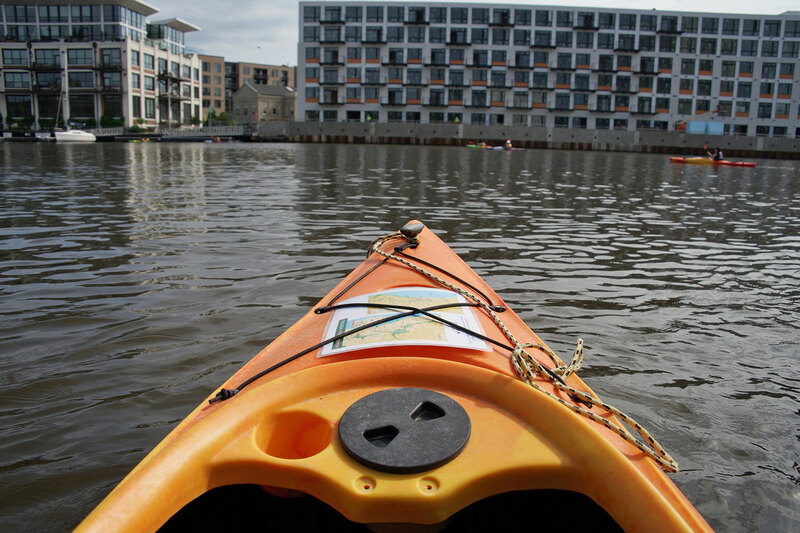 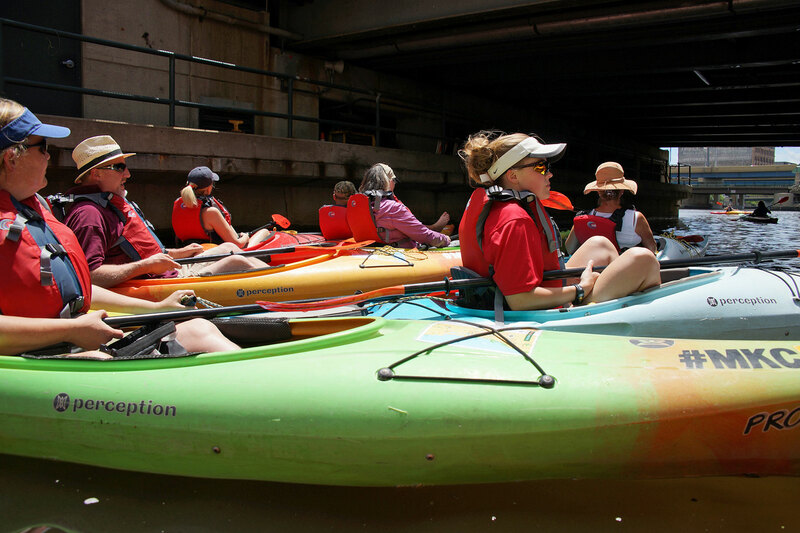 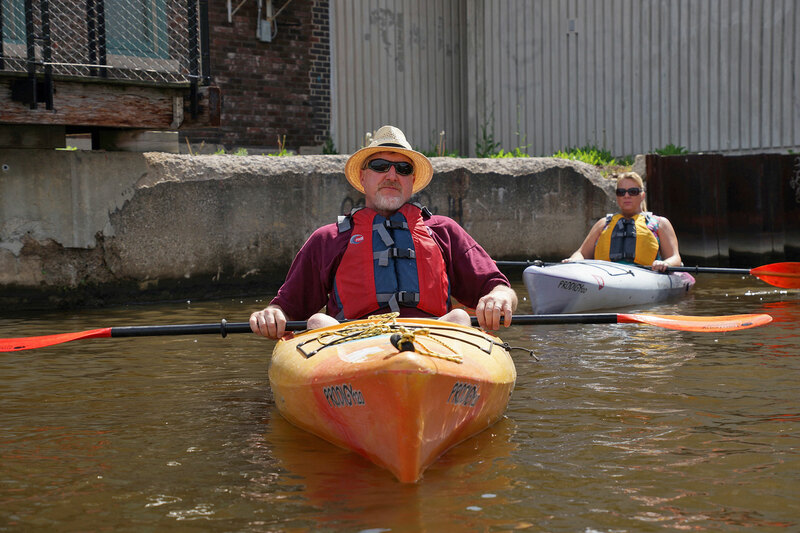 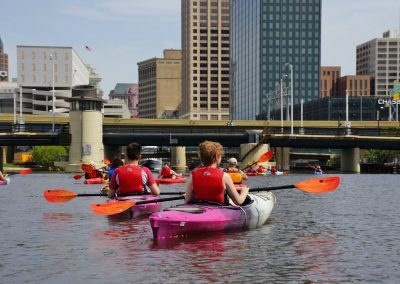 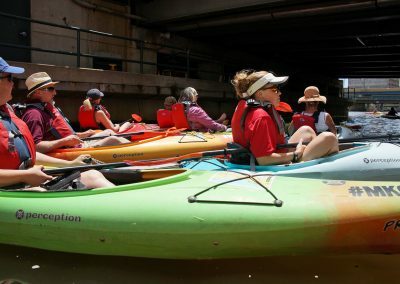 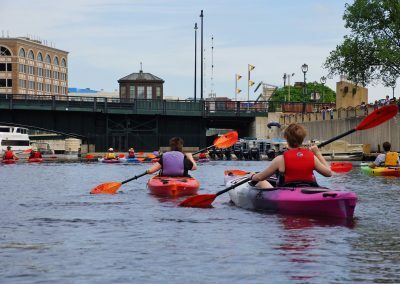 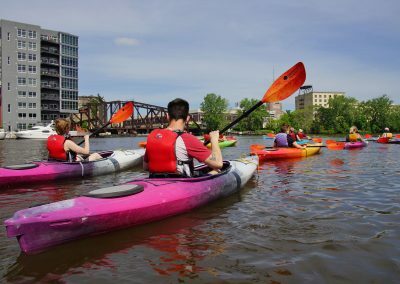 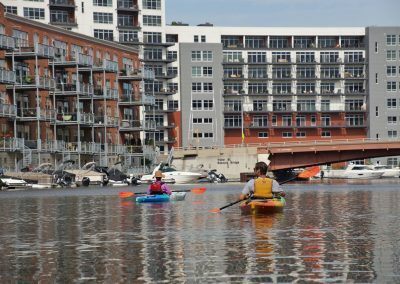 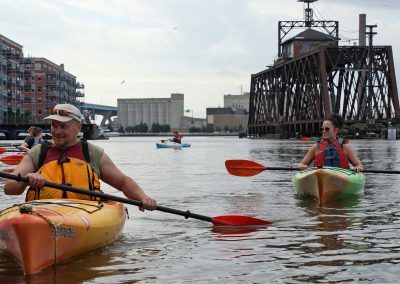 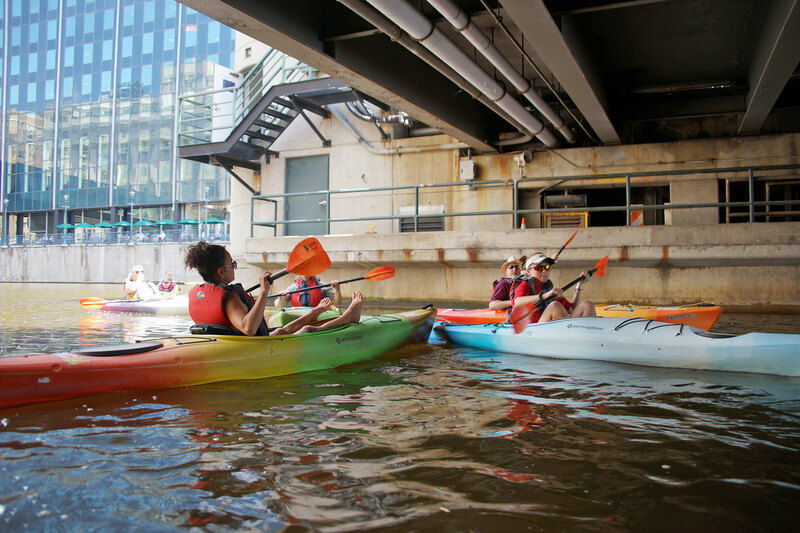 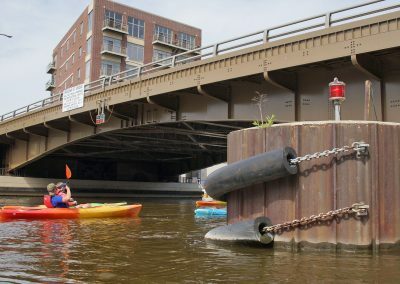 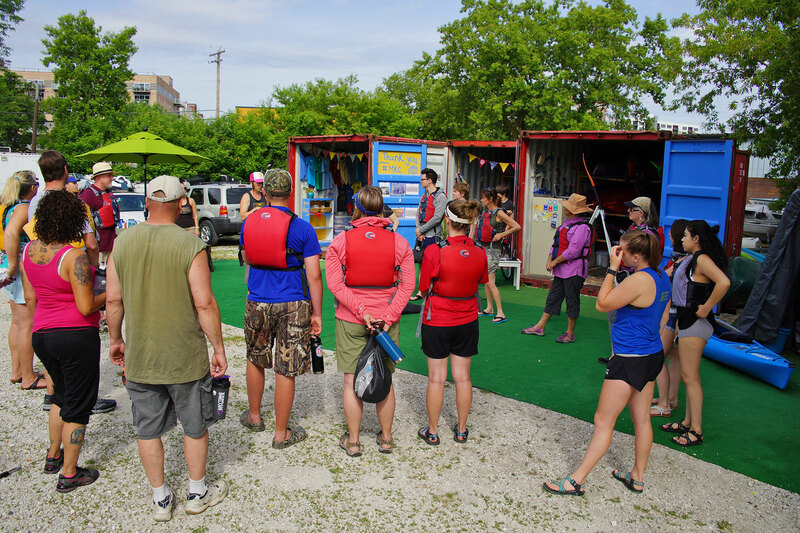 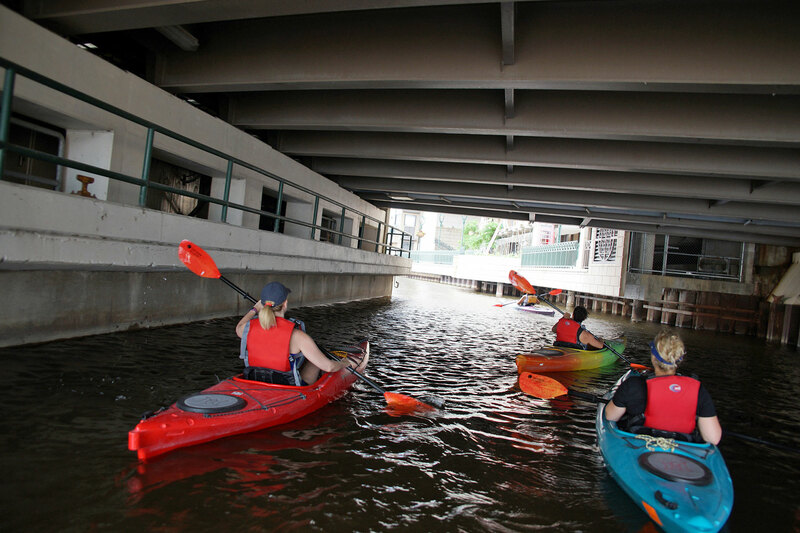 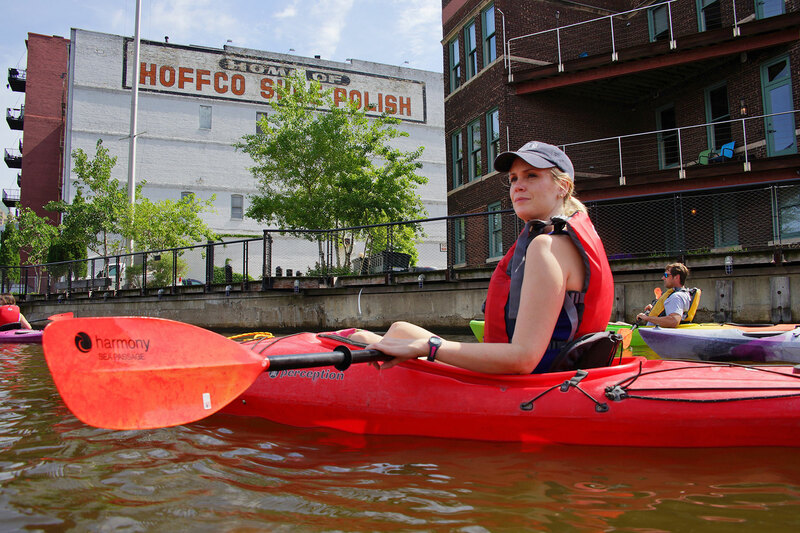 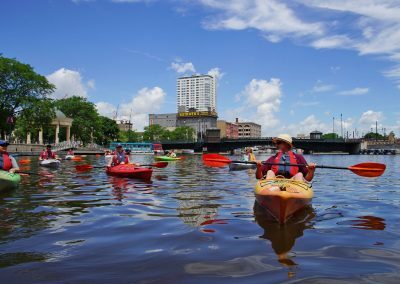 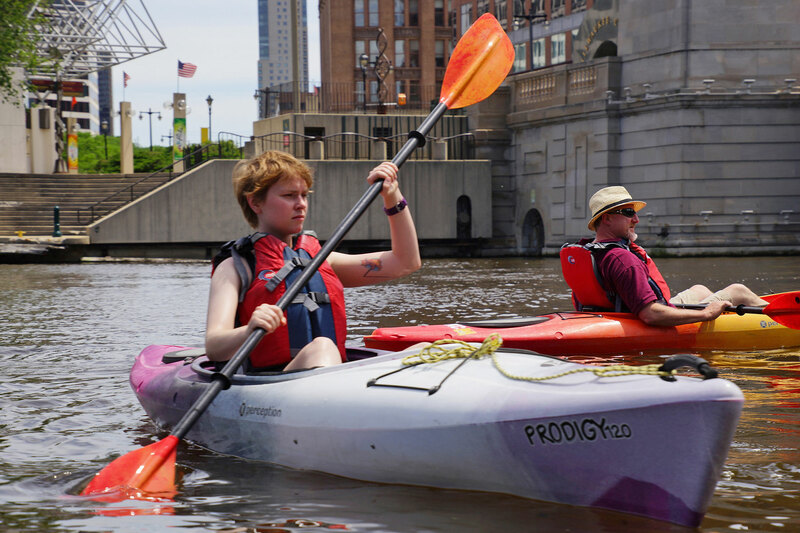 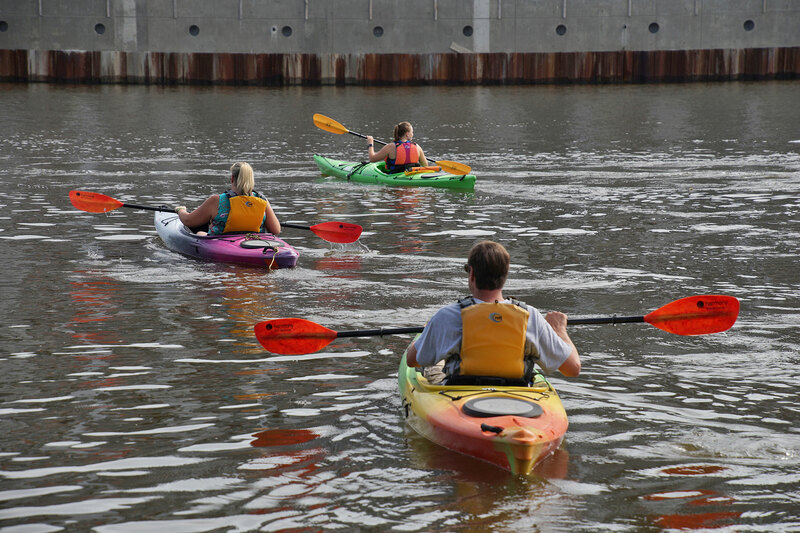 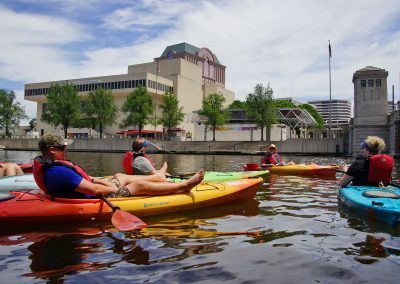 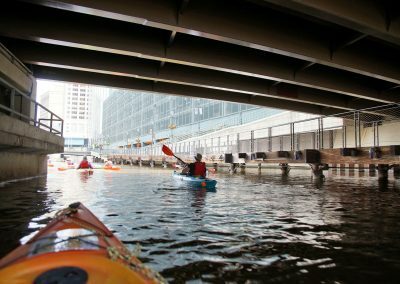 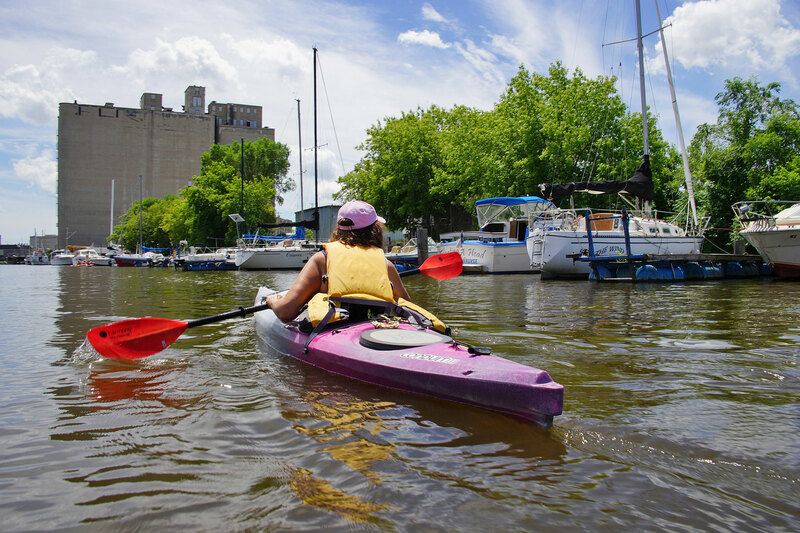 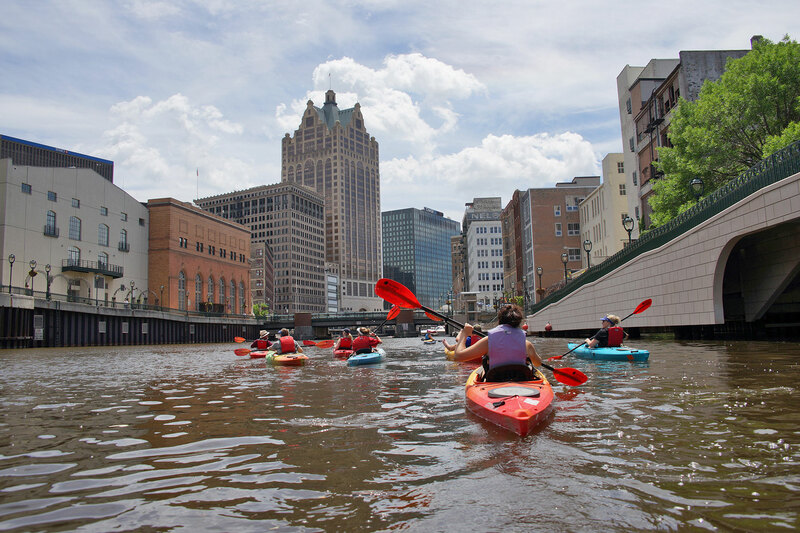 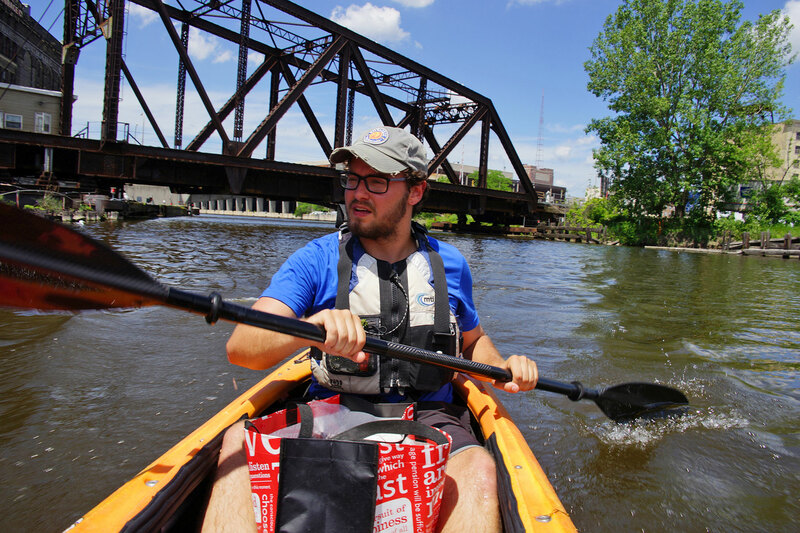 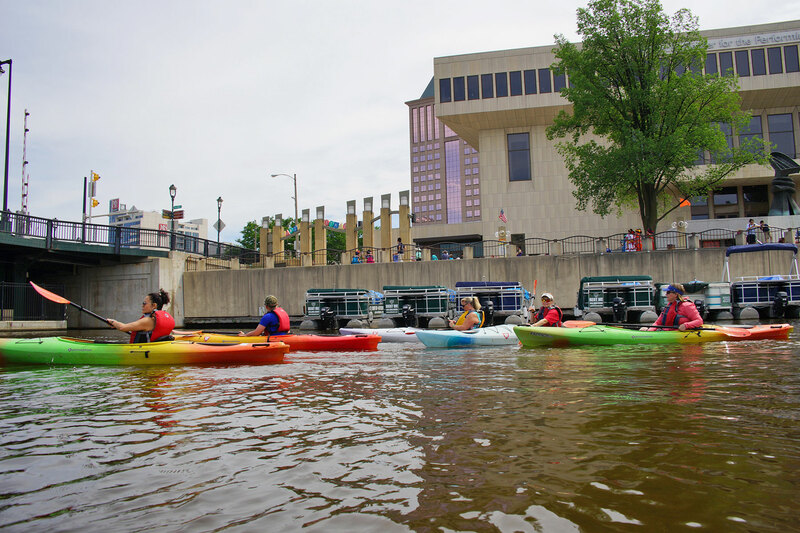 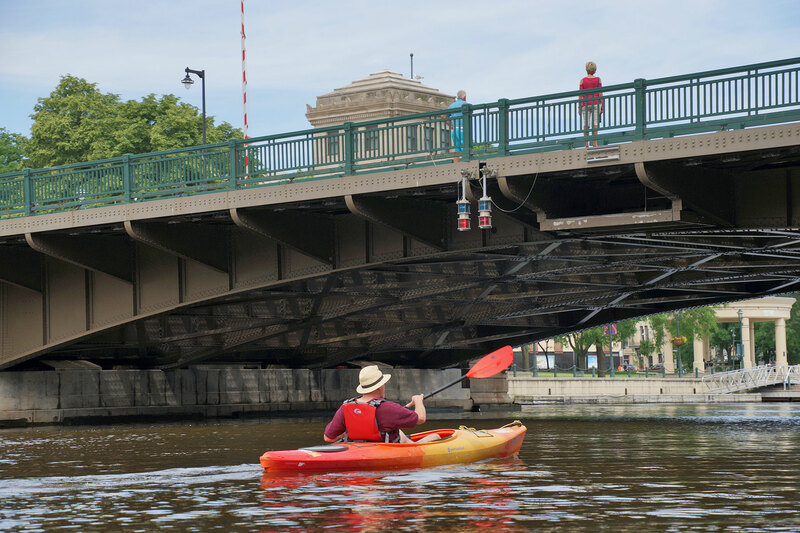 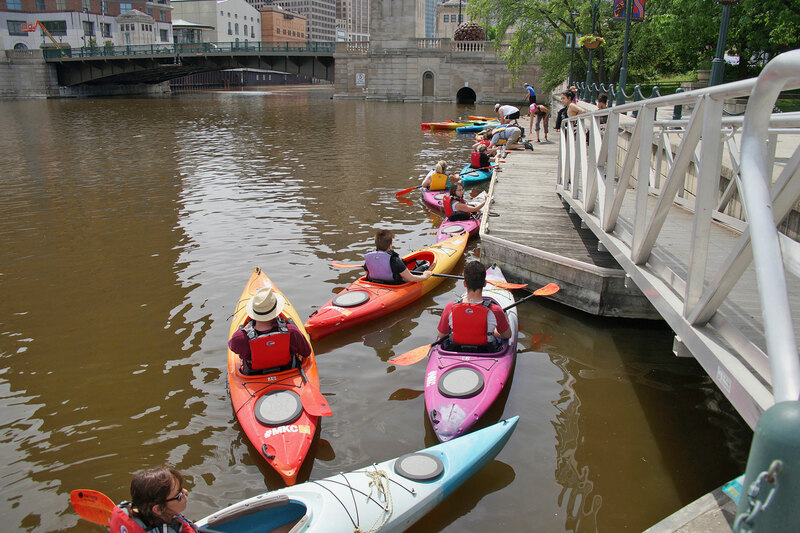 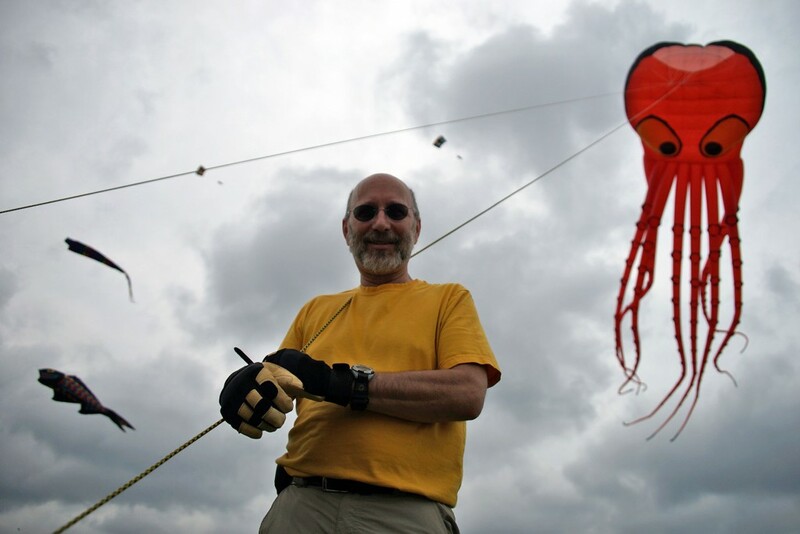 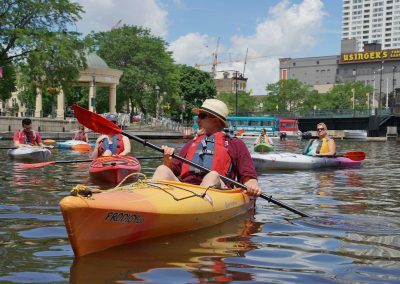 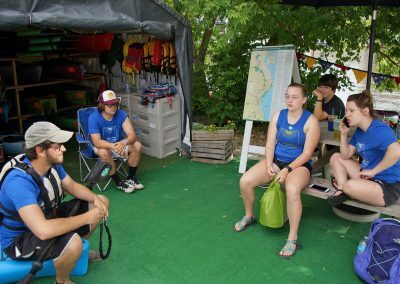 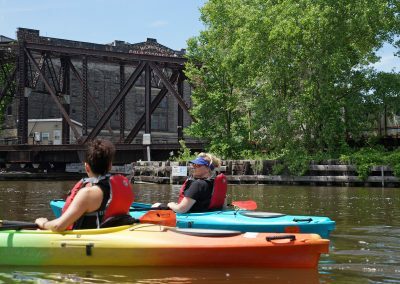 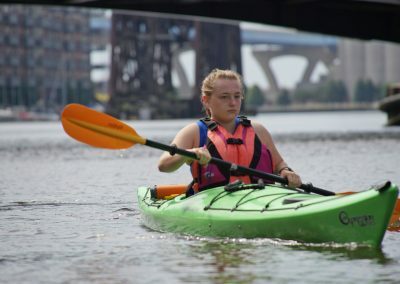 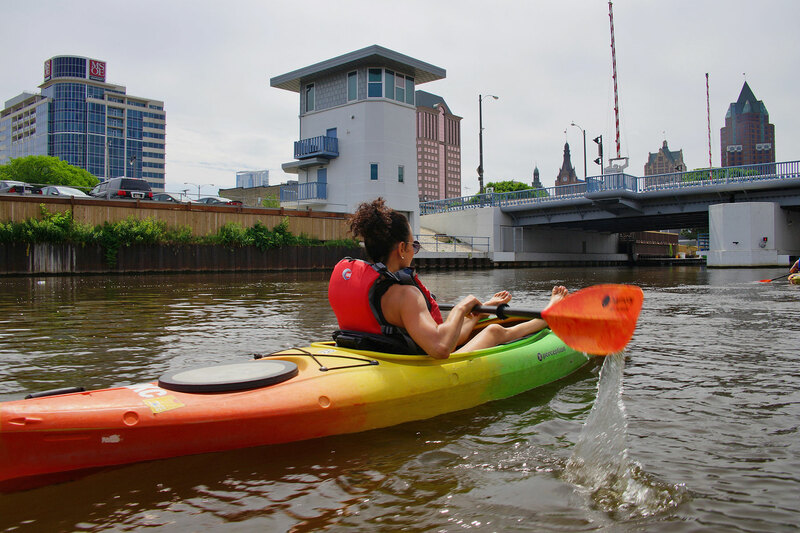 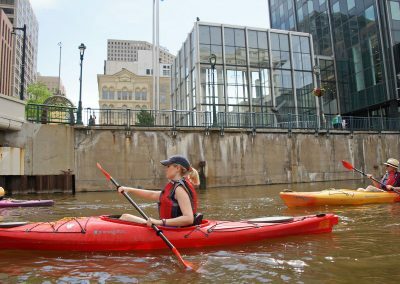 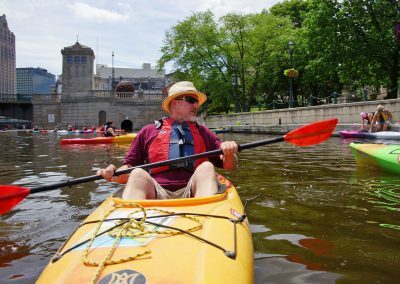 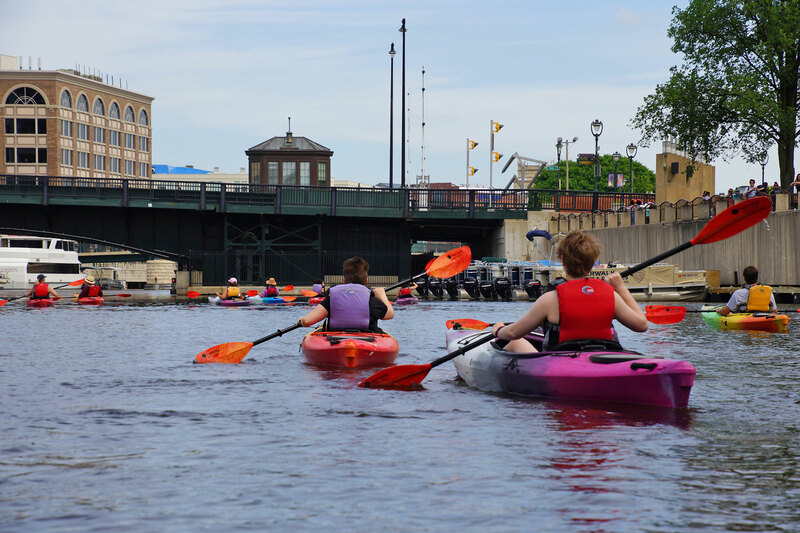 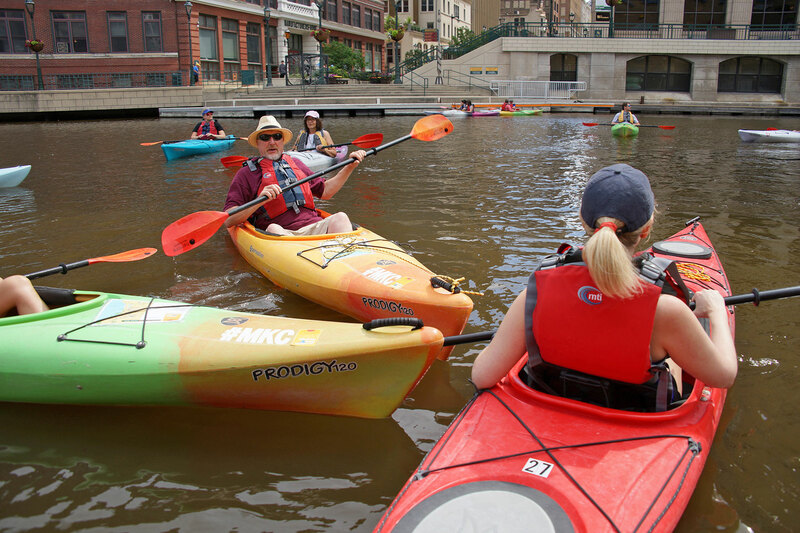 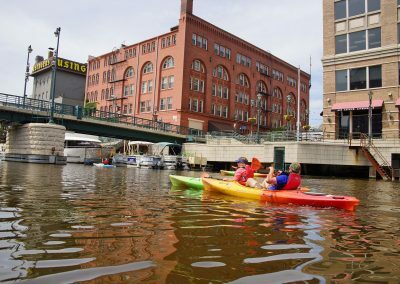 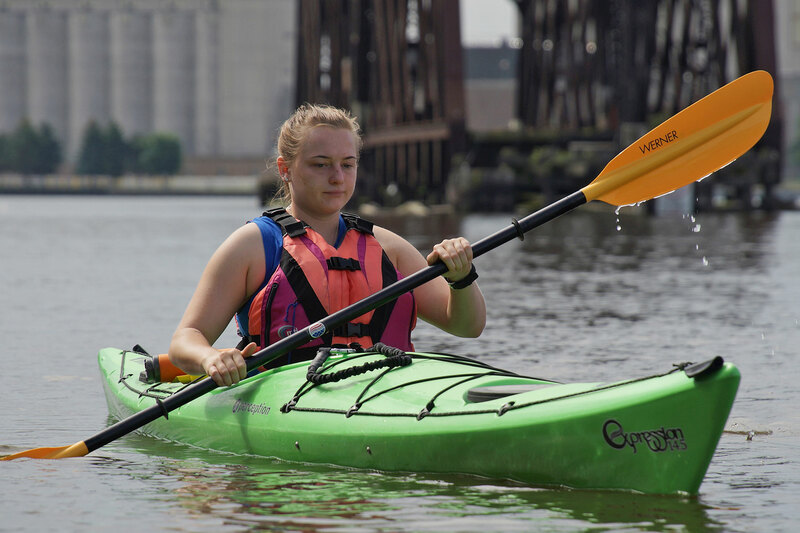 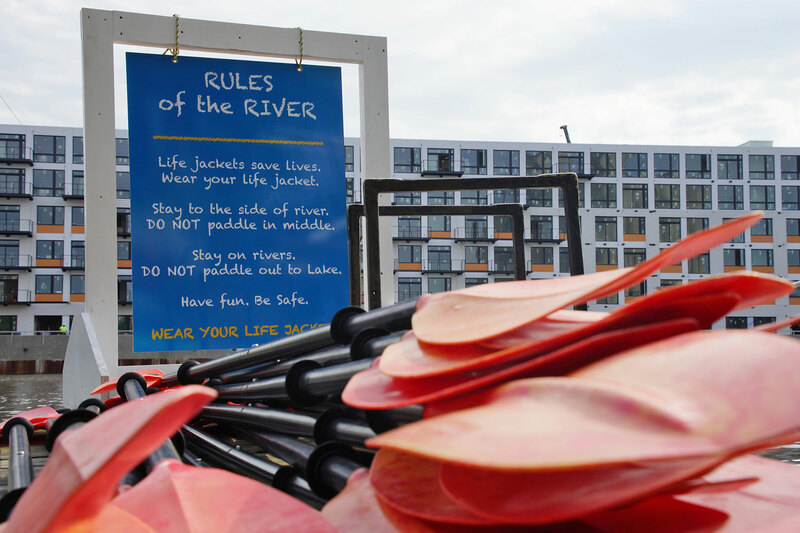 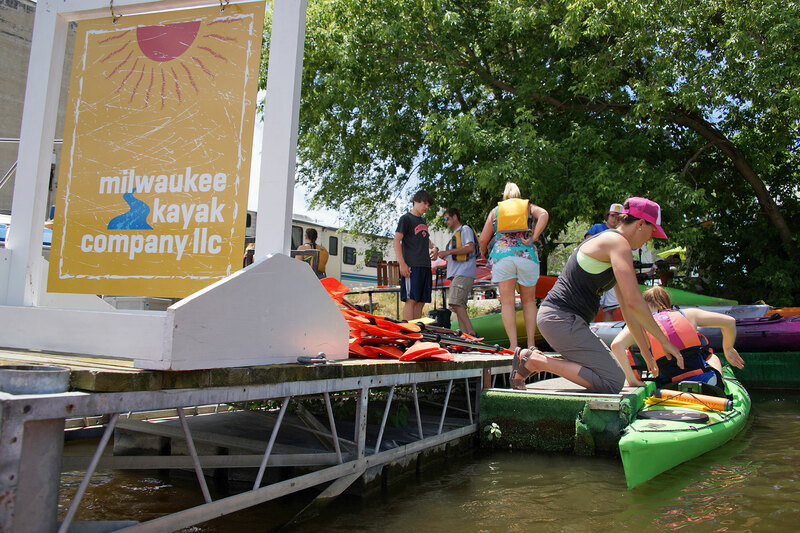 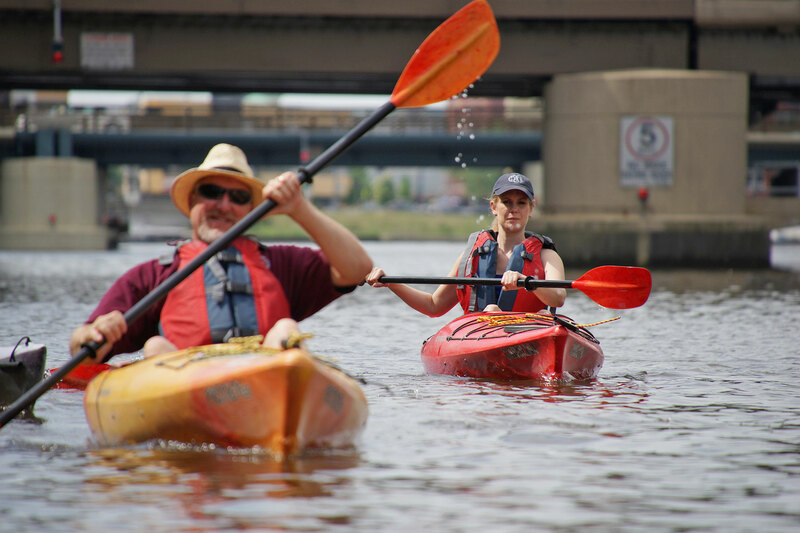 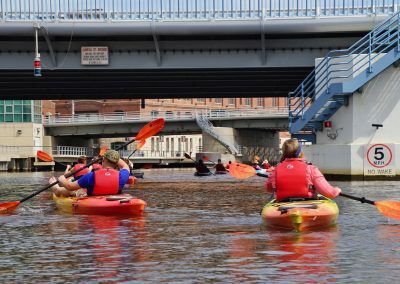 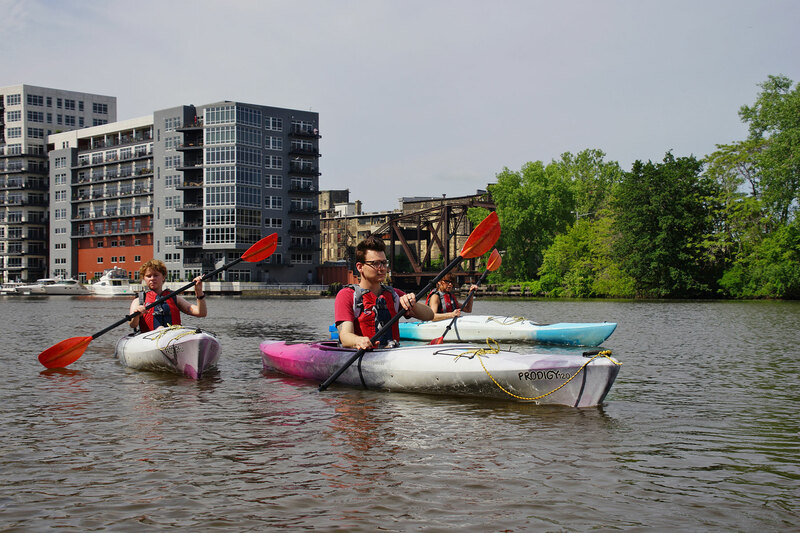 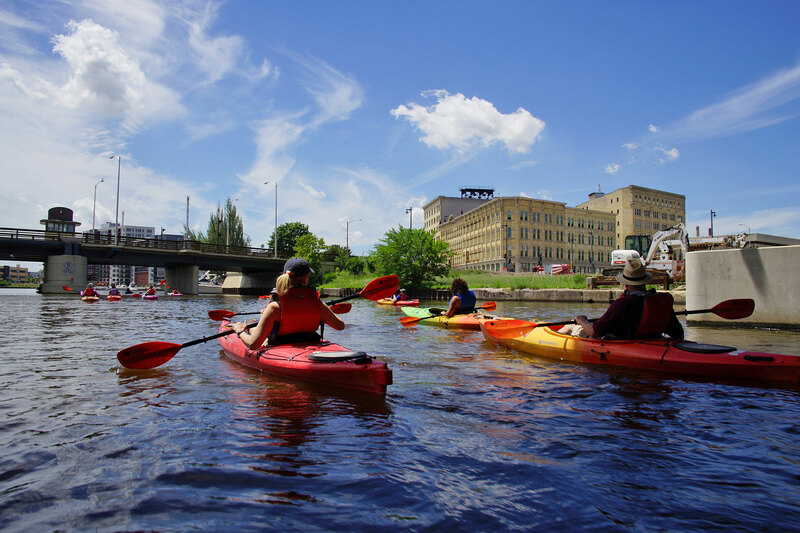 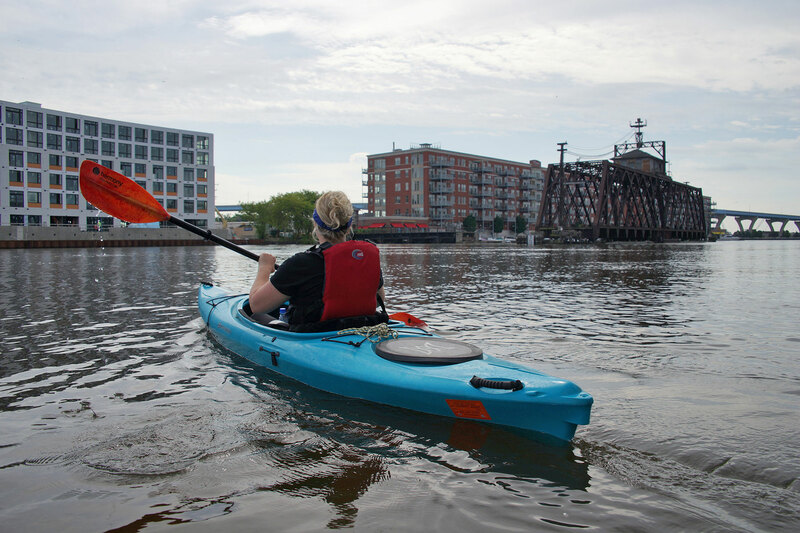 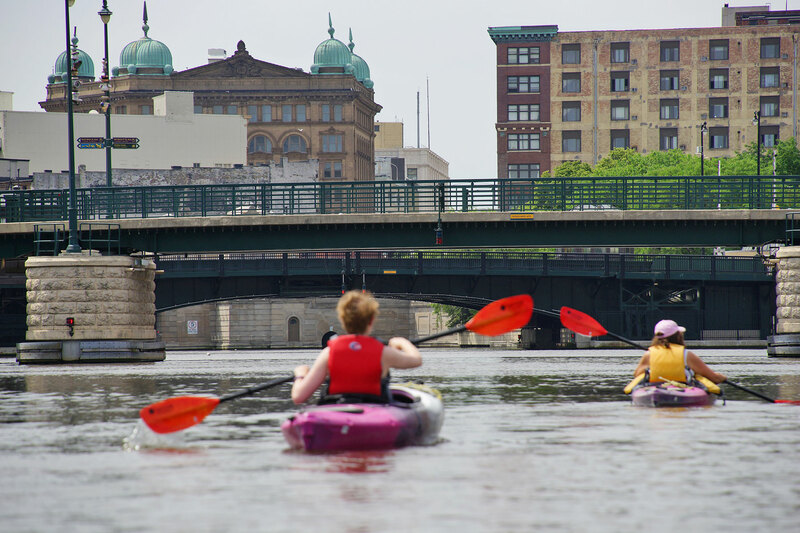 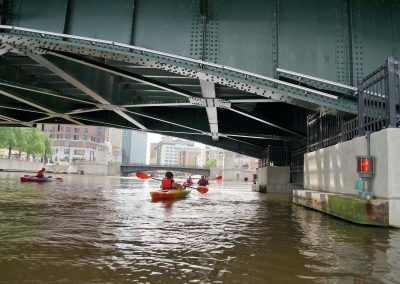 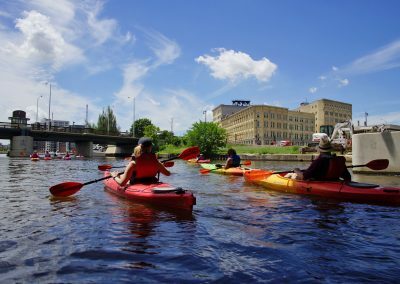 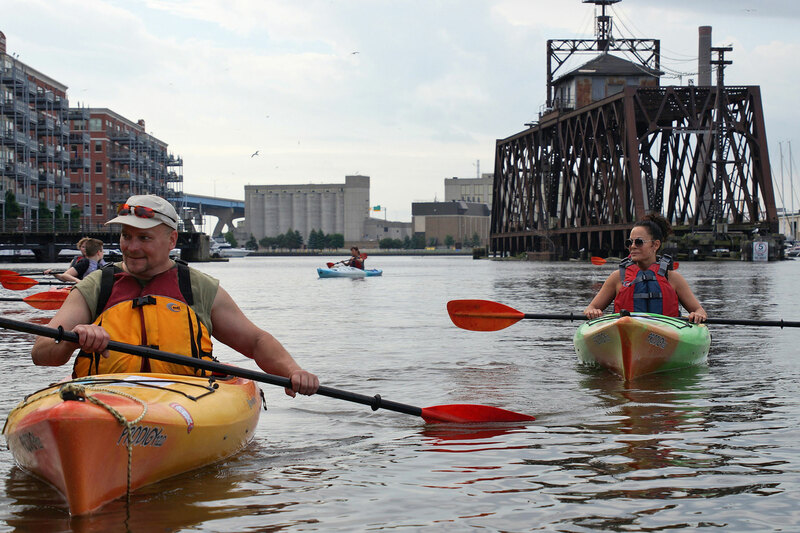 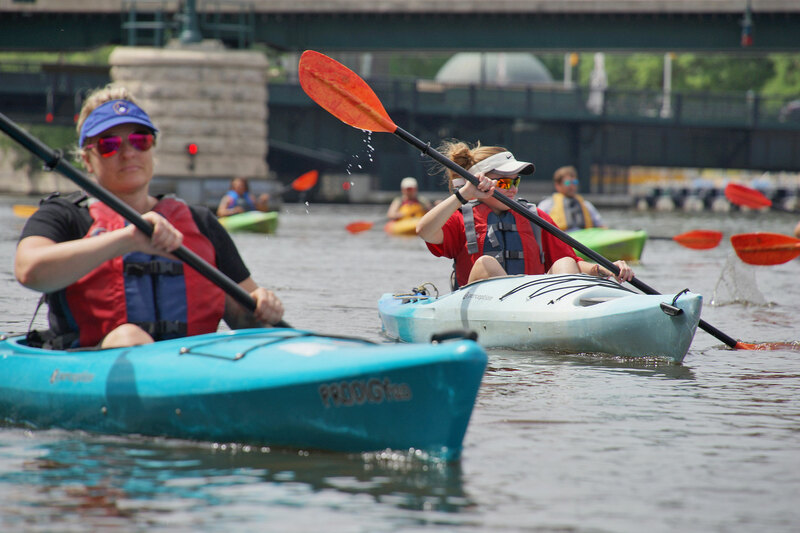 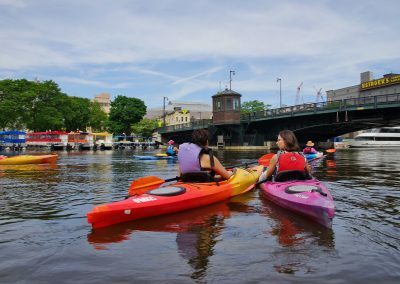 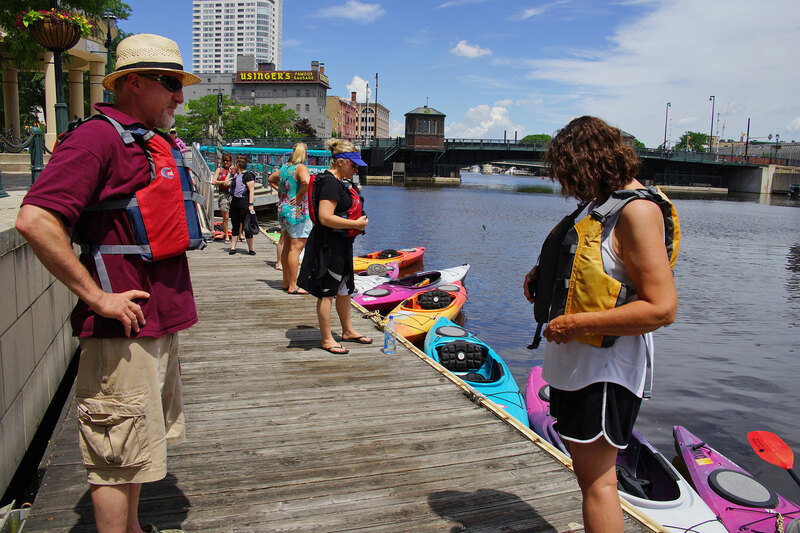 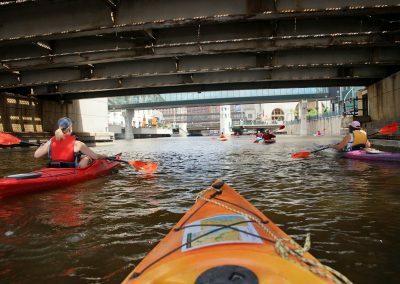 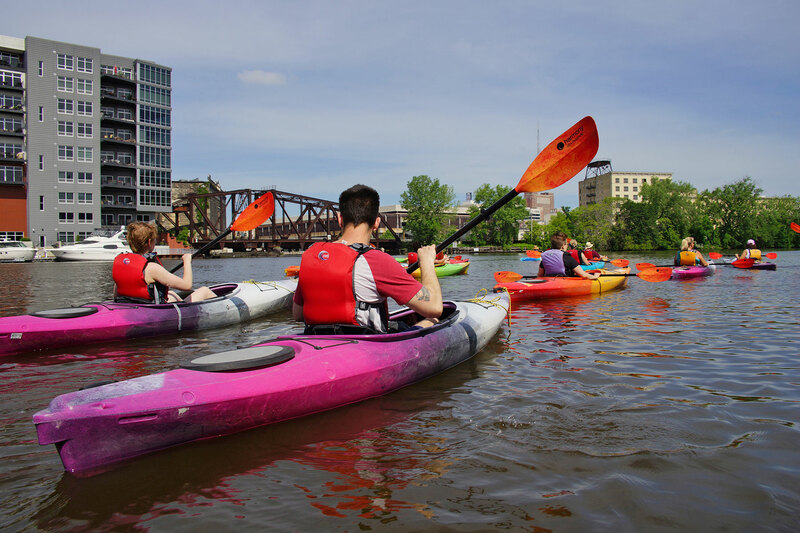 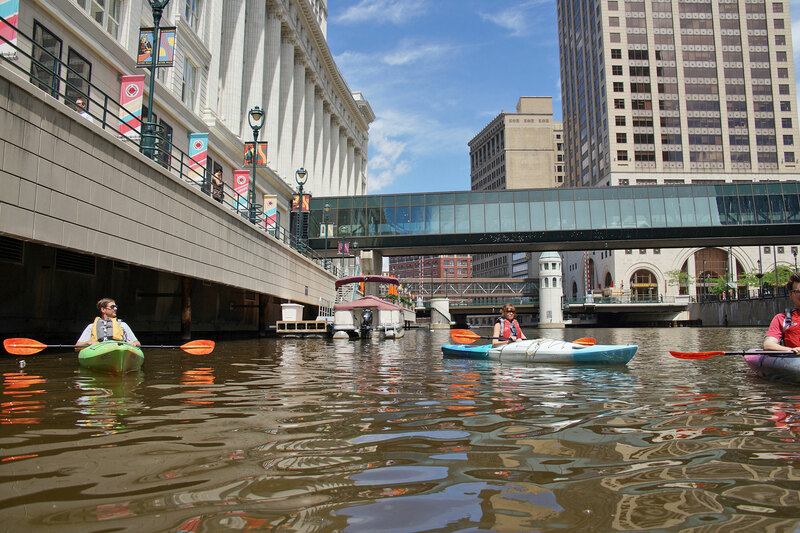 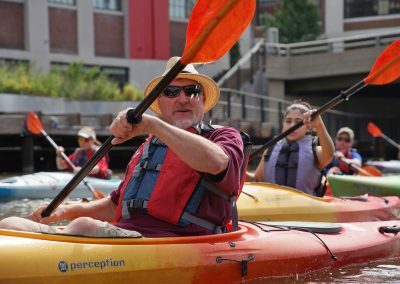 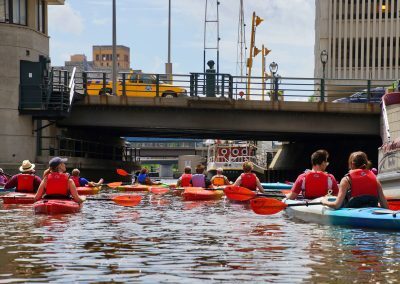 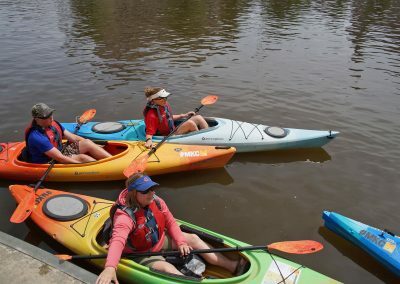 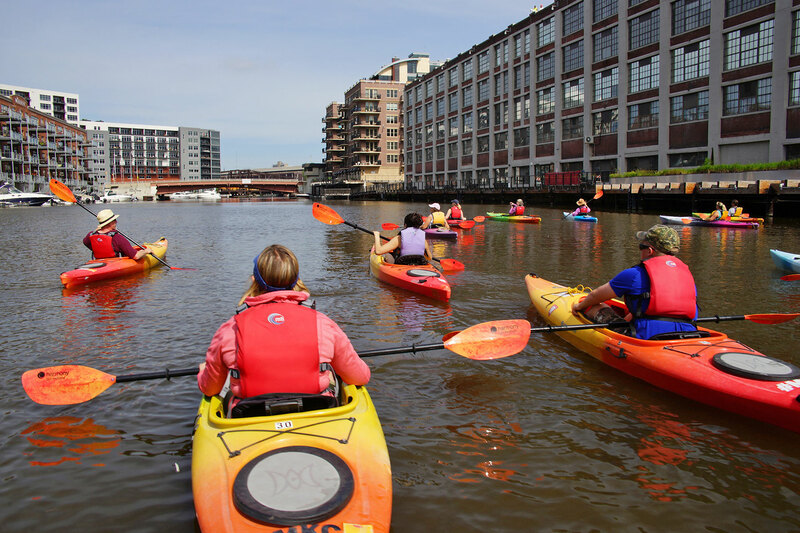 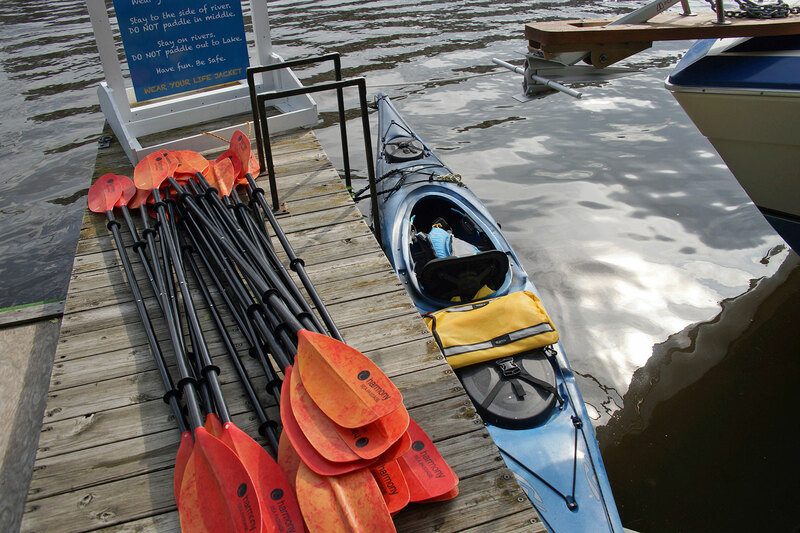 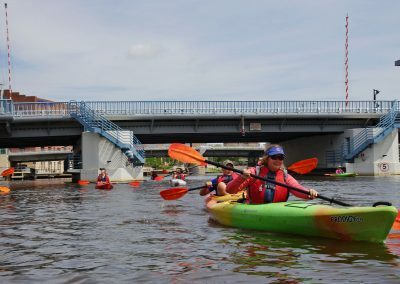 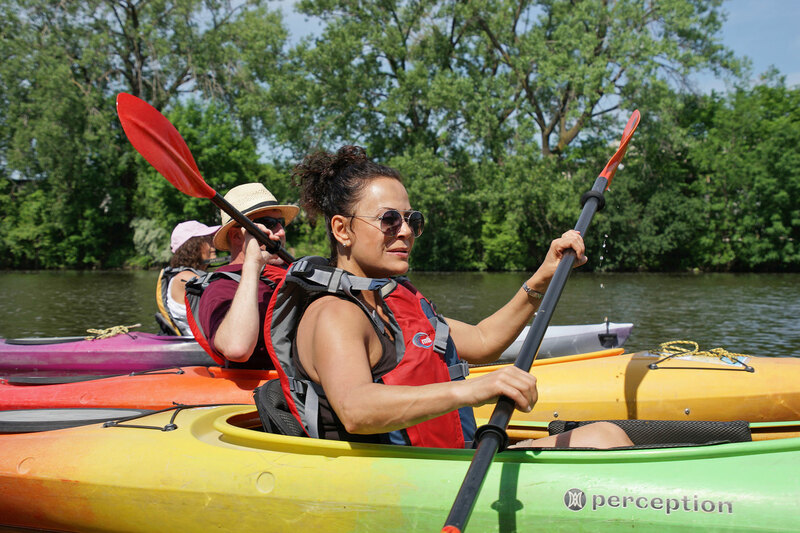 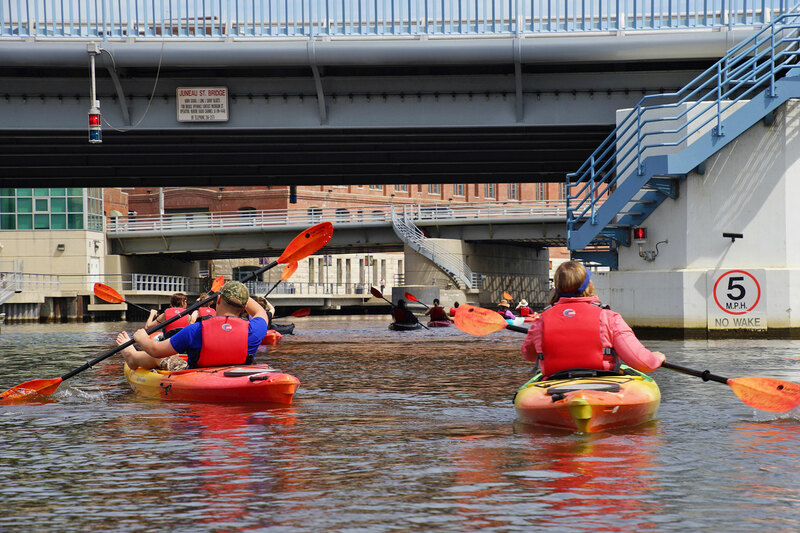 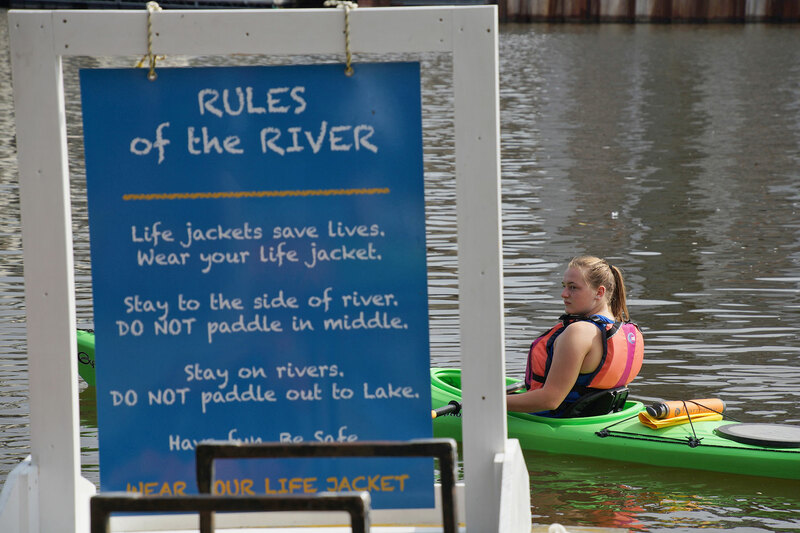 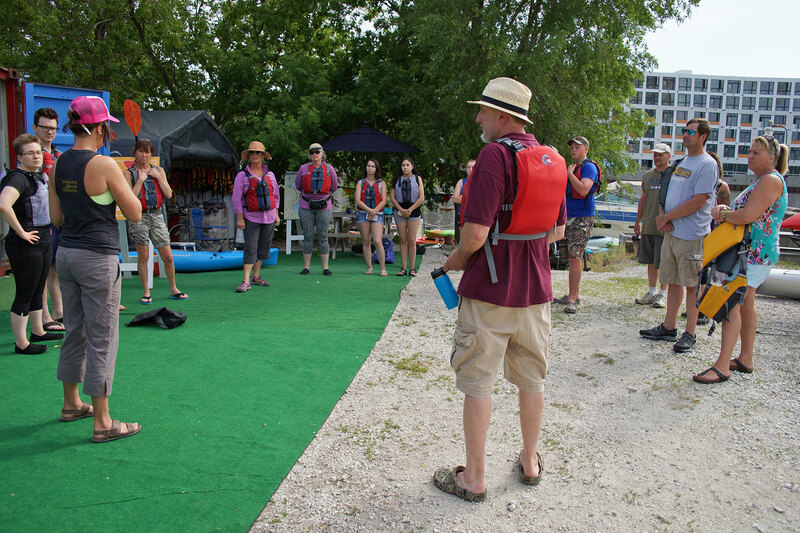 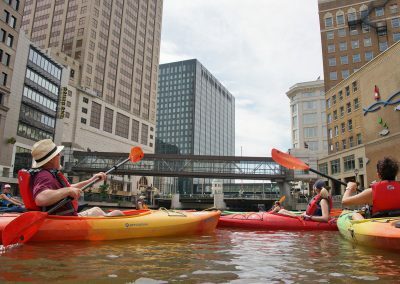 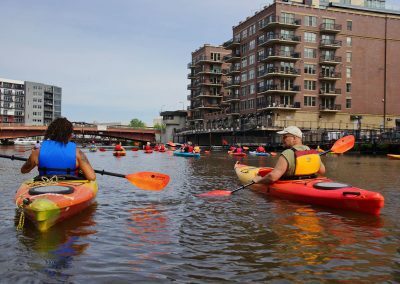 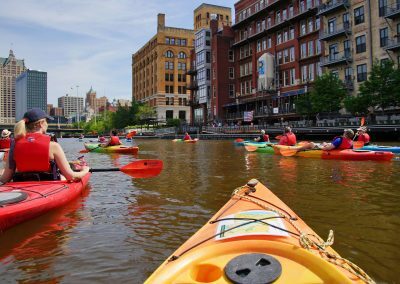 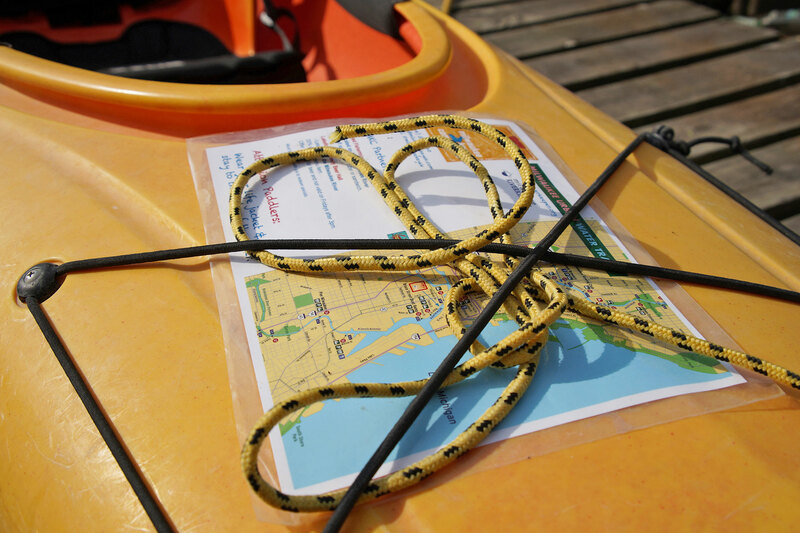 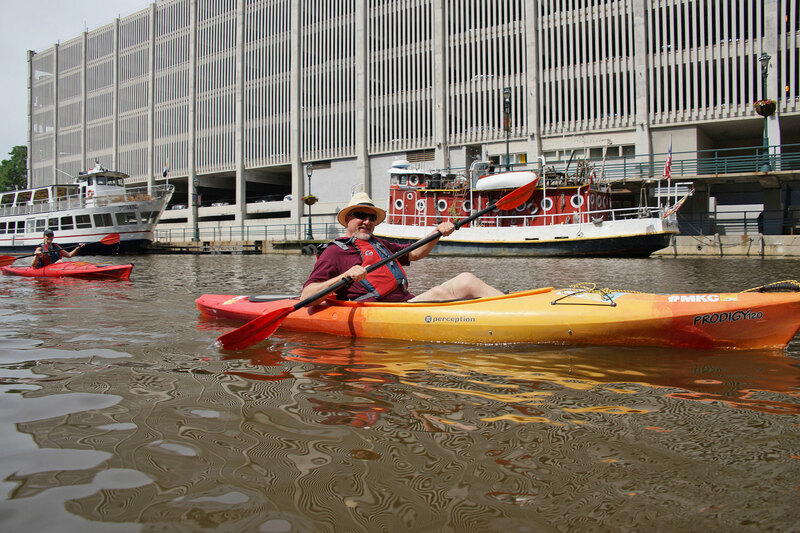 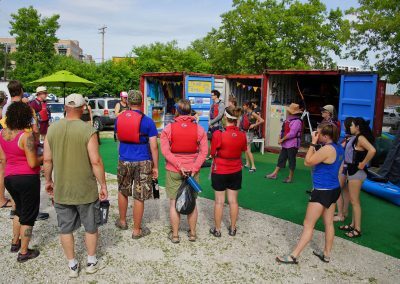 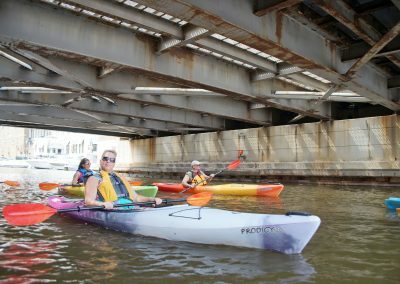 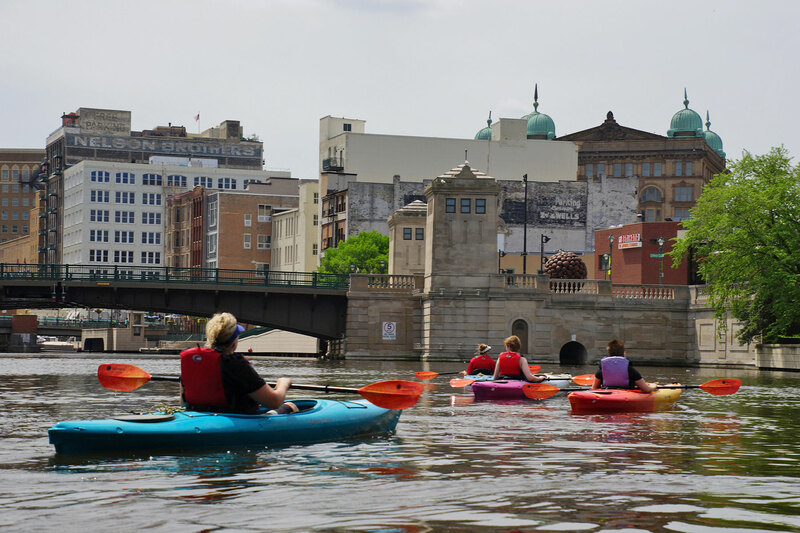 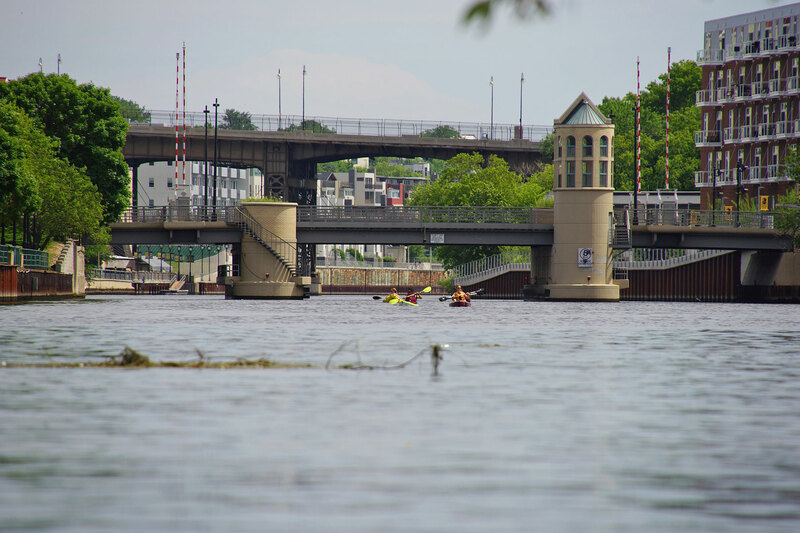 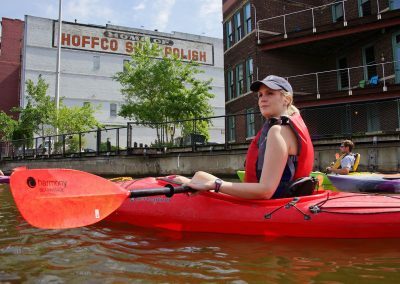 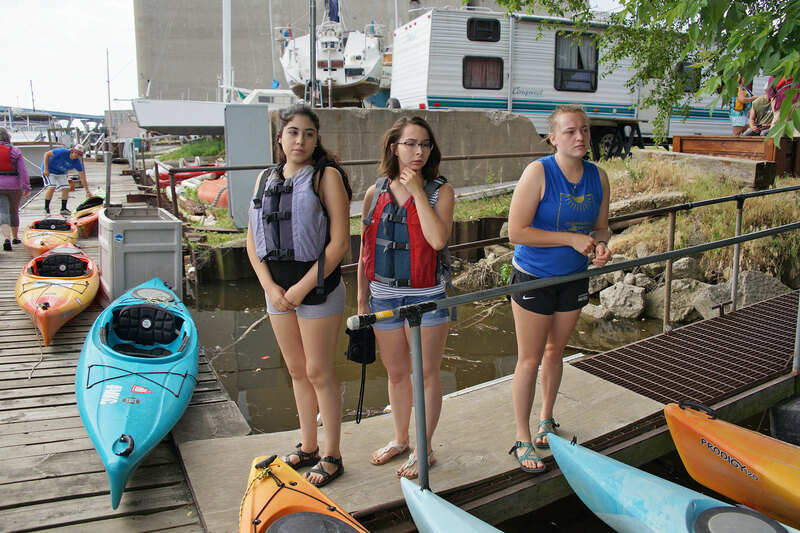 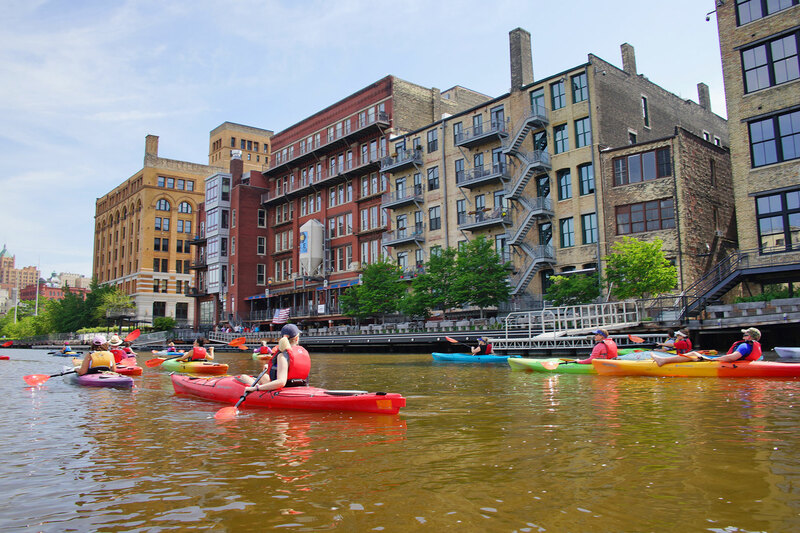 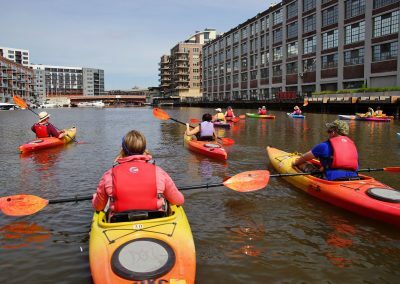 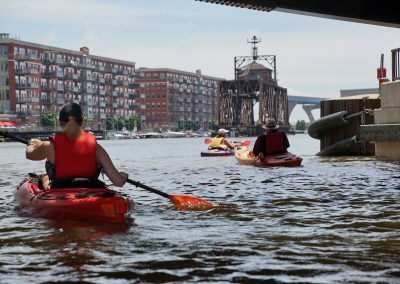 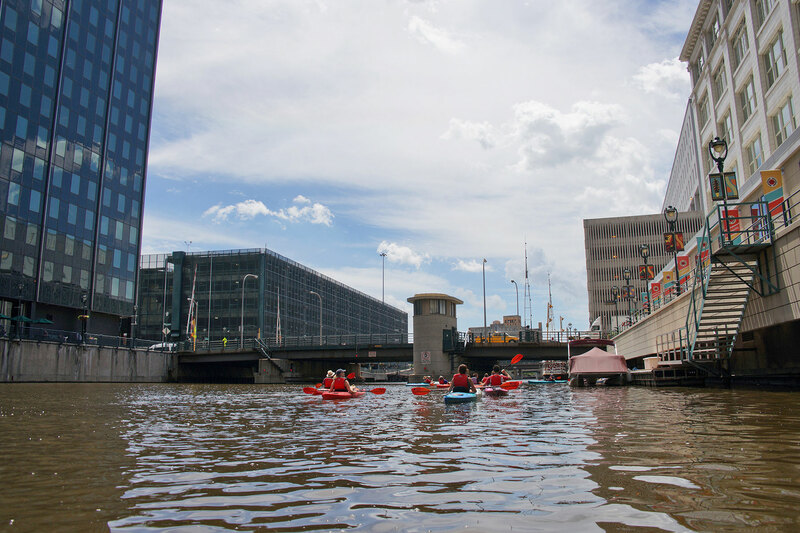 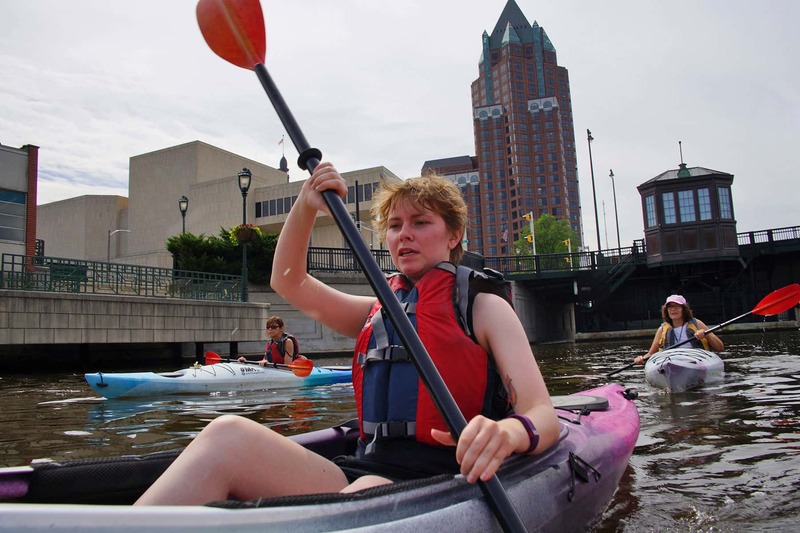 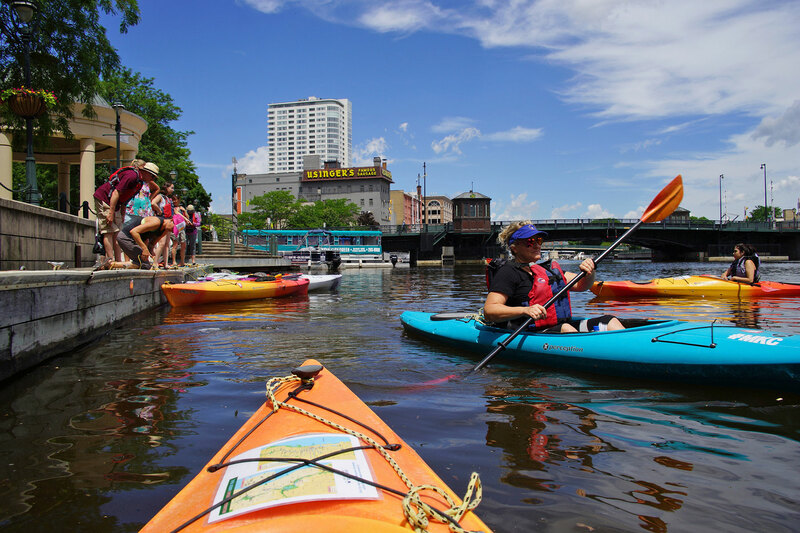 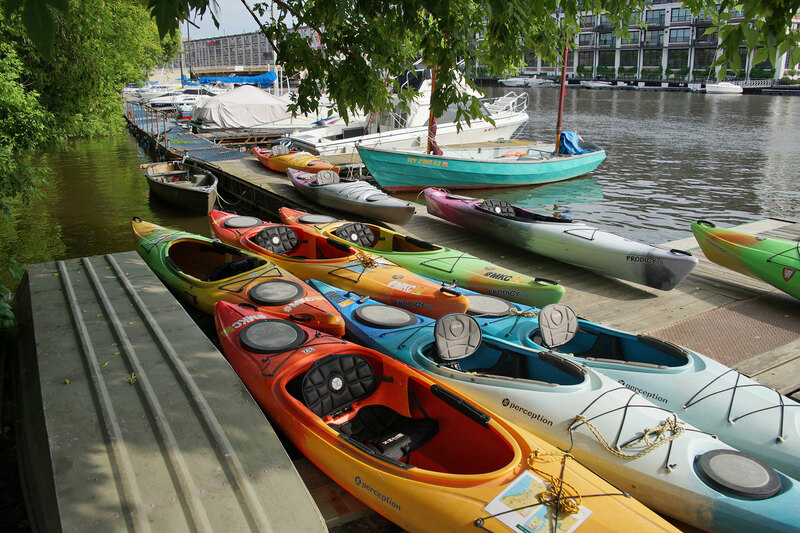 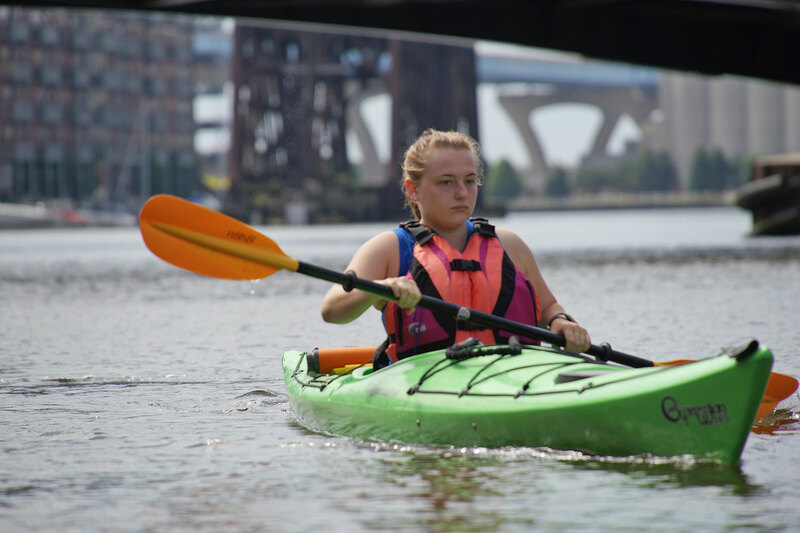 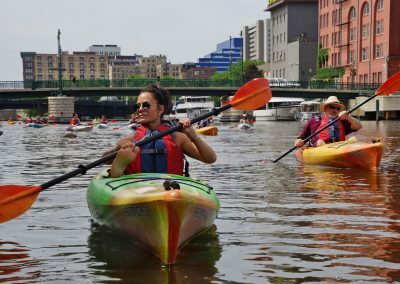 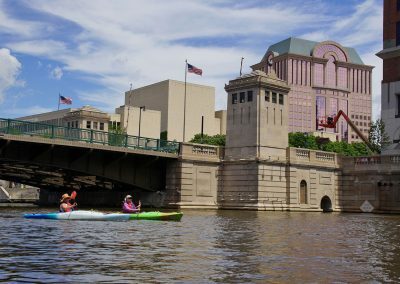 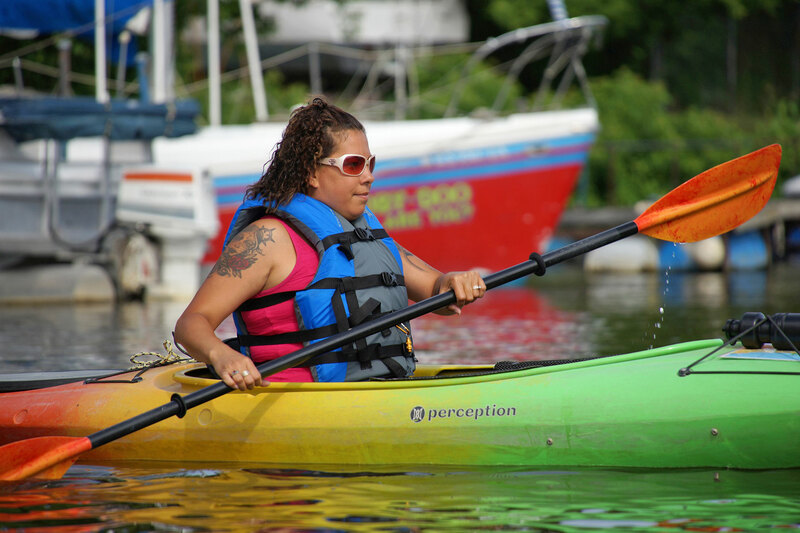 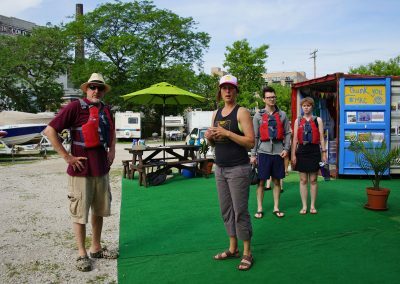 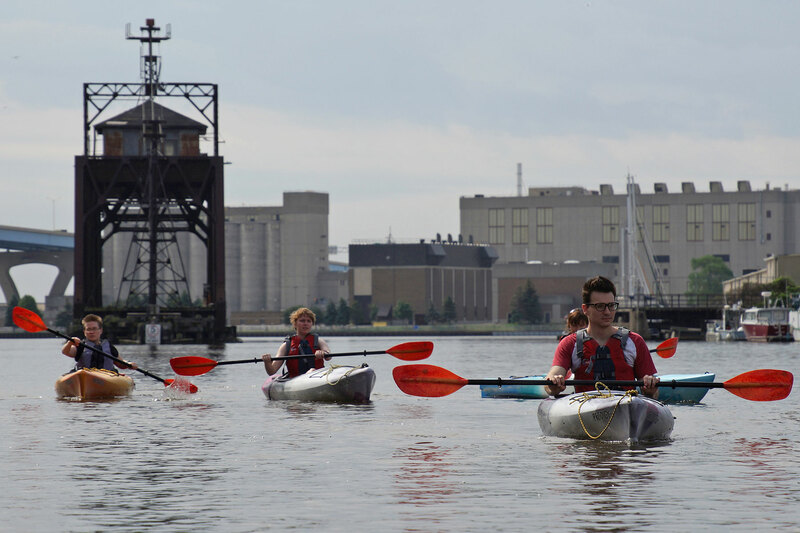 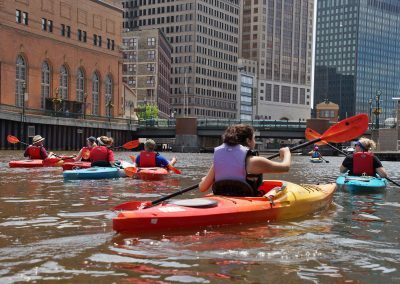 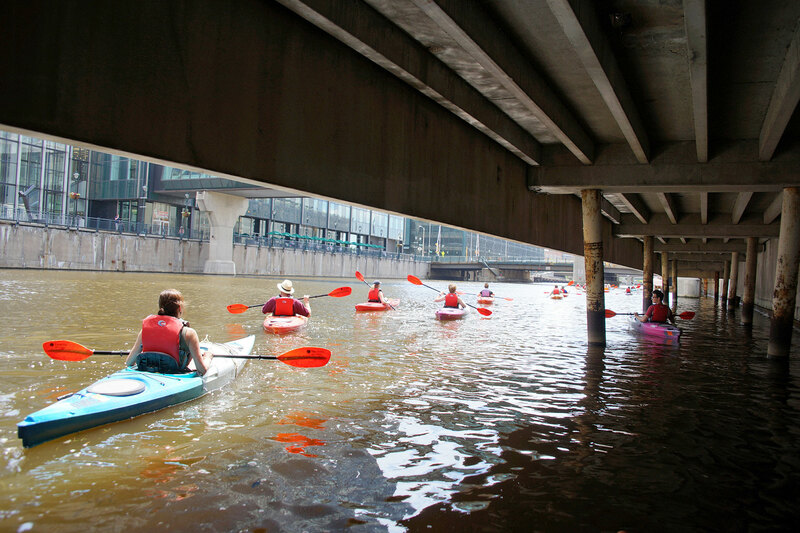 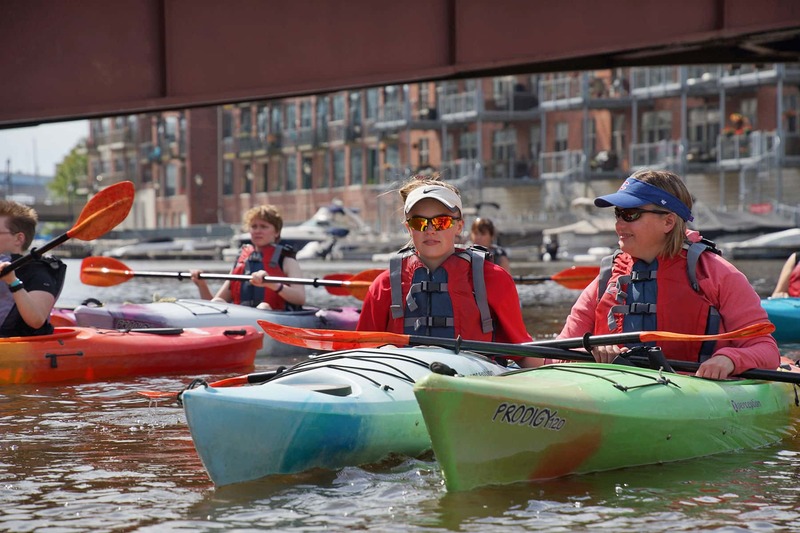 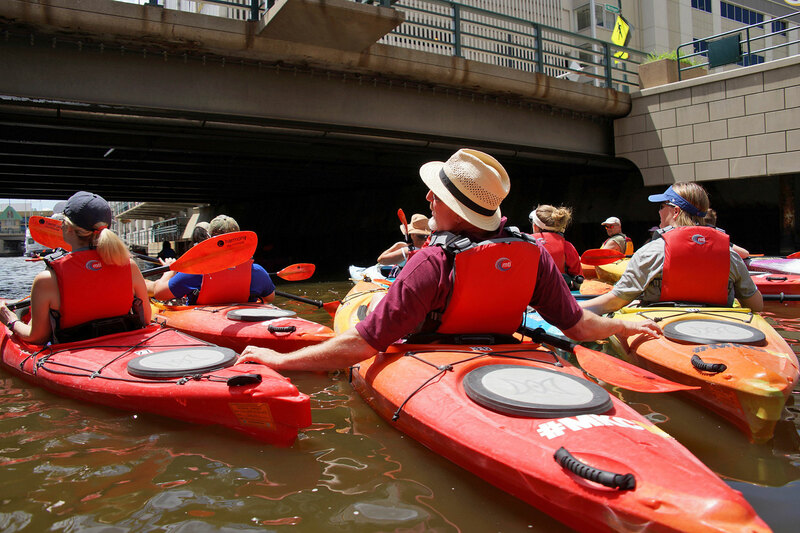 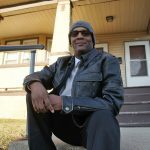 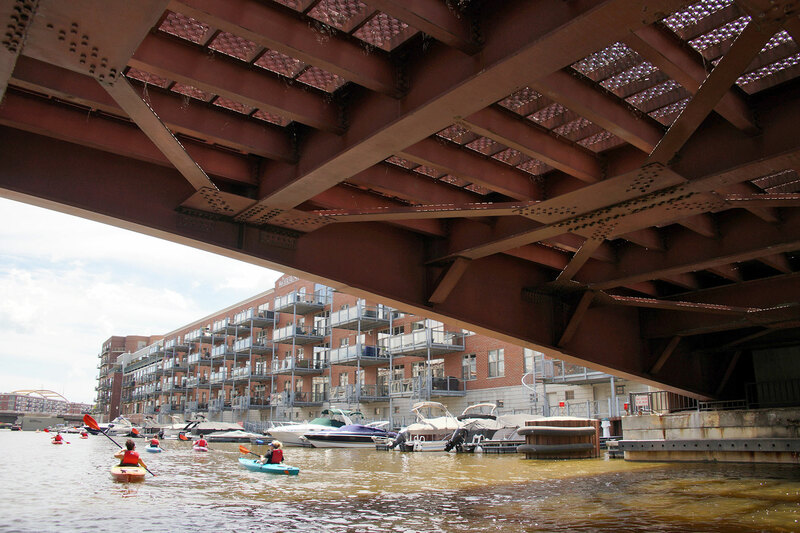 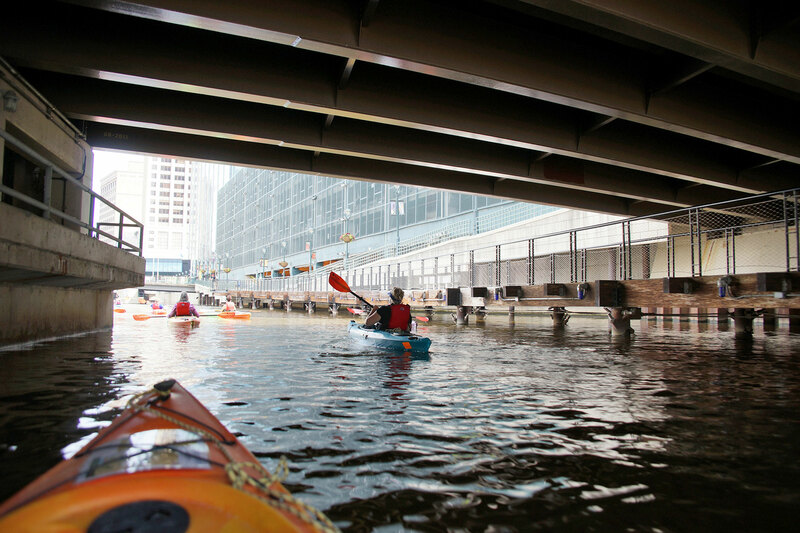 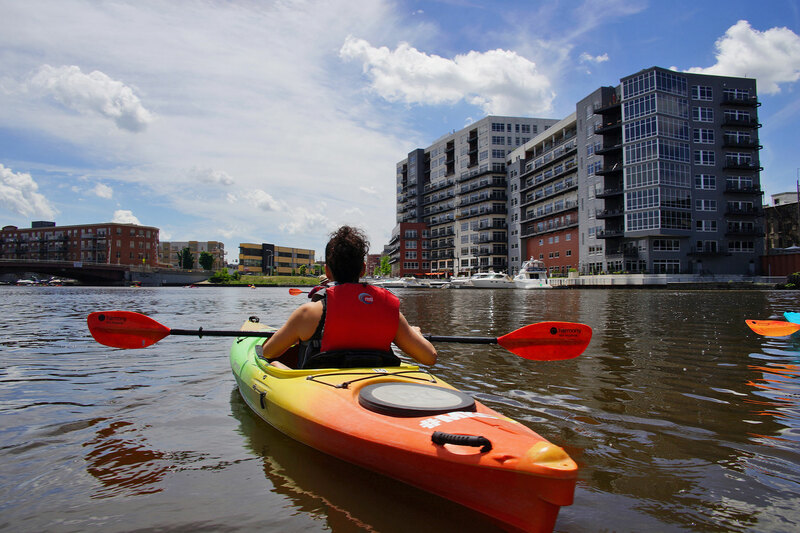 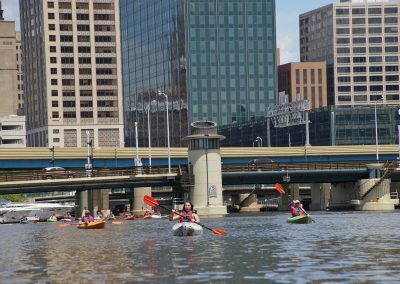 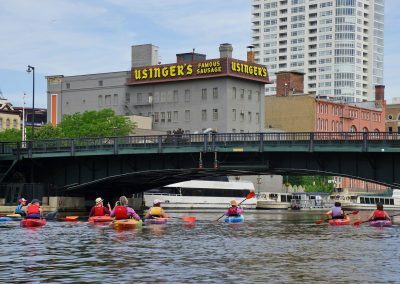 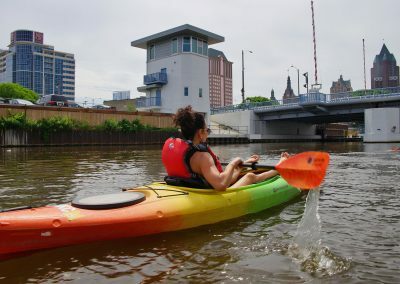 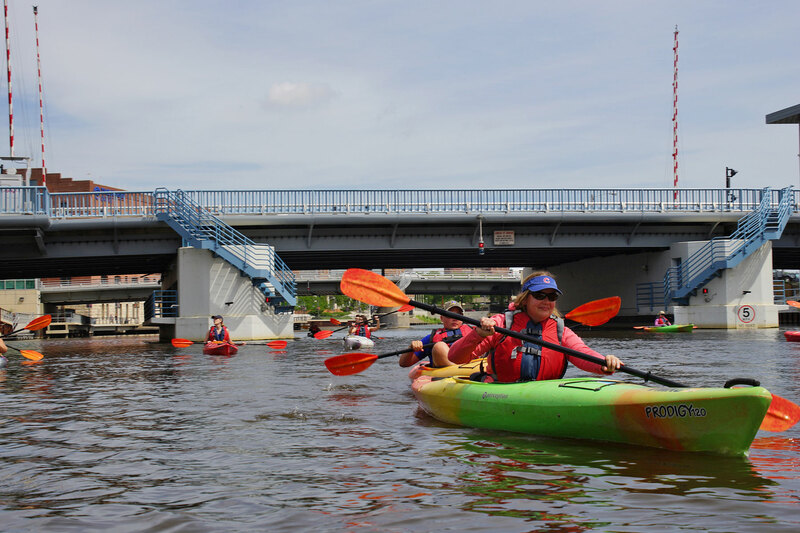 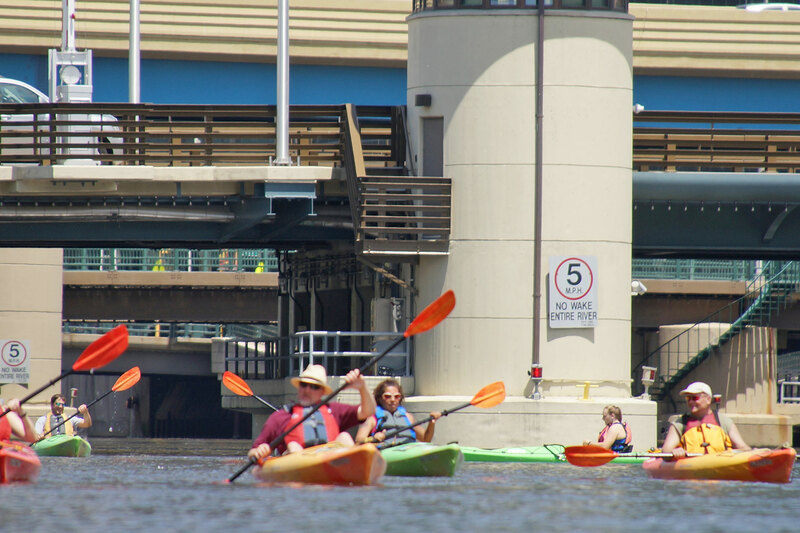 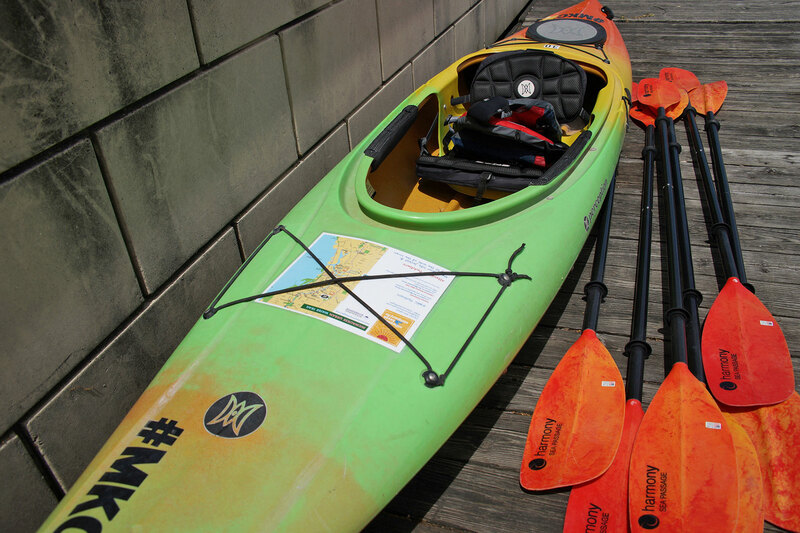 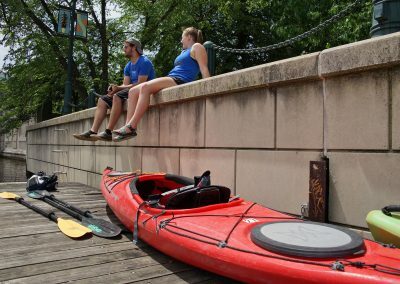 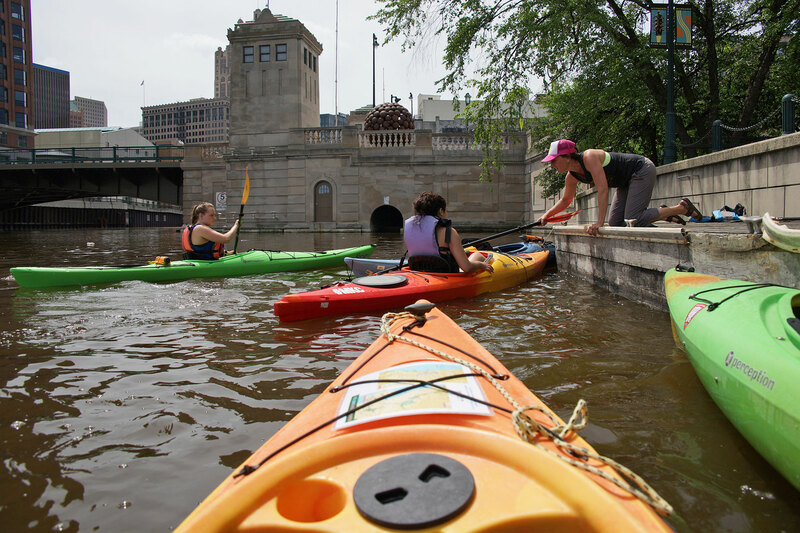 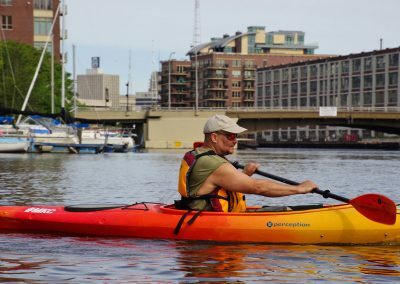 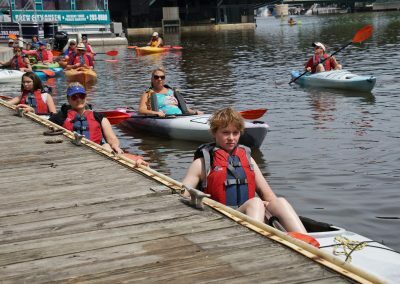 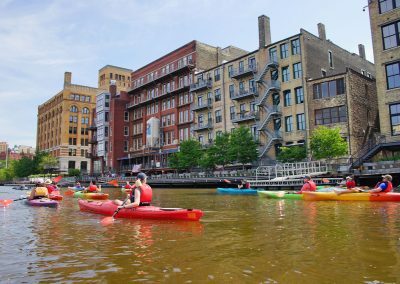 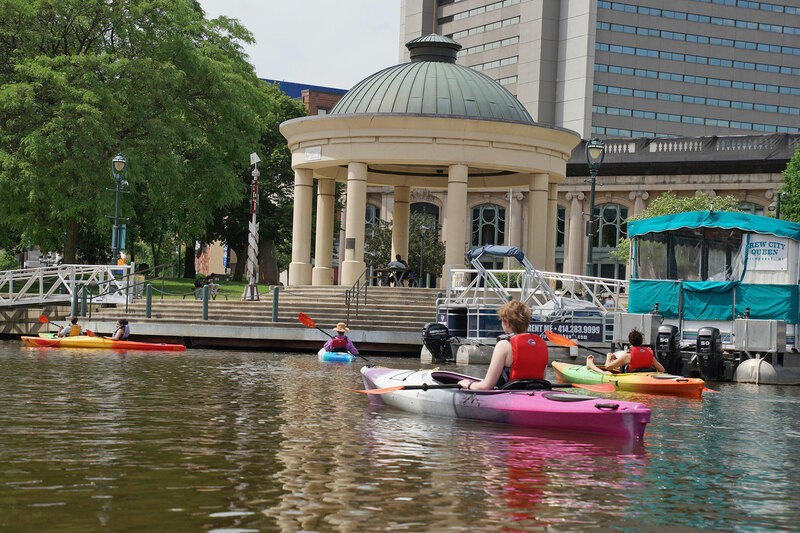 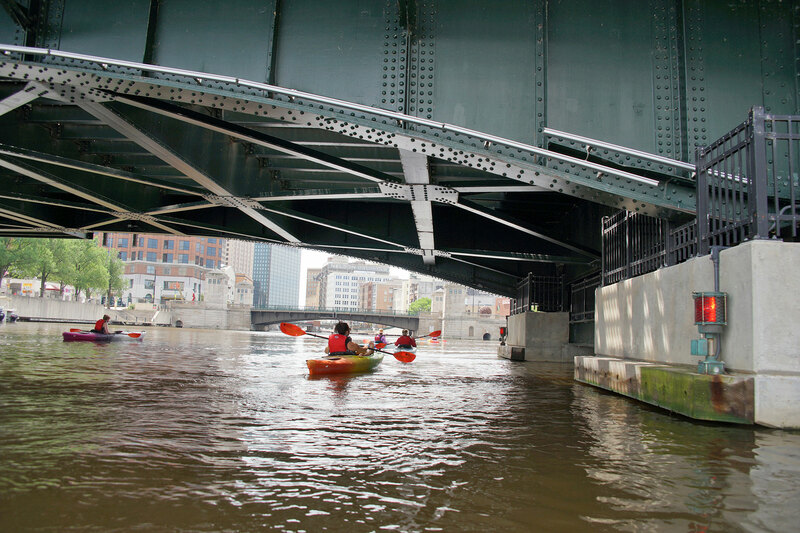 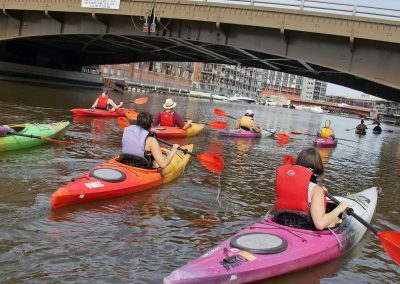 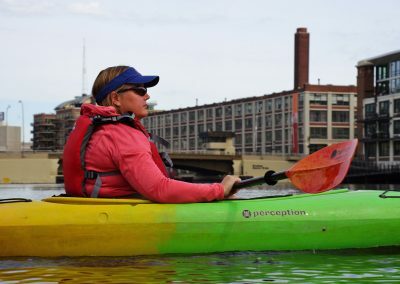 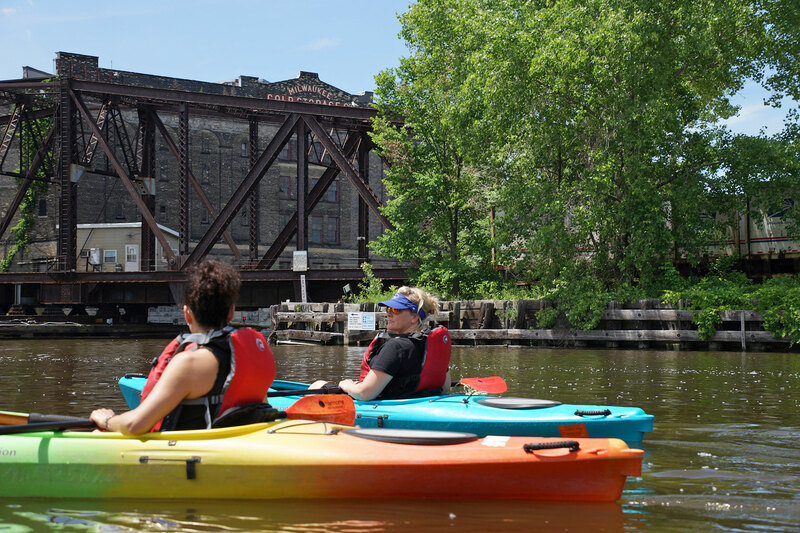 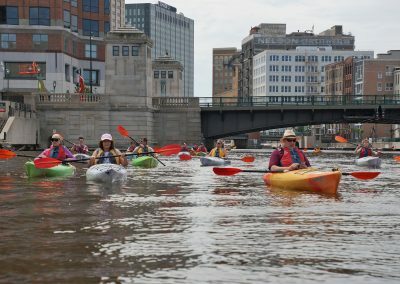 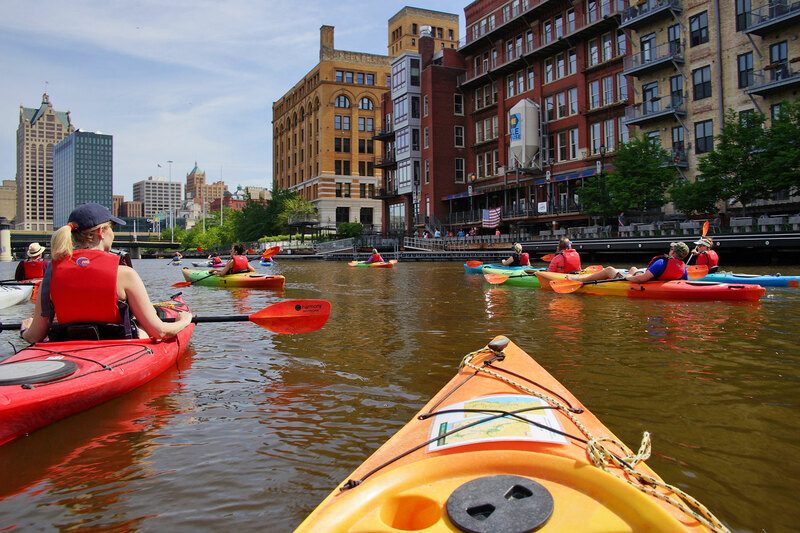 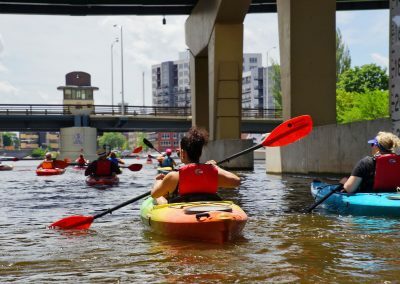 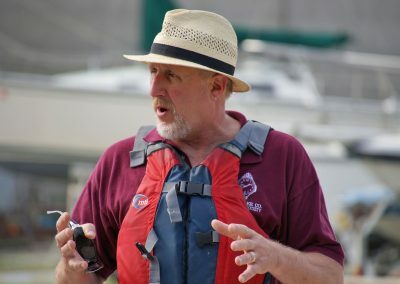 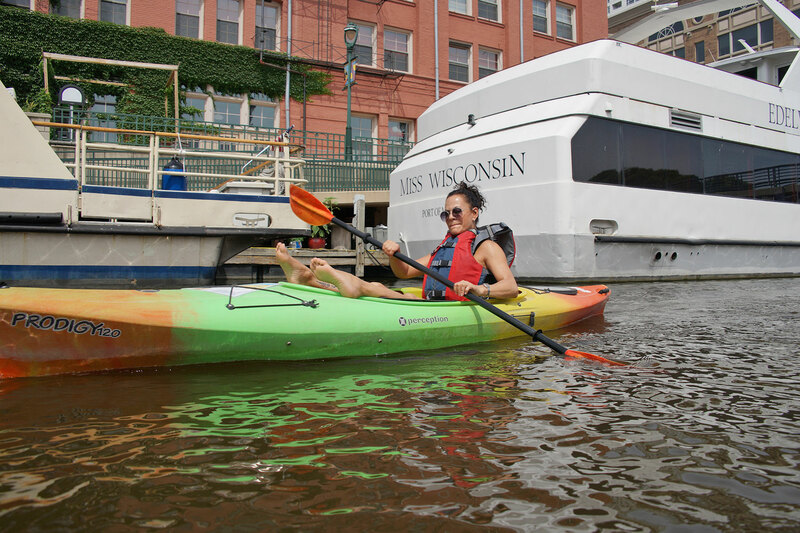 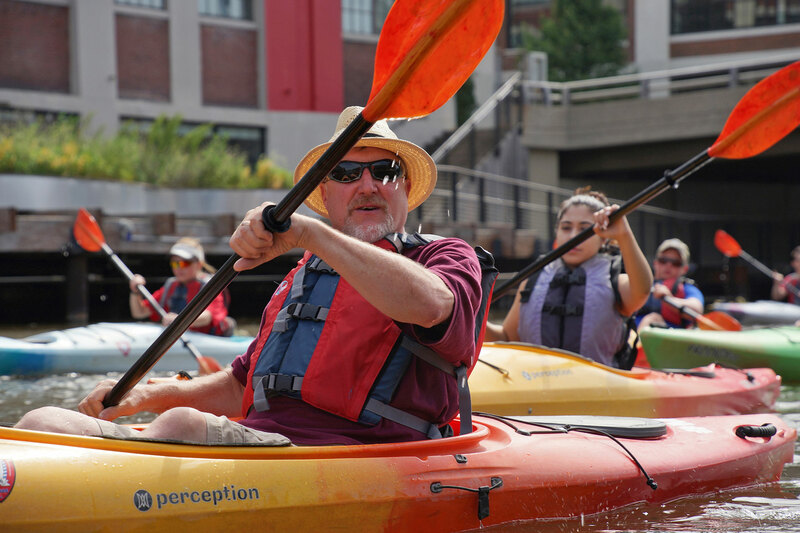 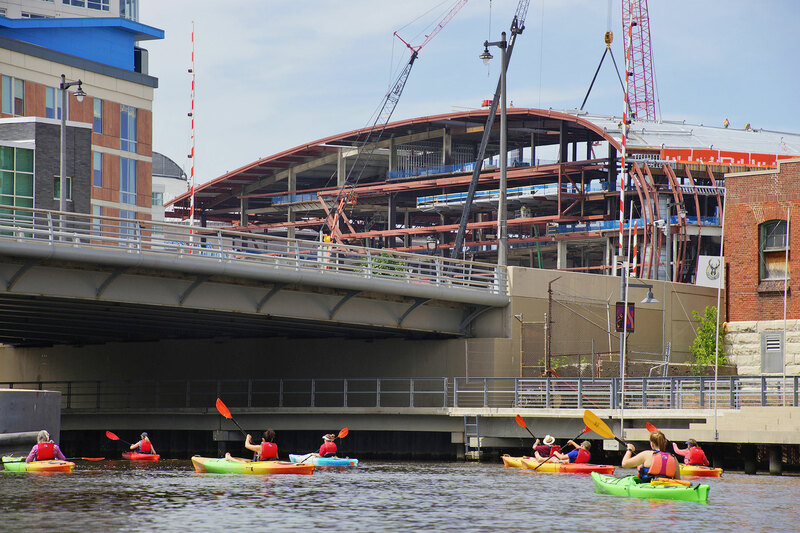 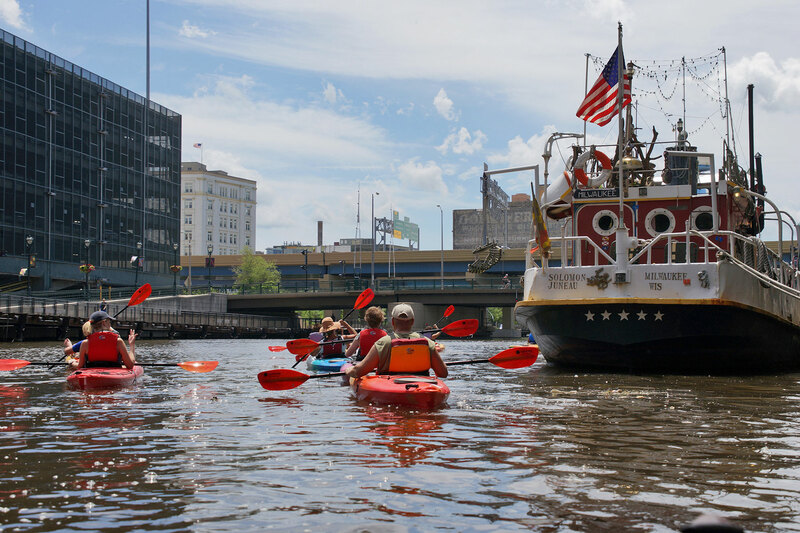 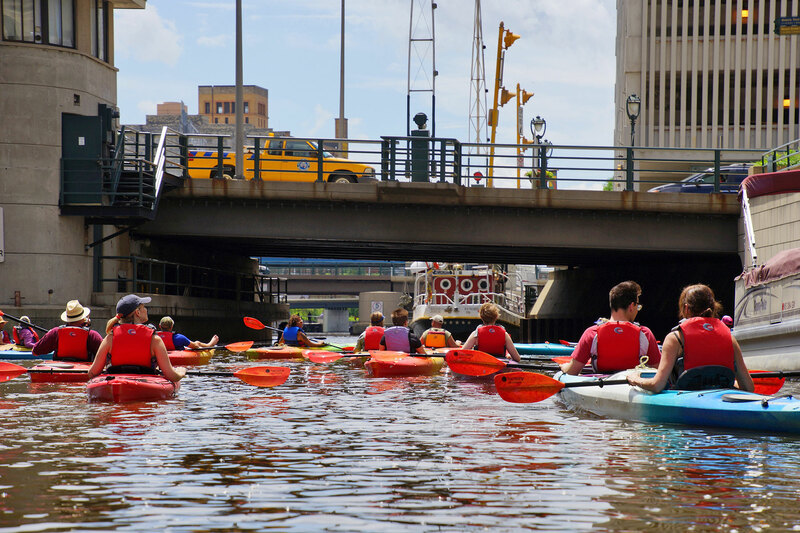 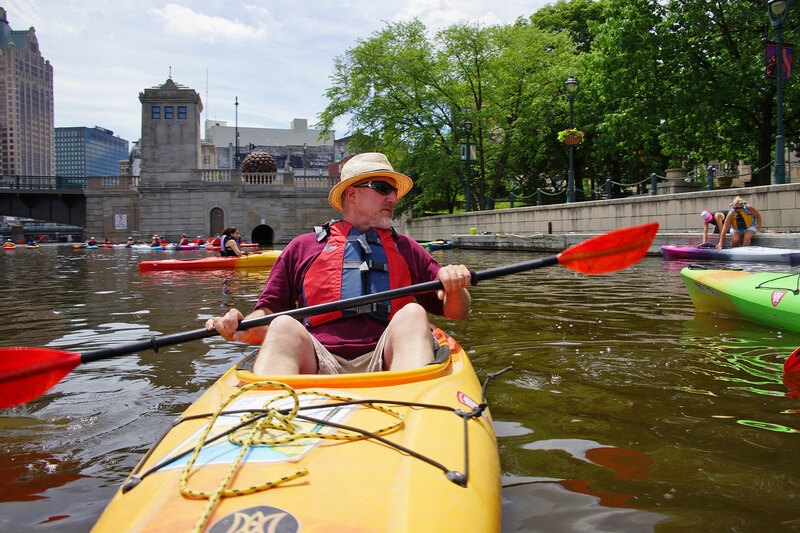 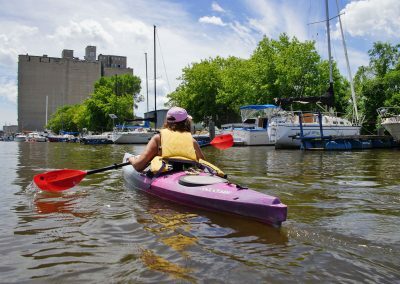 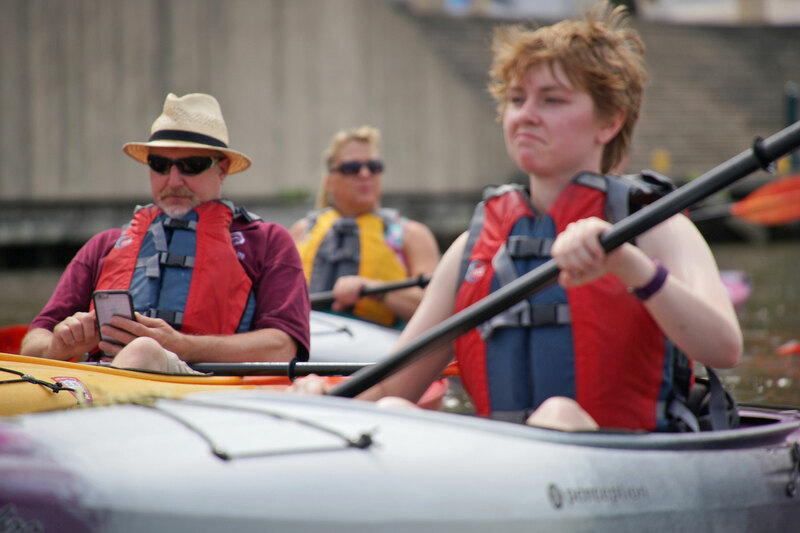 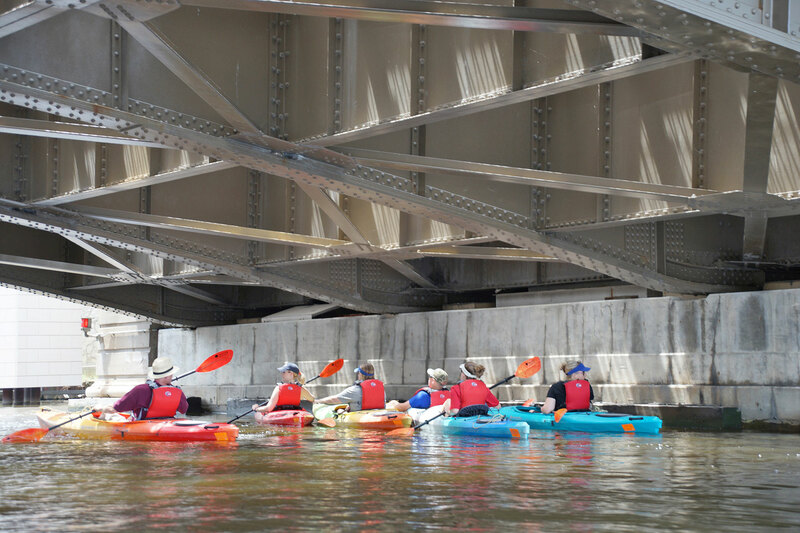 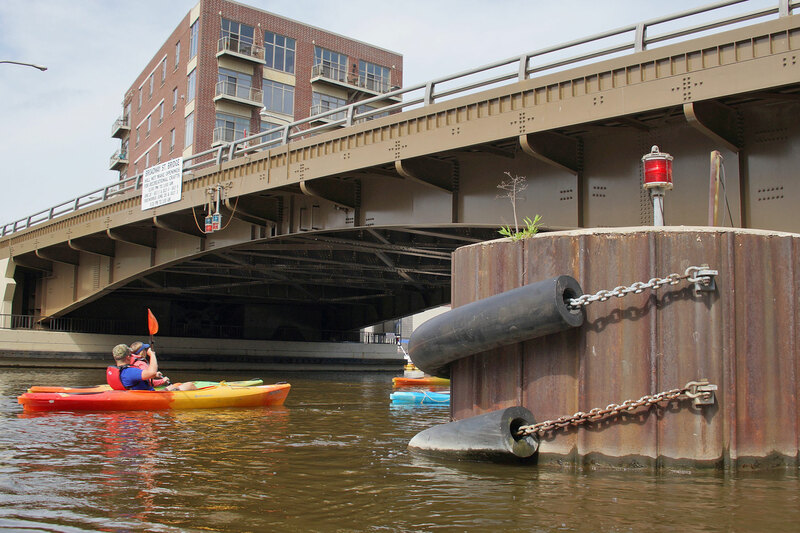 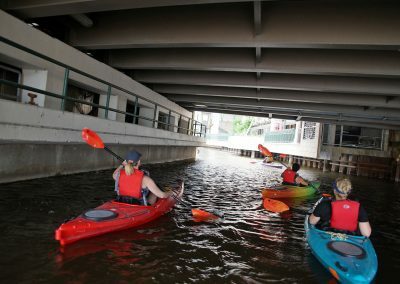 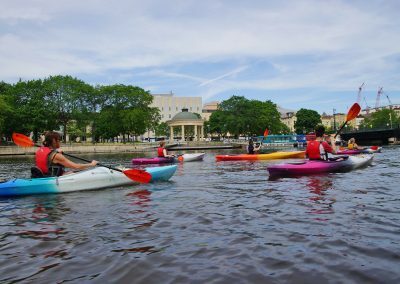 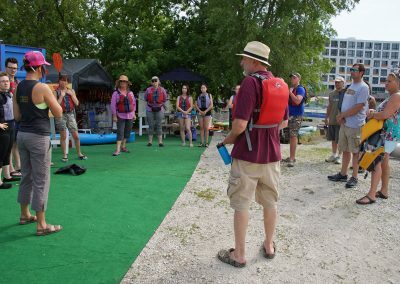 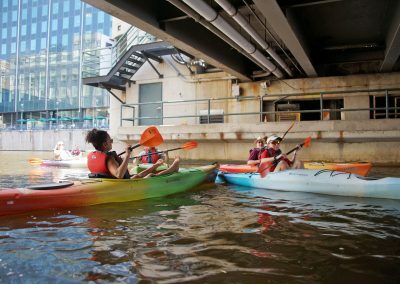 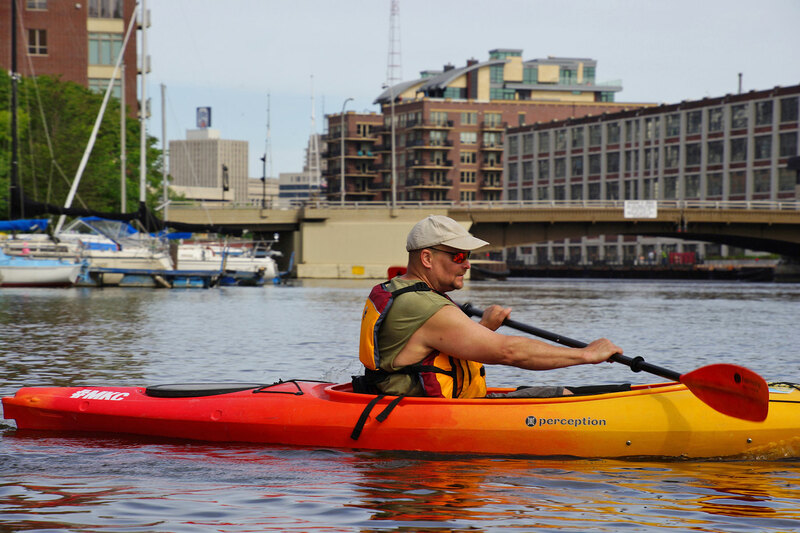 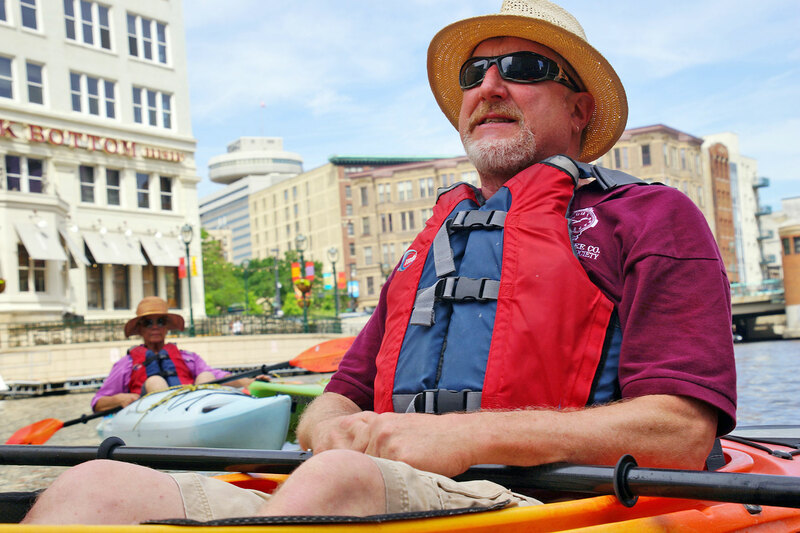 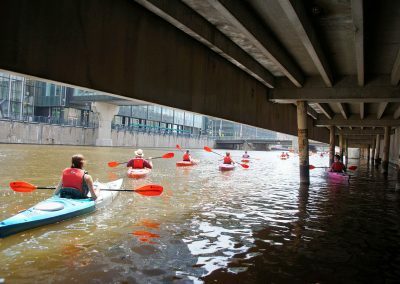 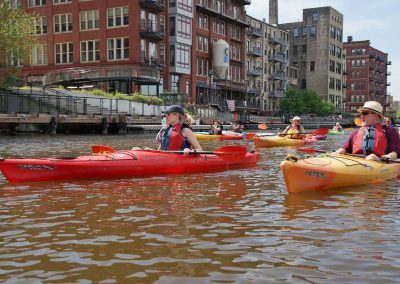 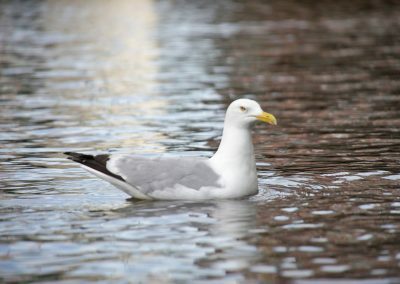 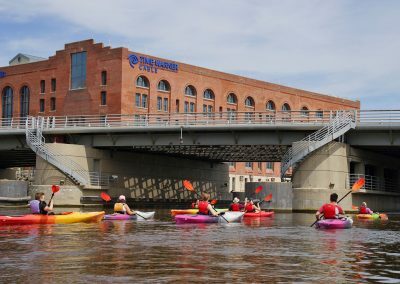 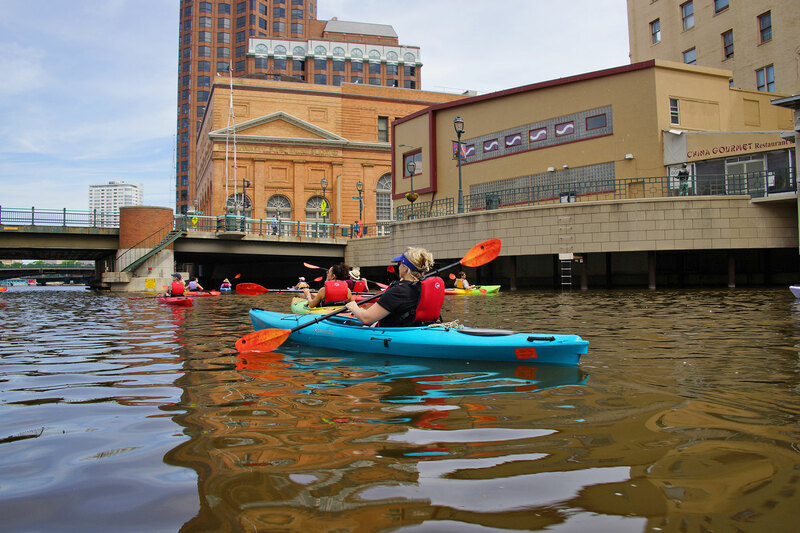 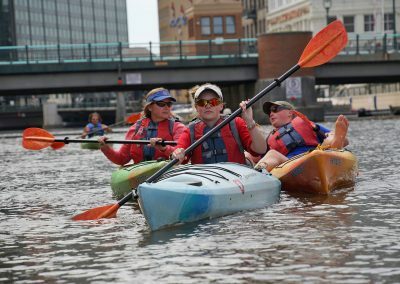 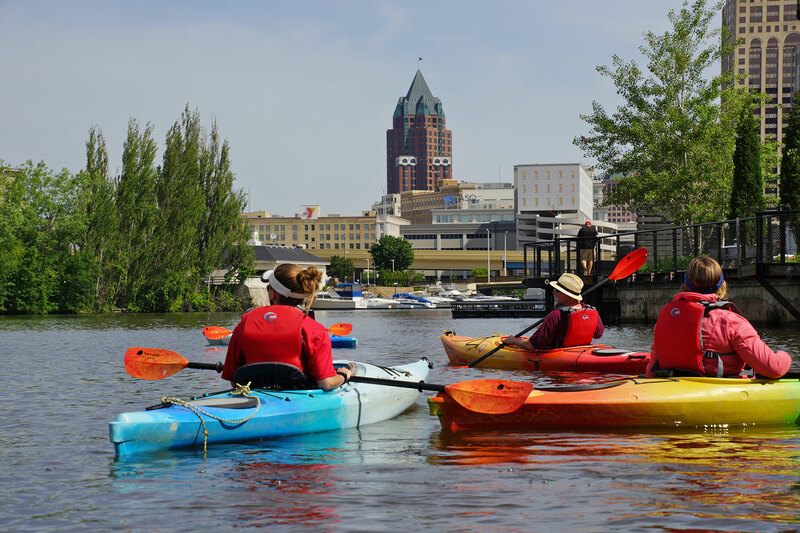 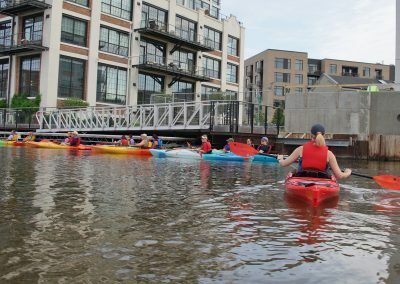 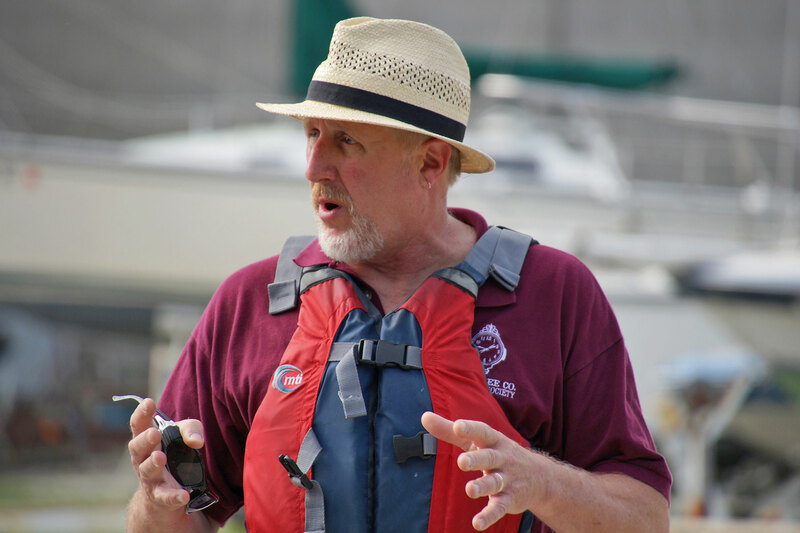 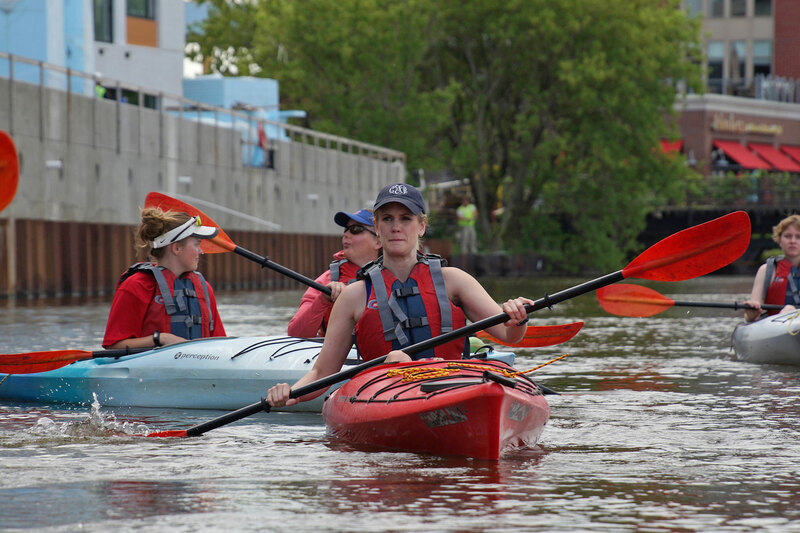 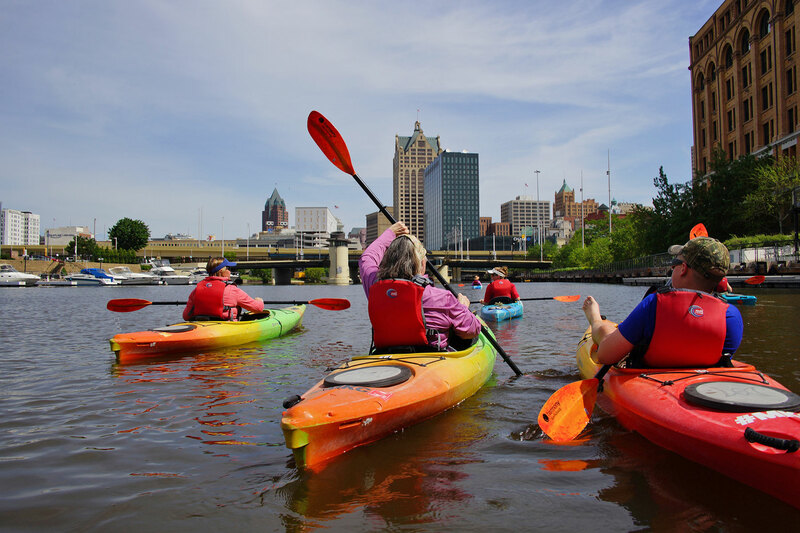 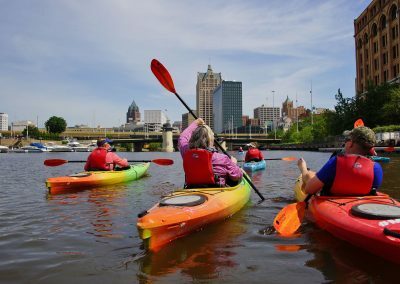 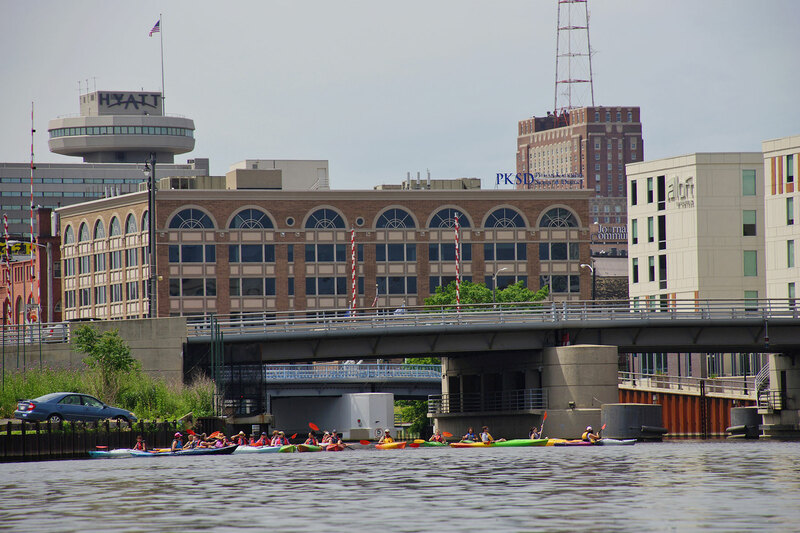 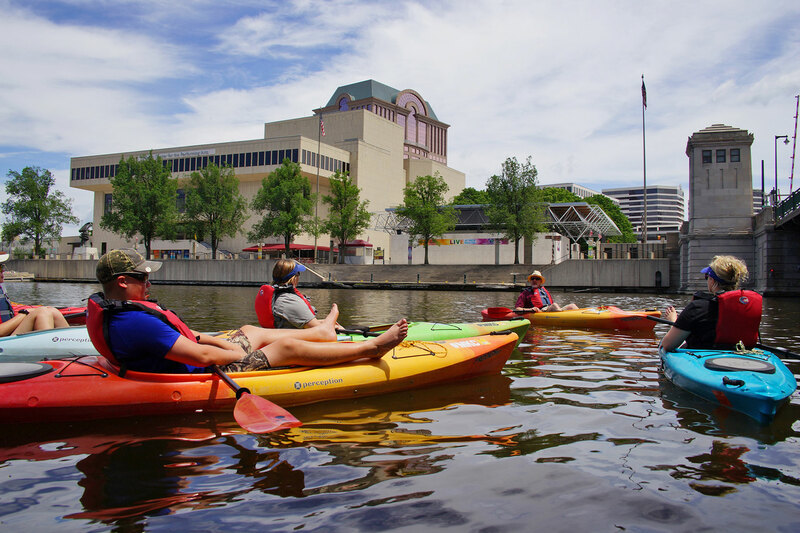 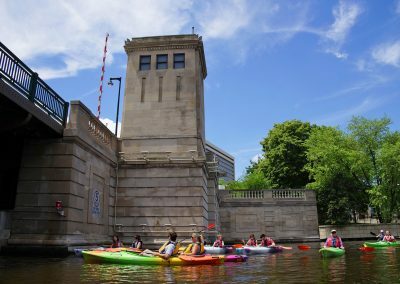 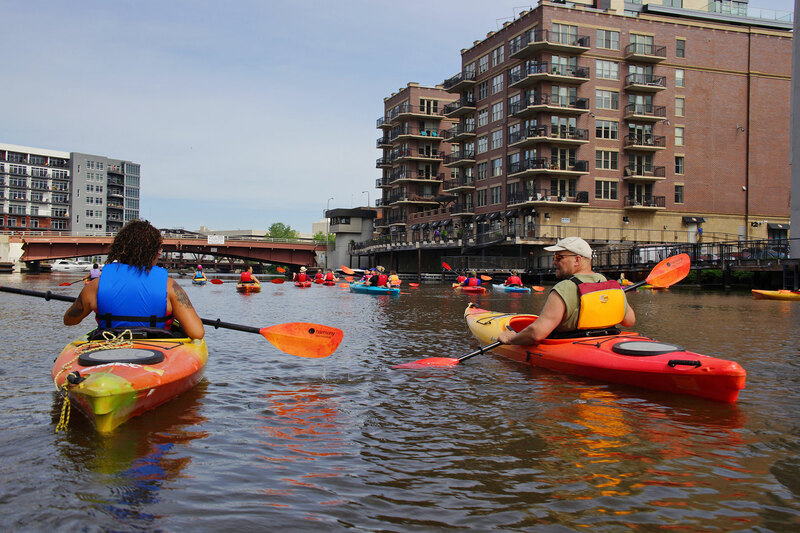 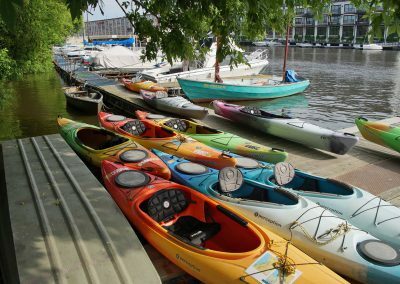 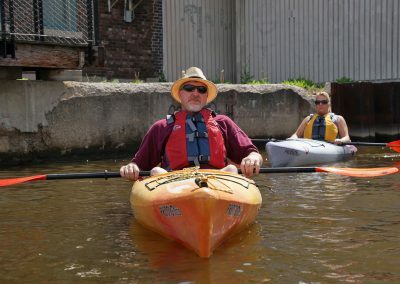 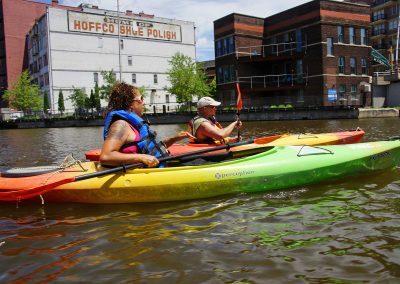 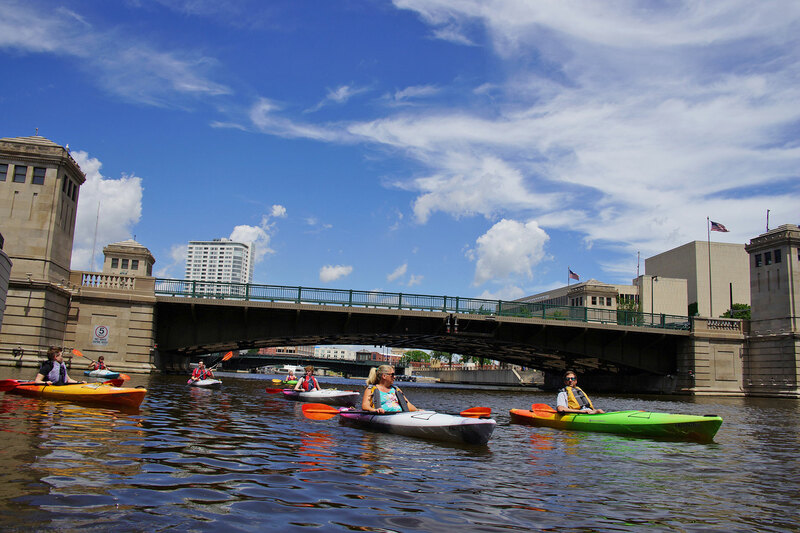 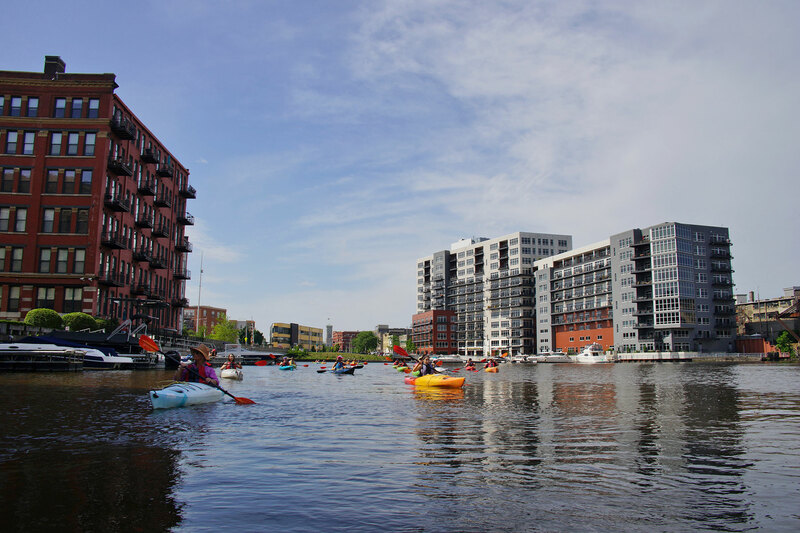 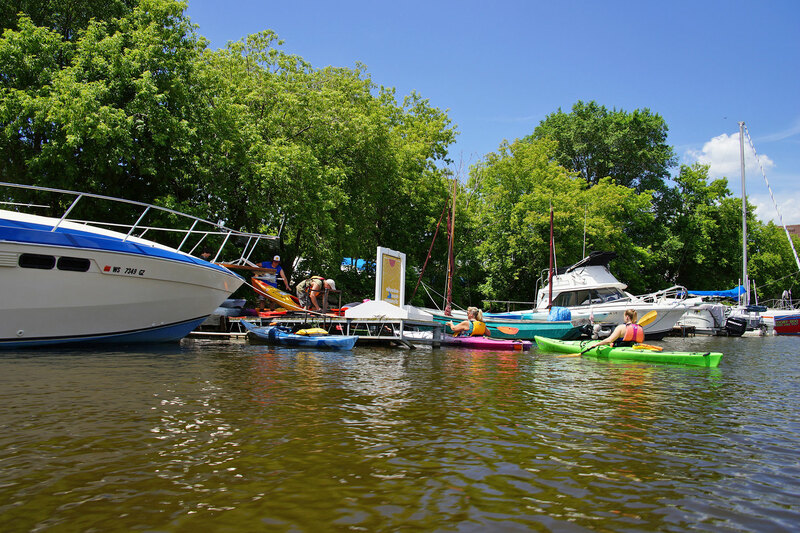 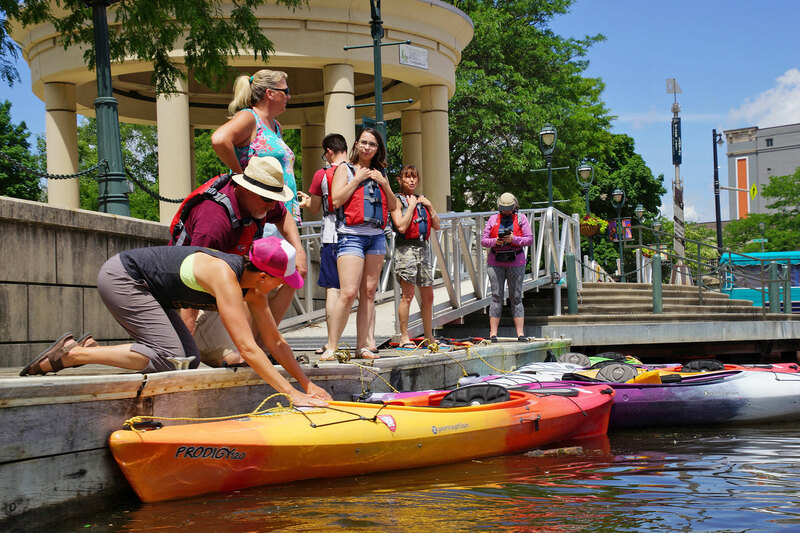 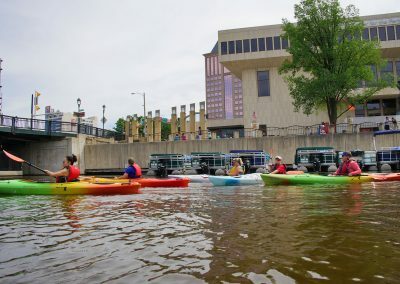 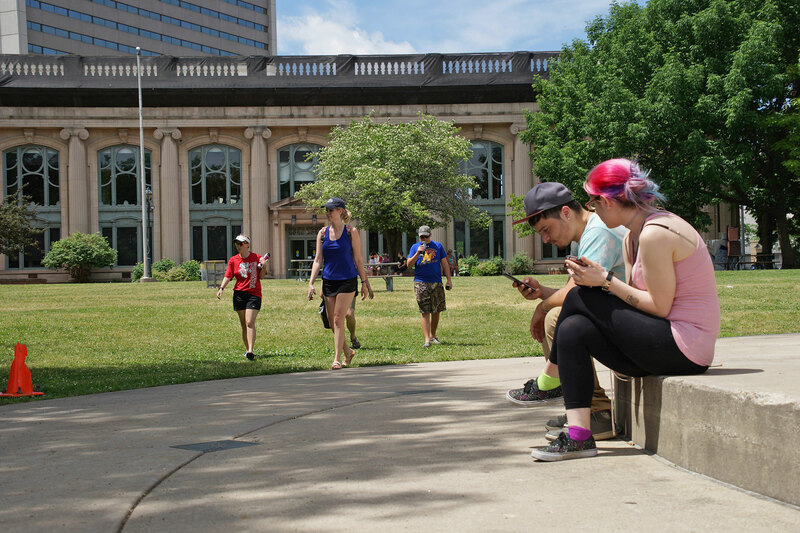 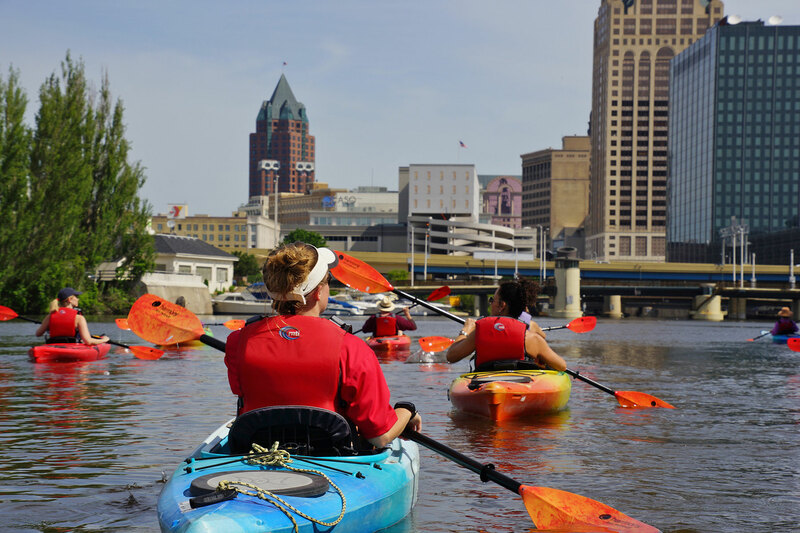 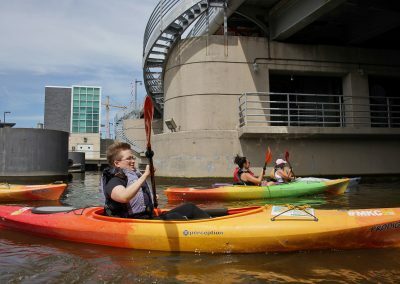 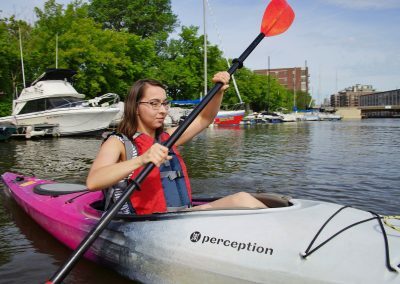 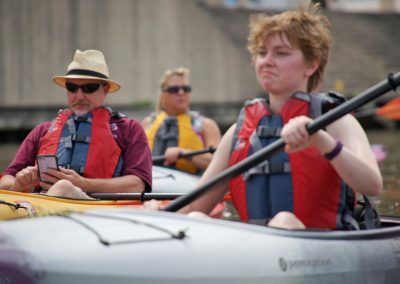 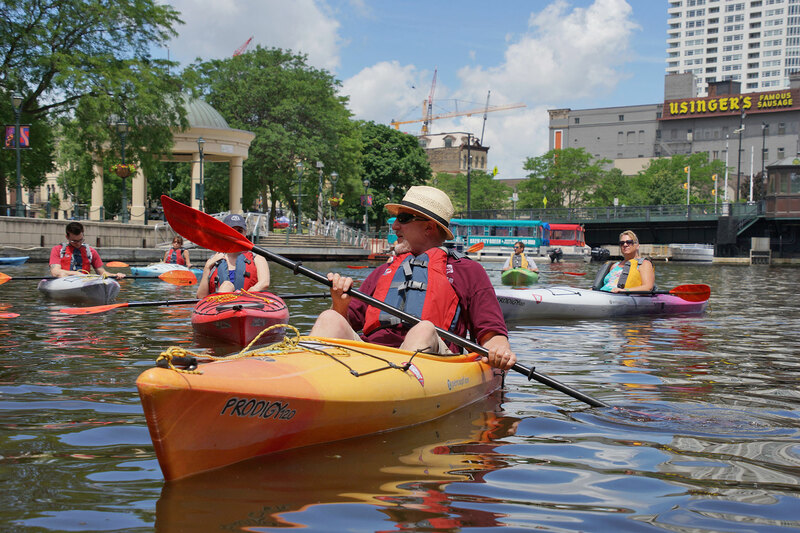 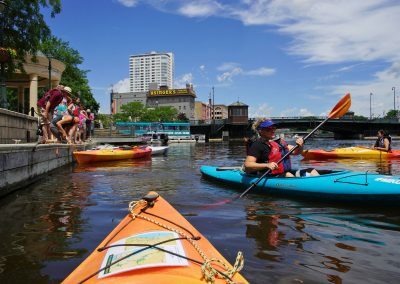 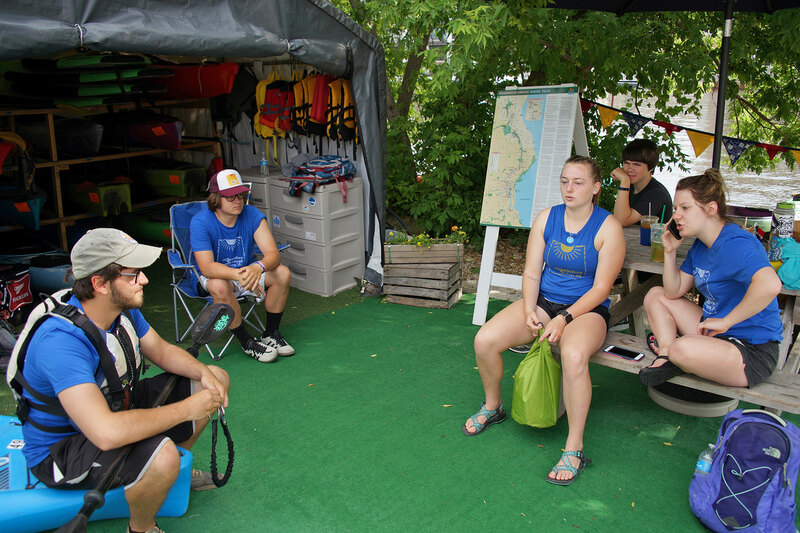 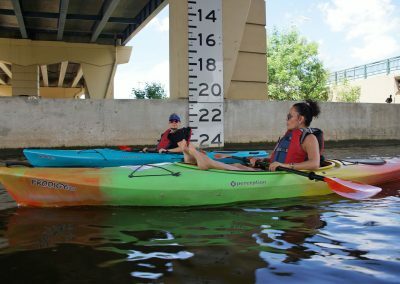 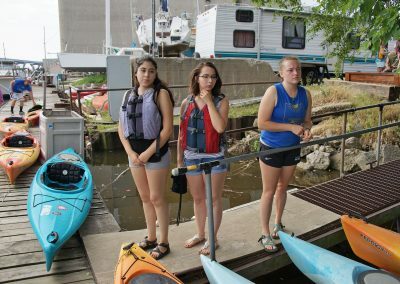 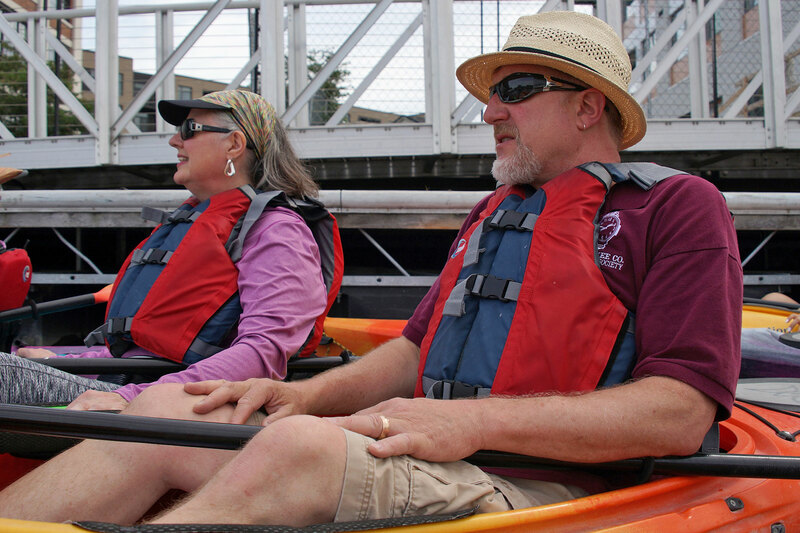 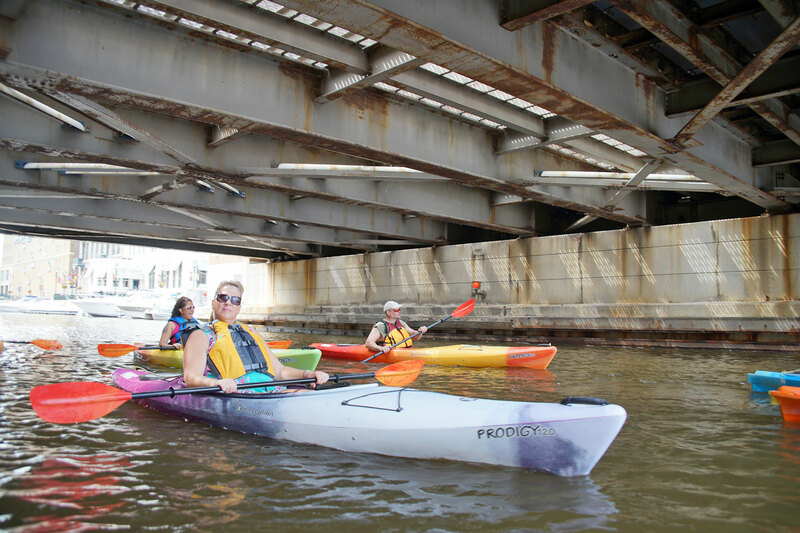 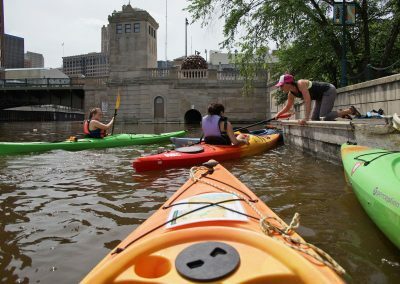 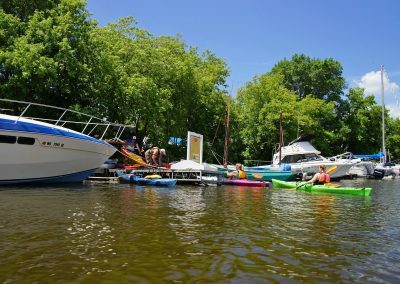 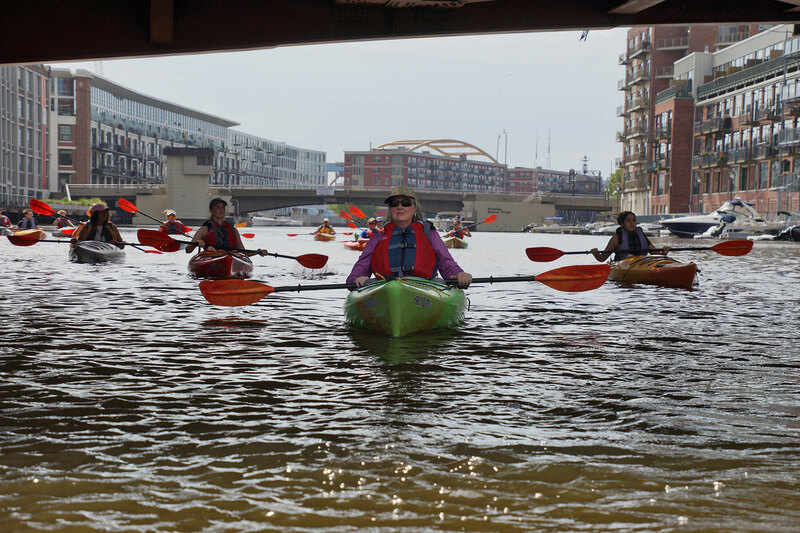 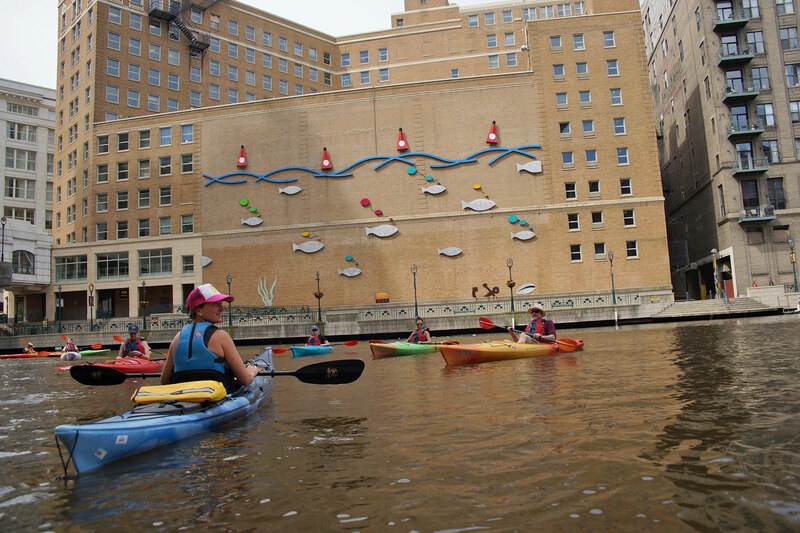 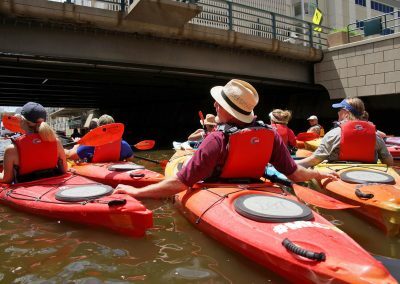 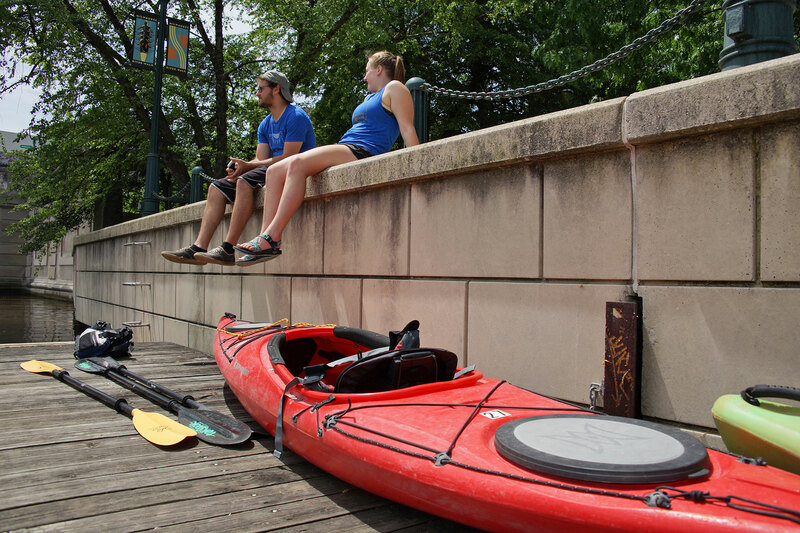 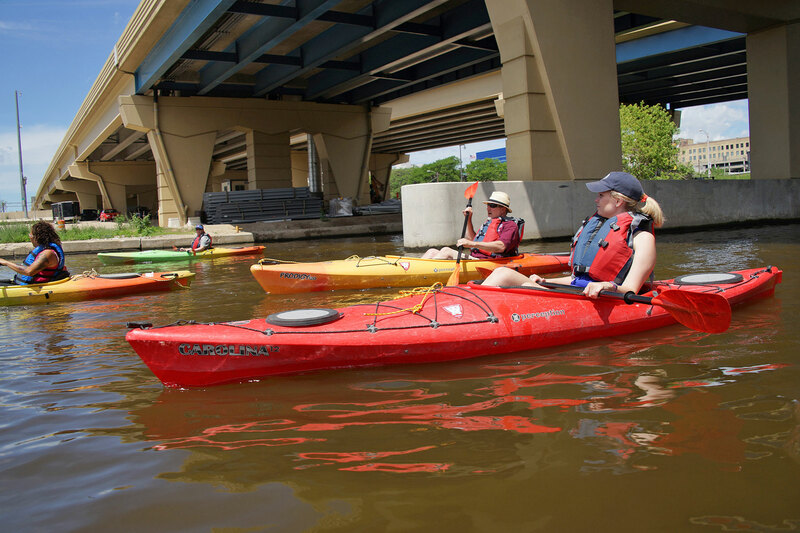 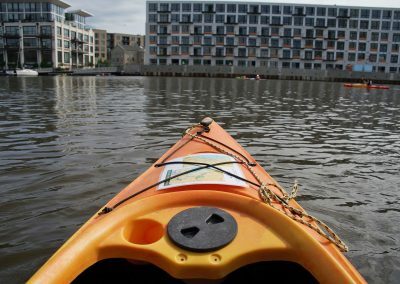 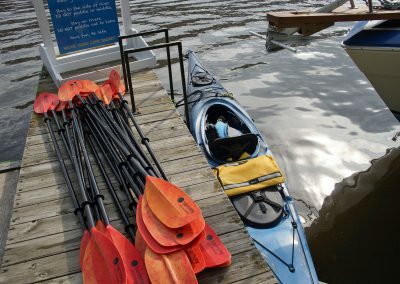 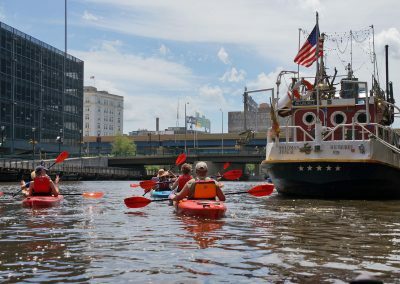 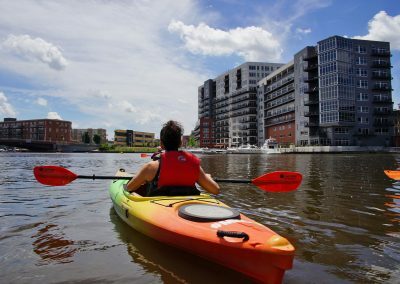 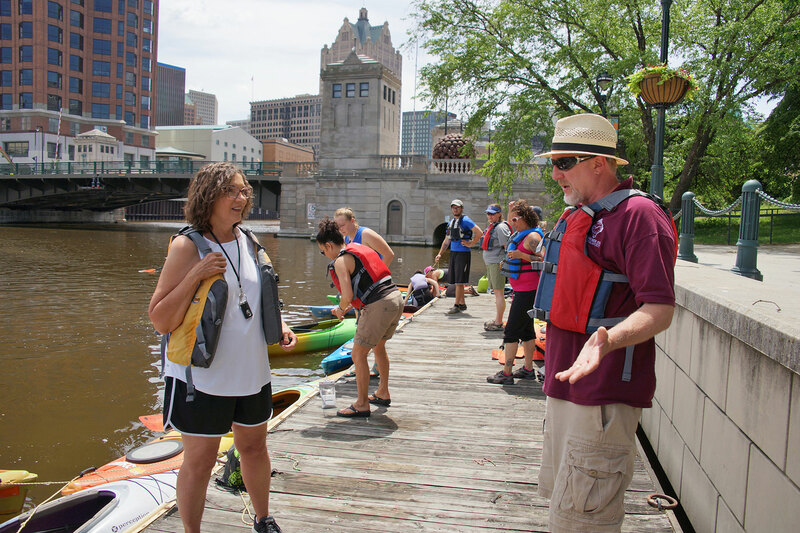 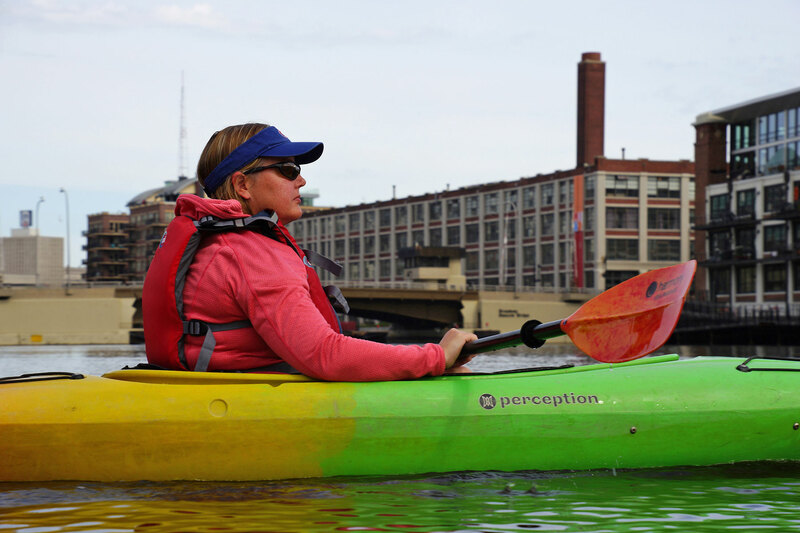 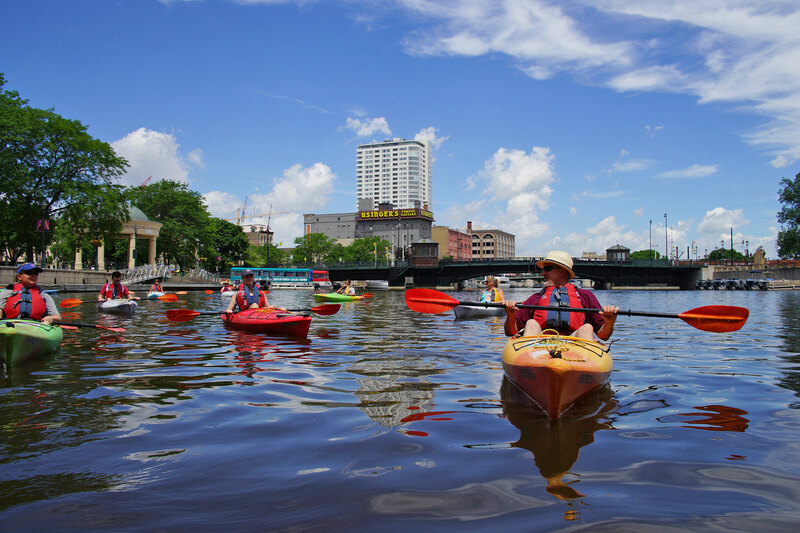 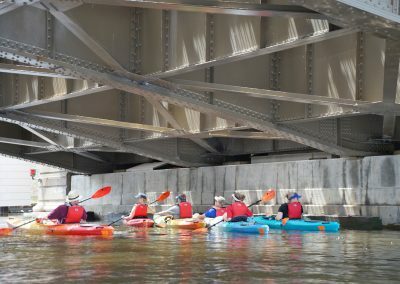 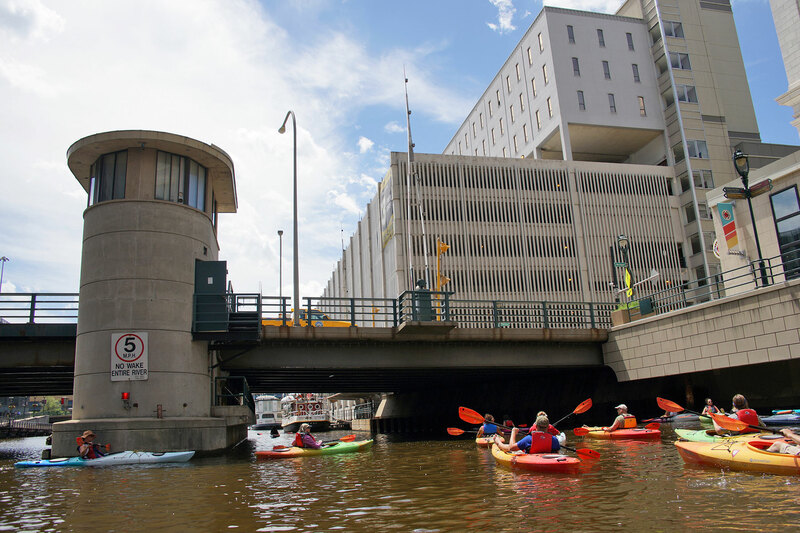 These images highlight a recent exploration of the Milwaukee River by kayak, guided by Steve Schaffer, Assistant Archivist for the Milwaukee County Historical Society (MCHS) and the Milwaukee Kayak Company’s founder, Beth Handle. 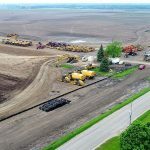 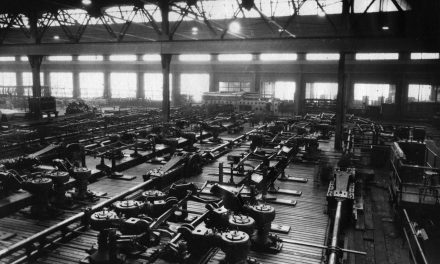 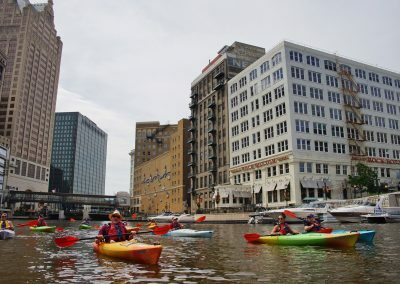 The Milwaukee River, and the industries that setup along its length, impacted in its role as a primary commercial waterway in the 19th and 20th Century. 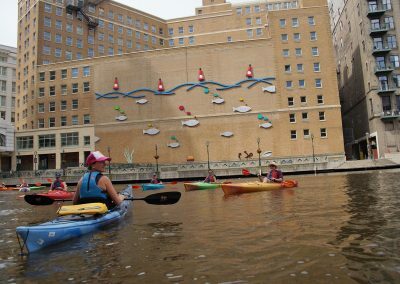 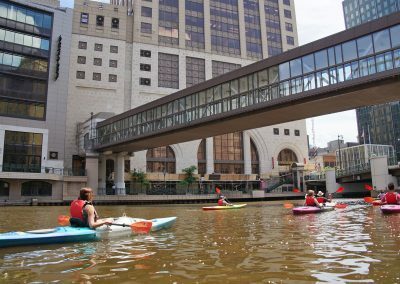 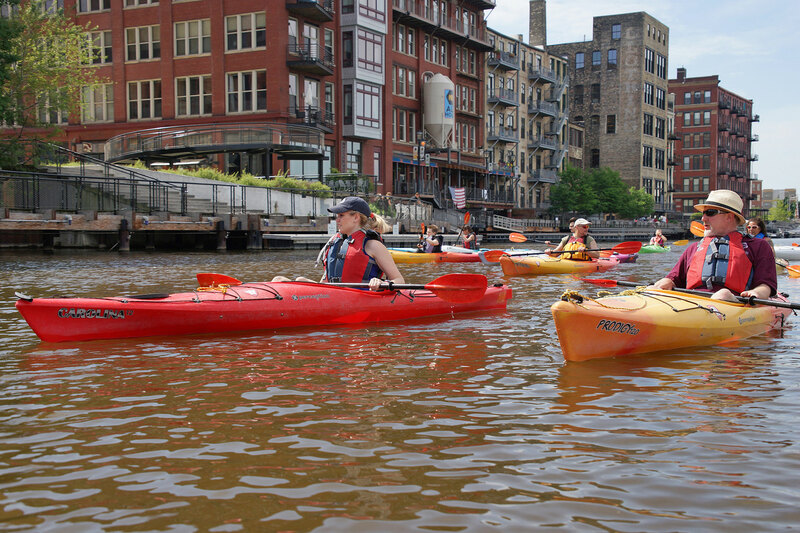 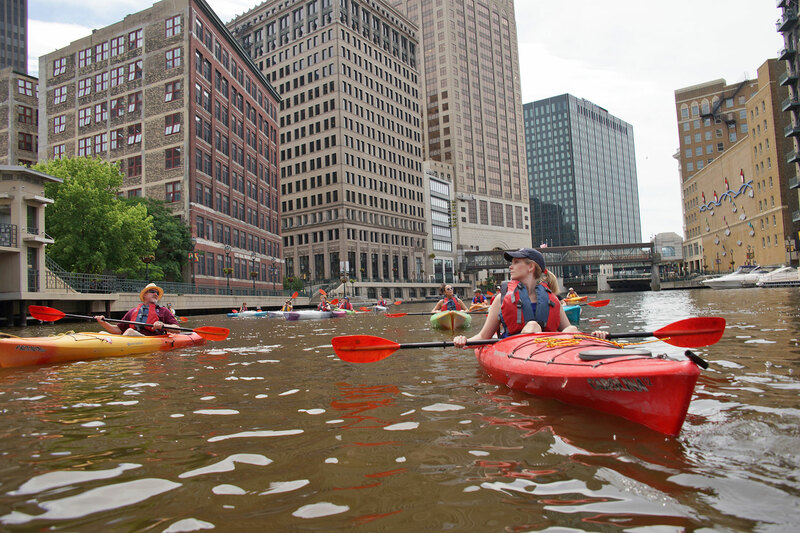 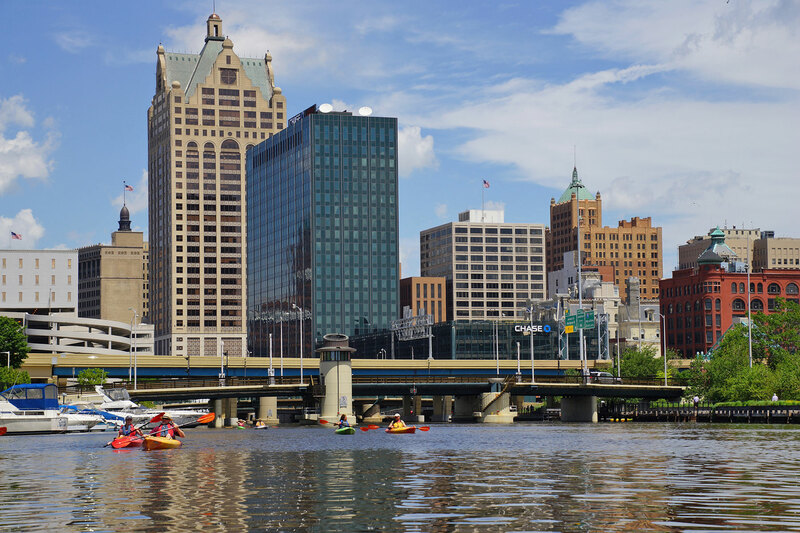 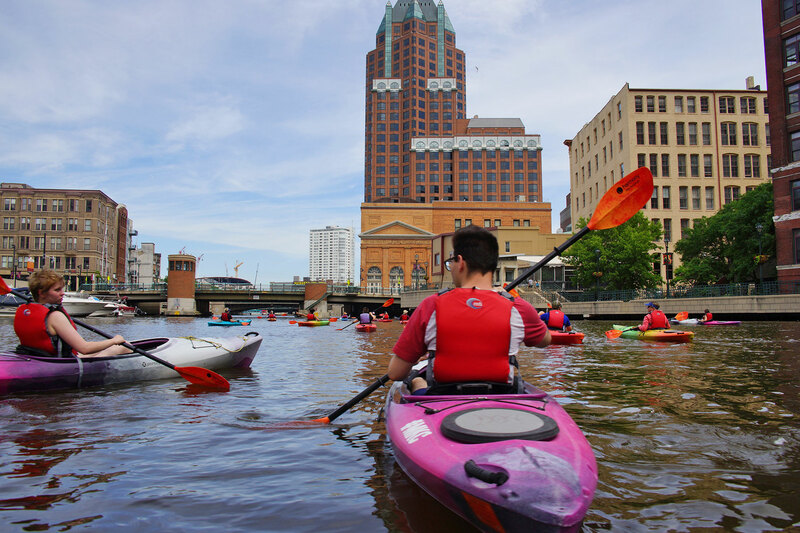 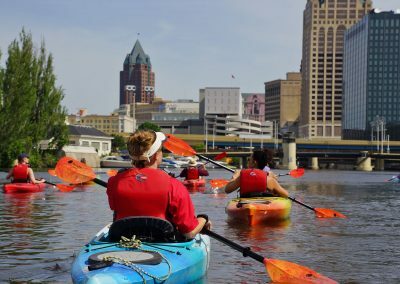 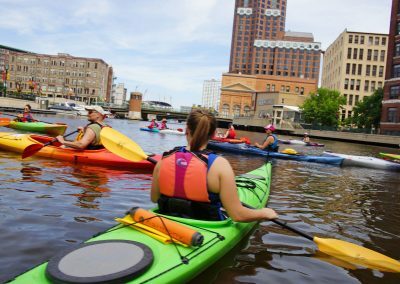 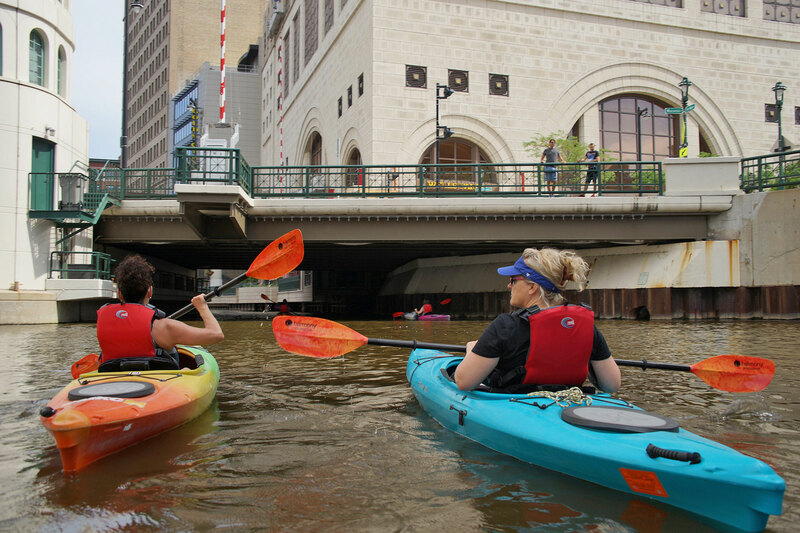 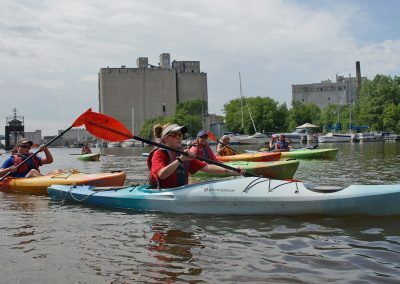 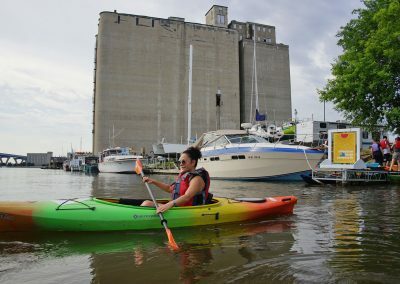 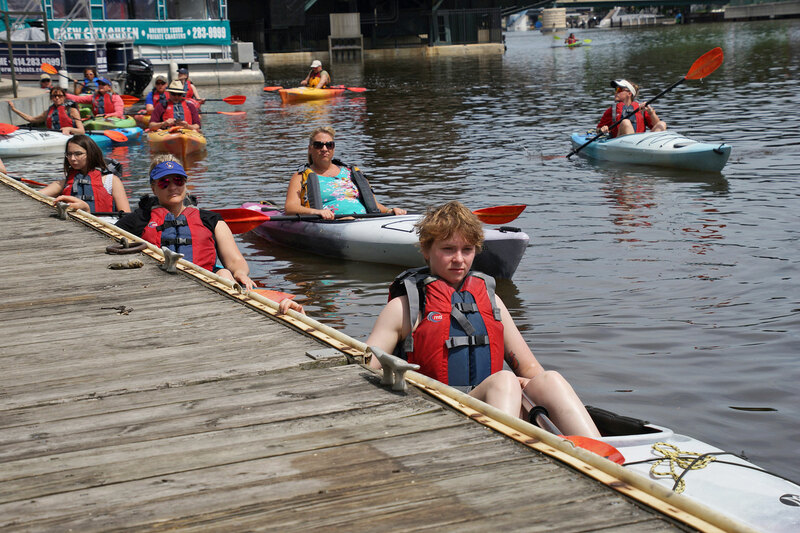 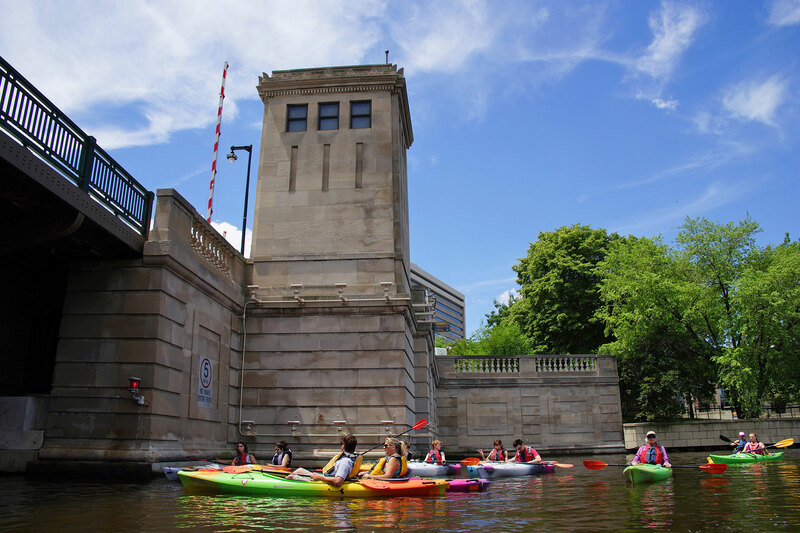 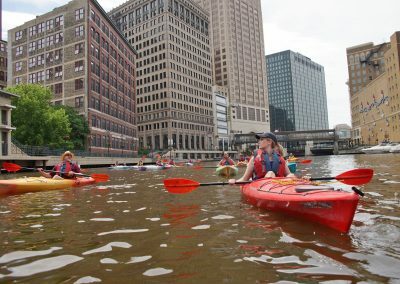 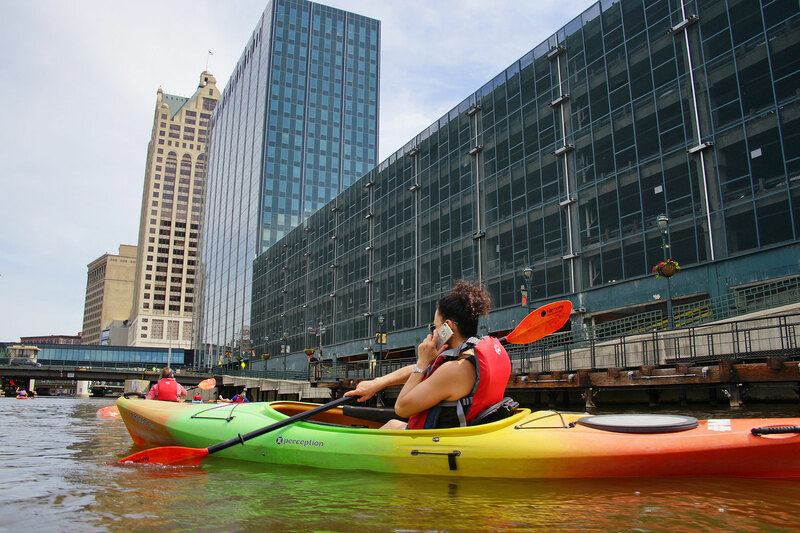 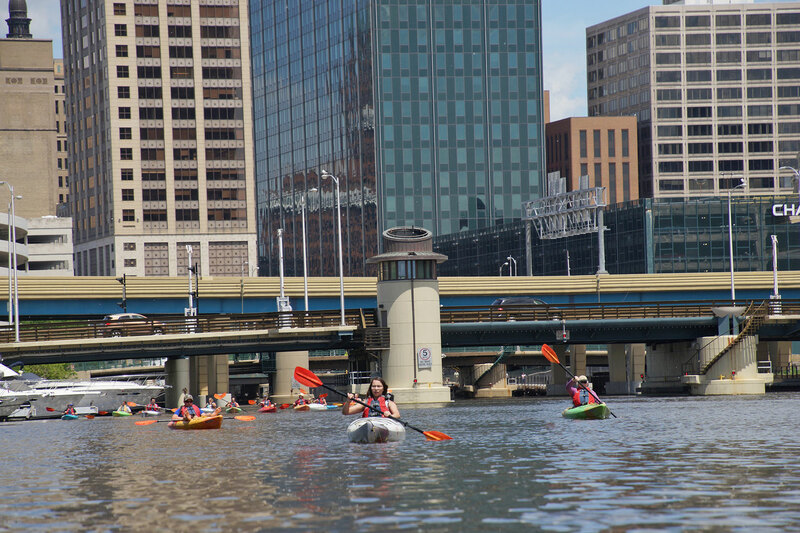 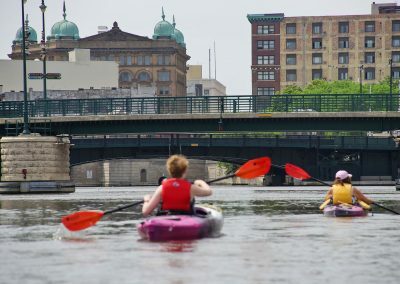 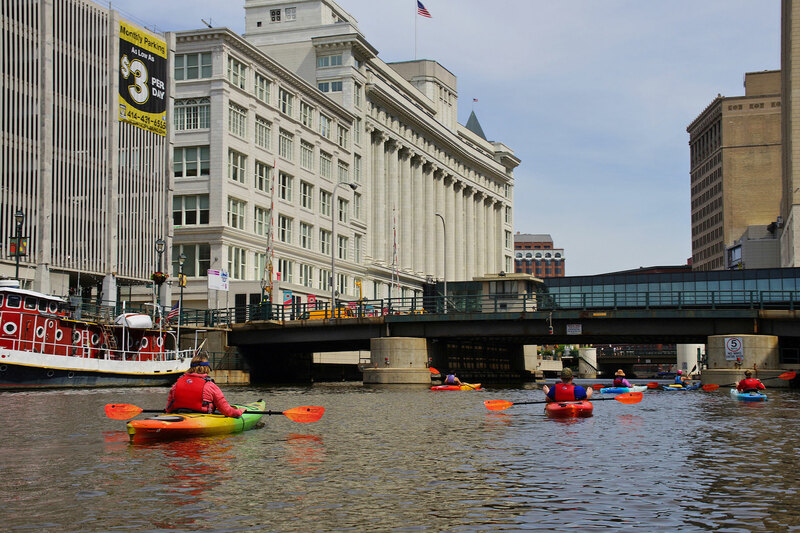 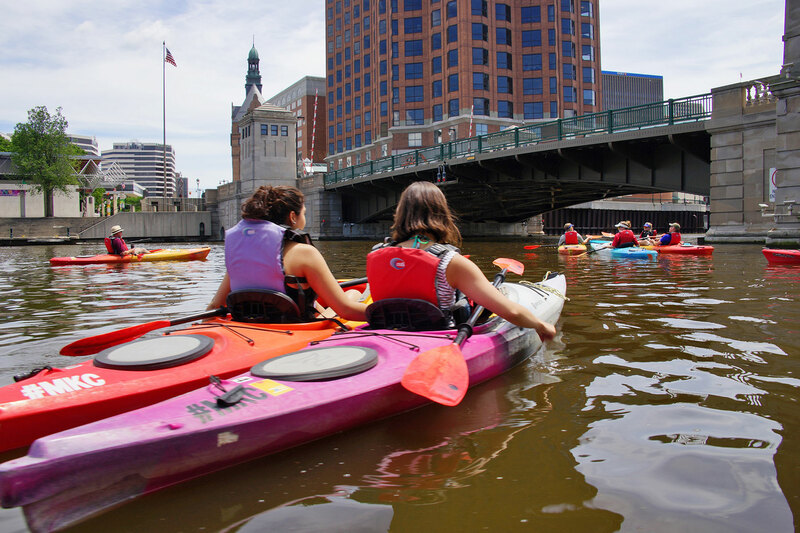 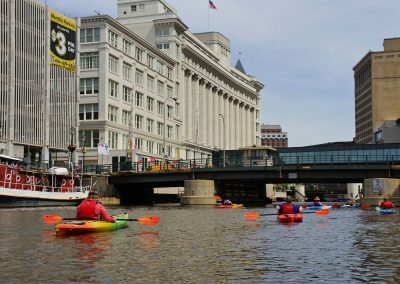 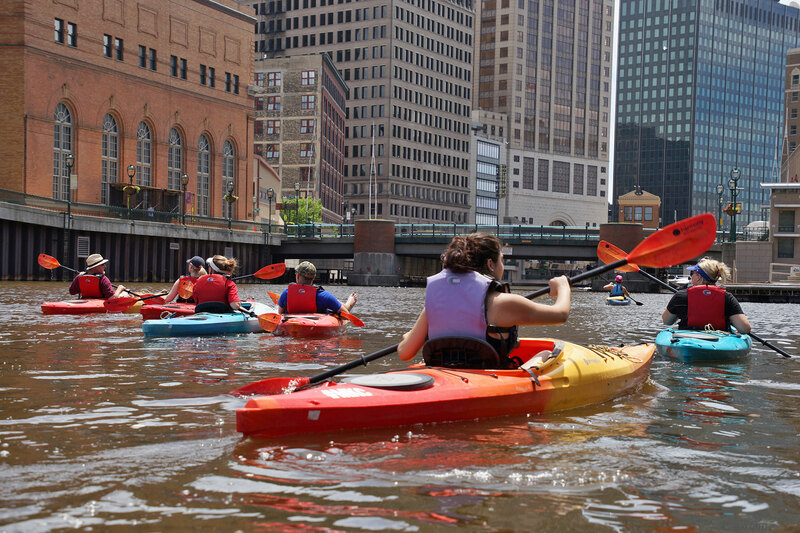 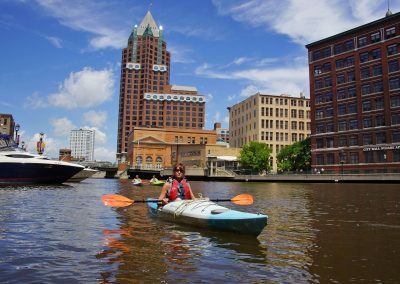 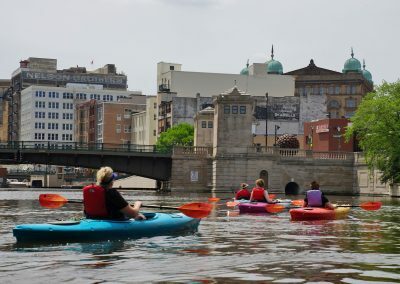 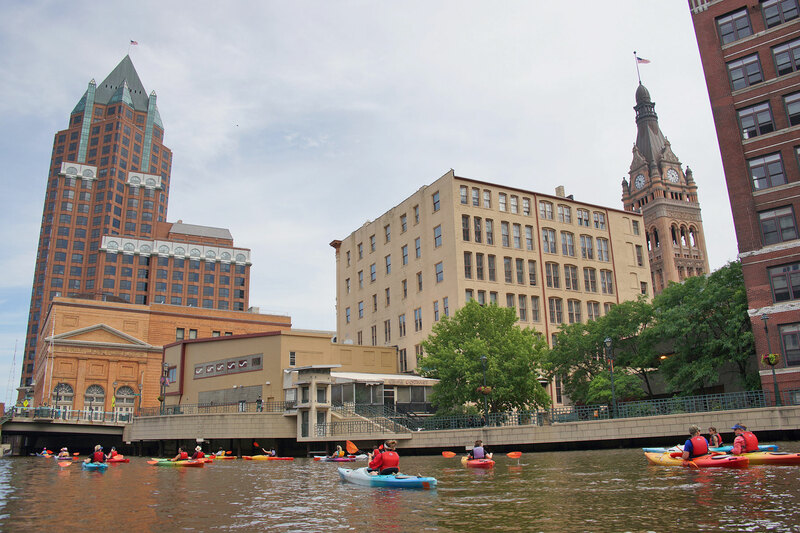 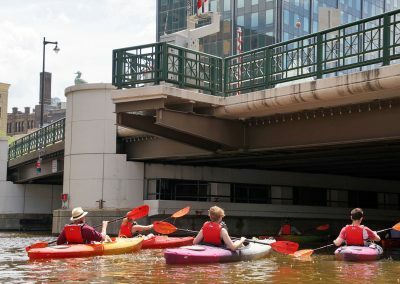 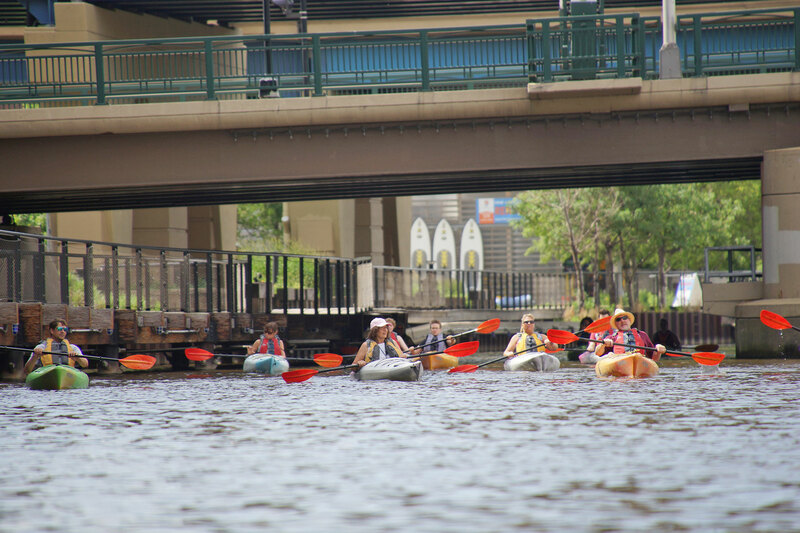 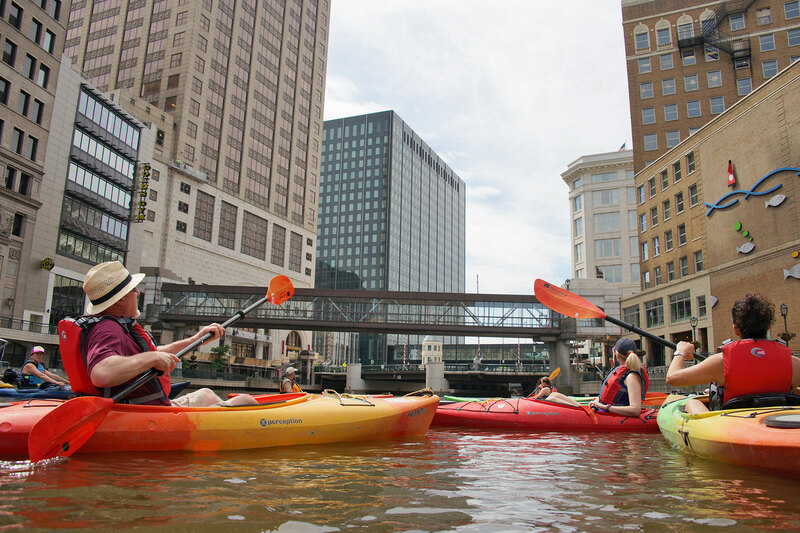 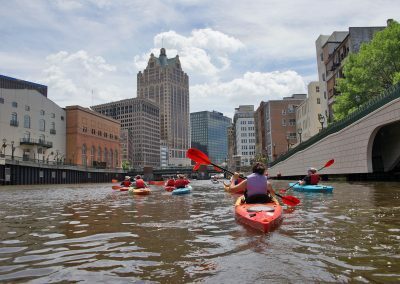 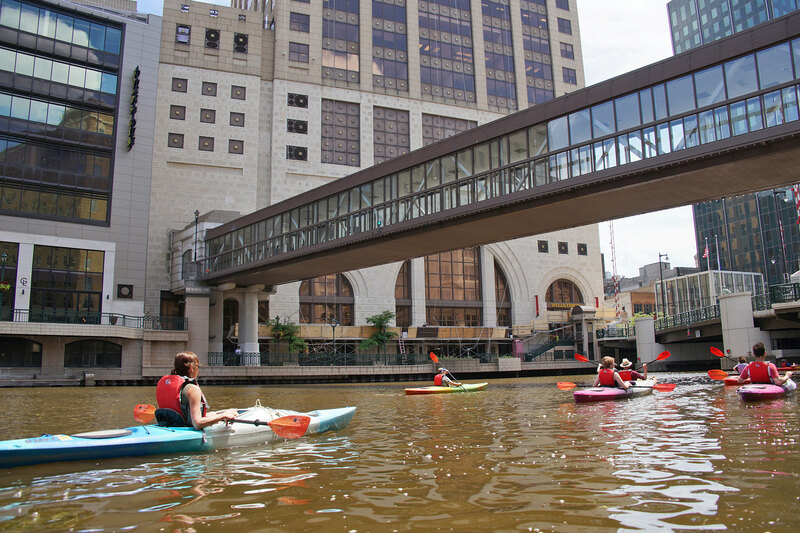 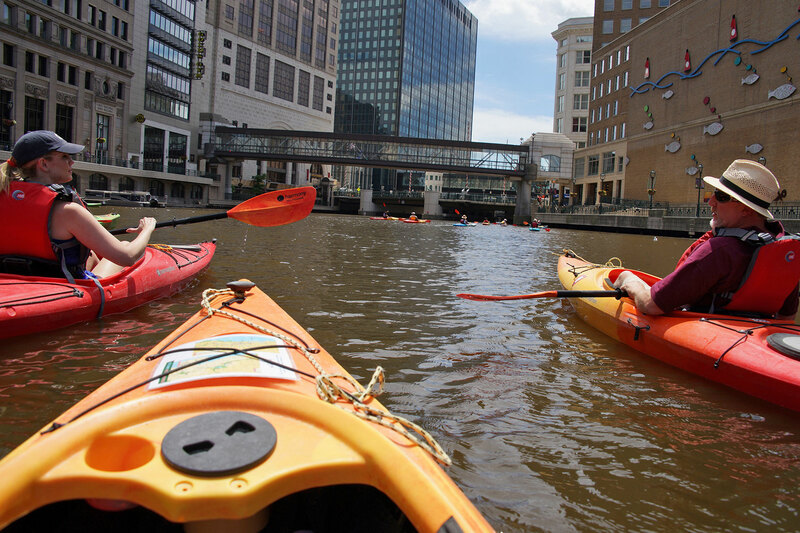 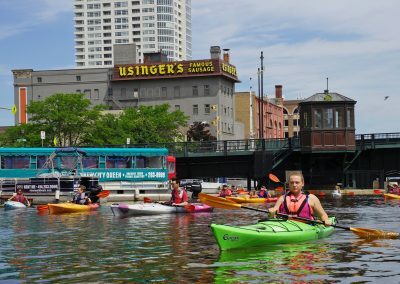 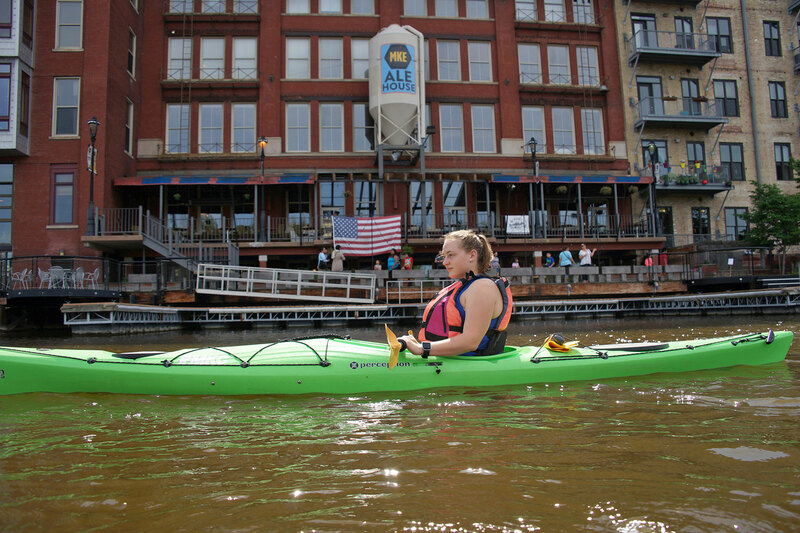 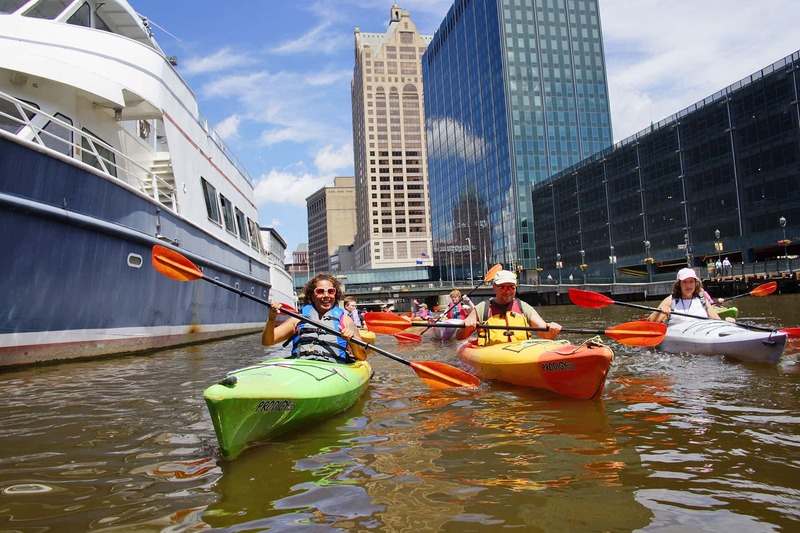 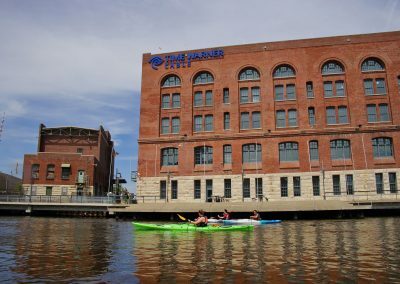 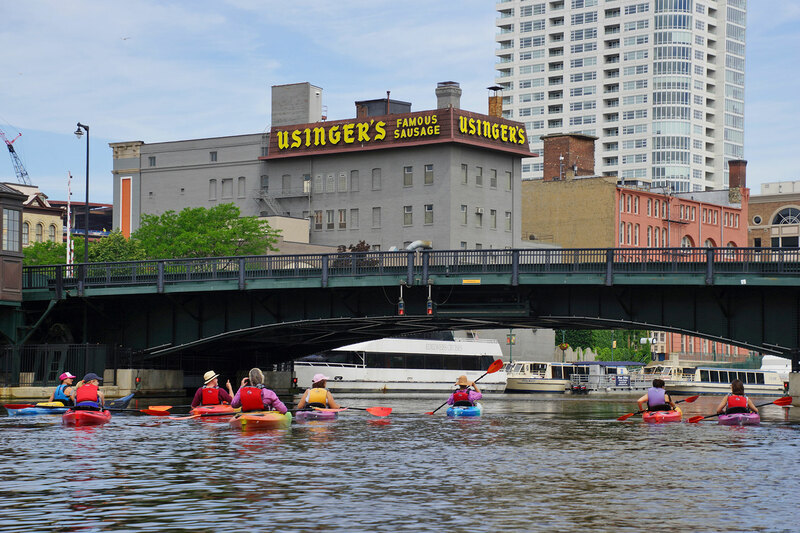 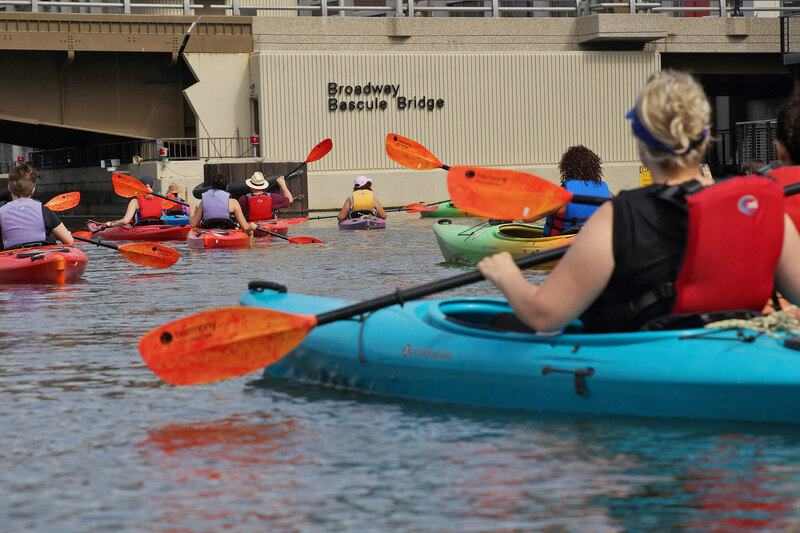 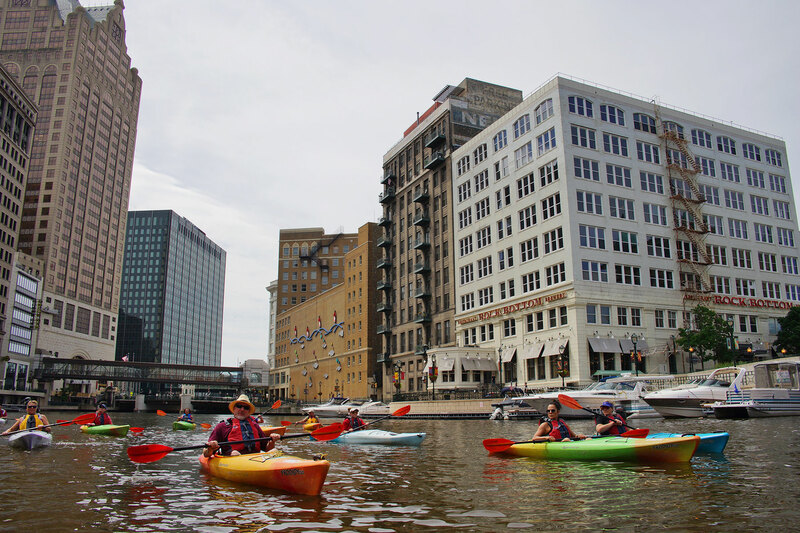 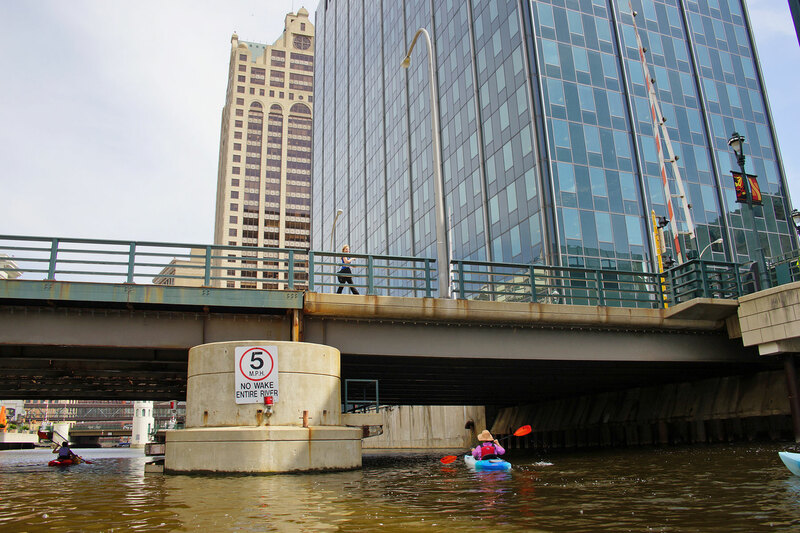 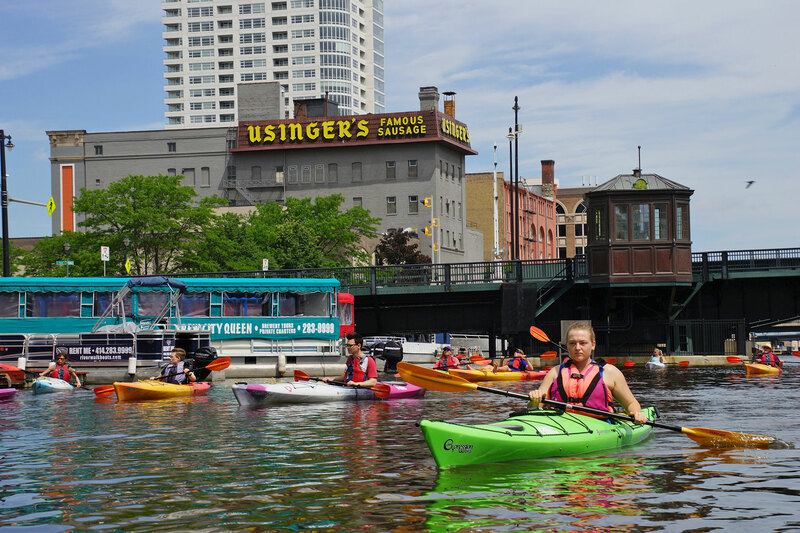 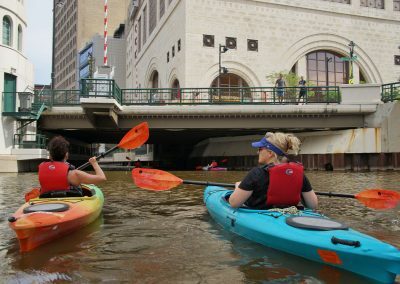 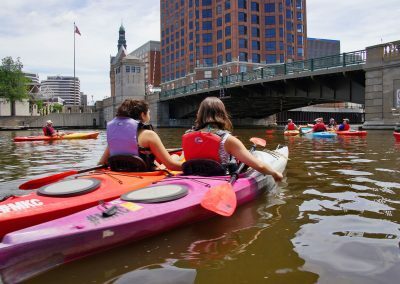 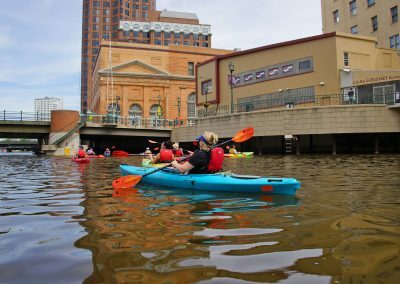 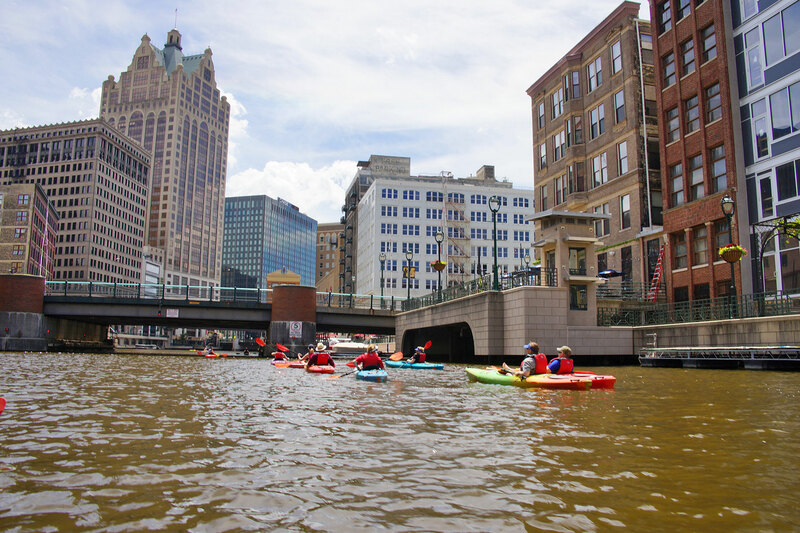 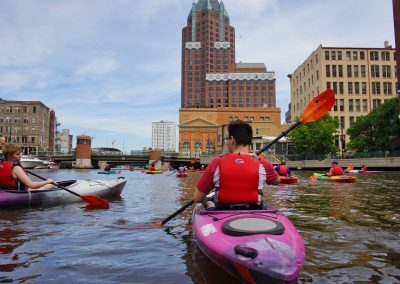 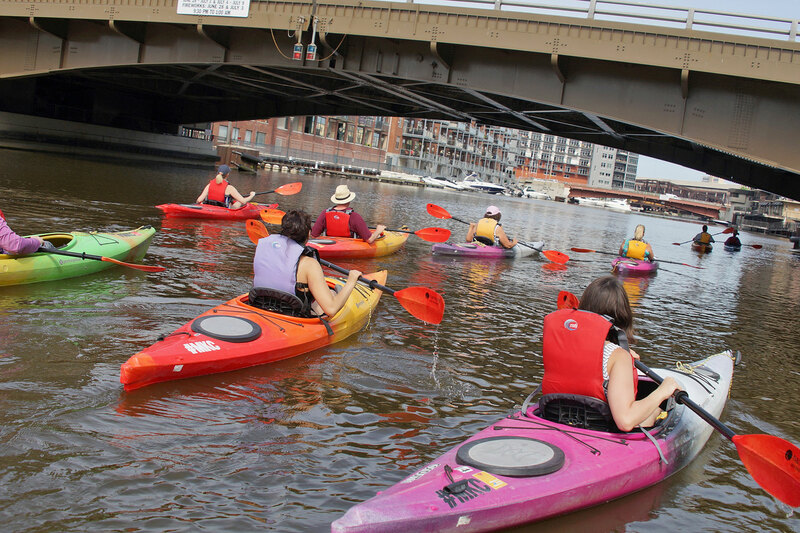 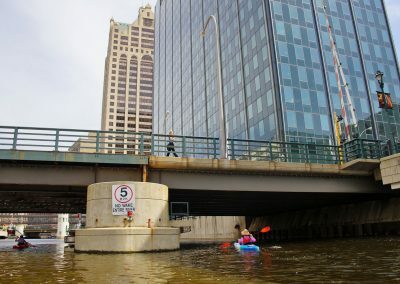 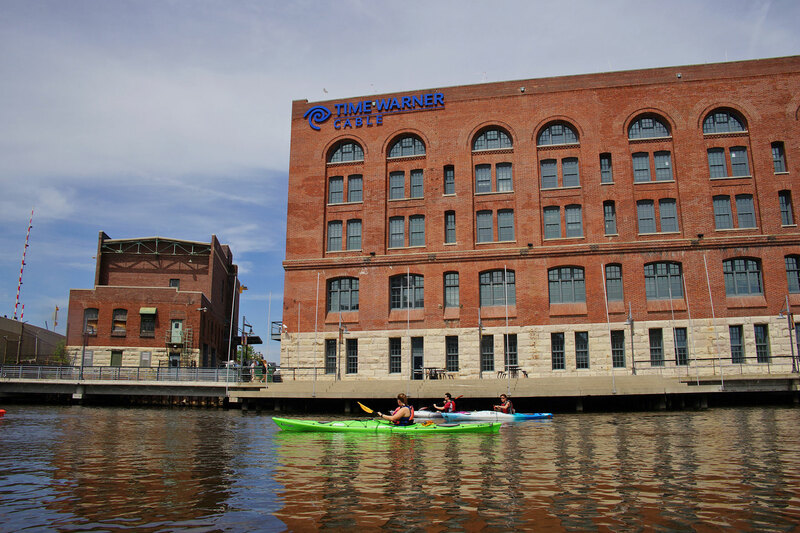 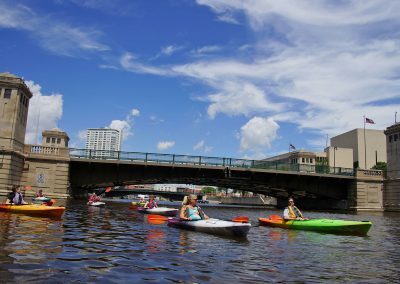 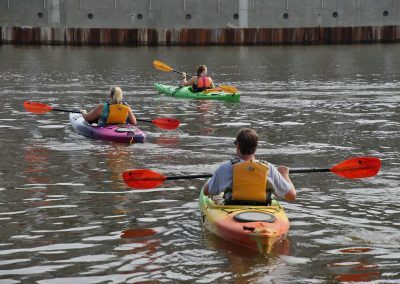 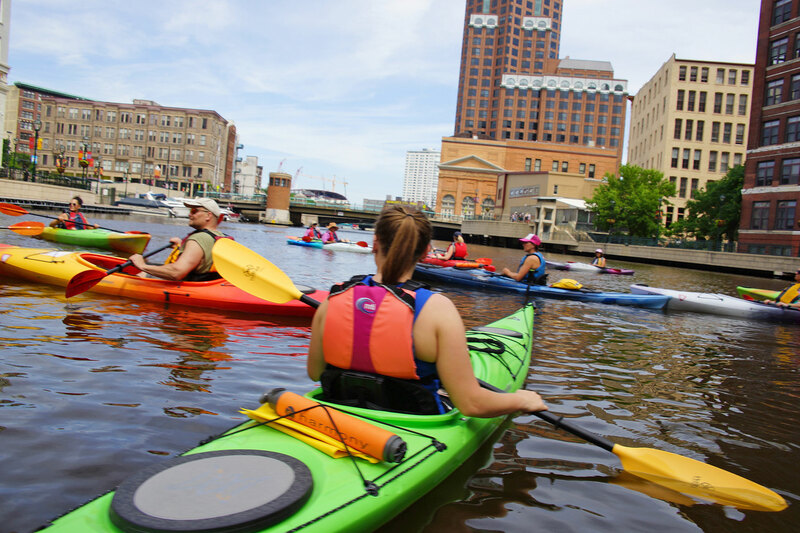 The kayak trip affords participants to experience magnificent views of current landmarks, such as the Germania Building, First National Bank Building, City Hall, Gimbels Brothers Building, the Button Block, and of course the 2nd Ward Savings Bank that is home to the Milwaukee County Historical Society. 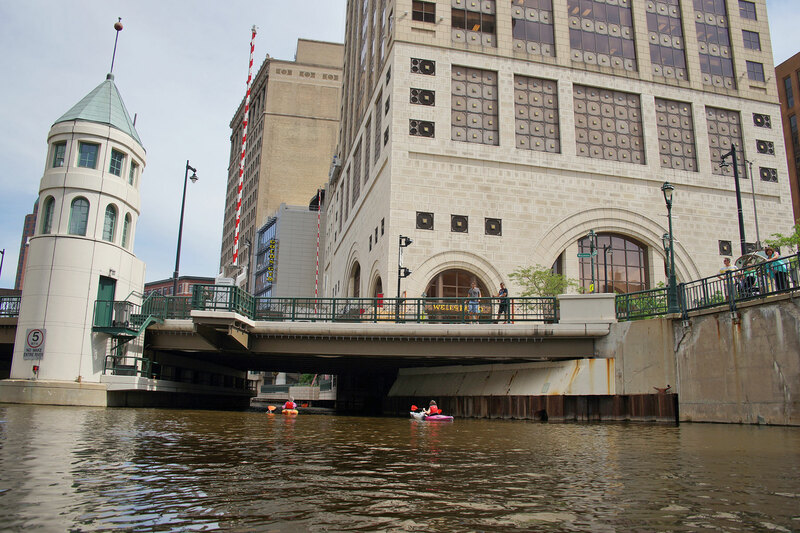 The 100 East Building, at the corner of N Water and E Wisconsin, was the location of Solomon Juneau’s trading post and the former site of the Pabst Building. 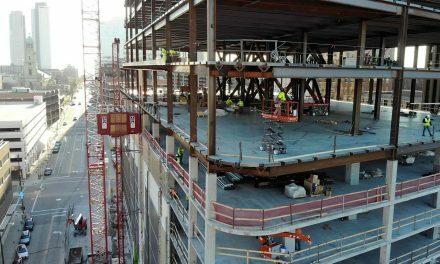 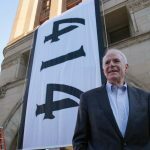 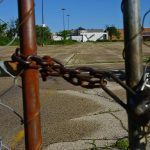 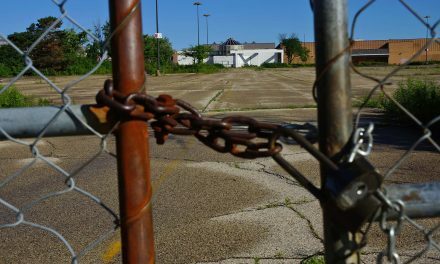 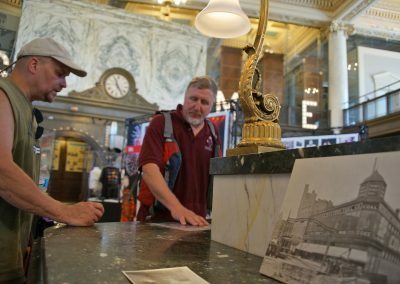 Where the Milwaukee Market stands was the former Cross Keys Hotel Building, that occupied that spot at Water and St Paul until 1975. 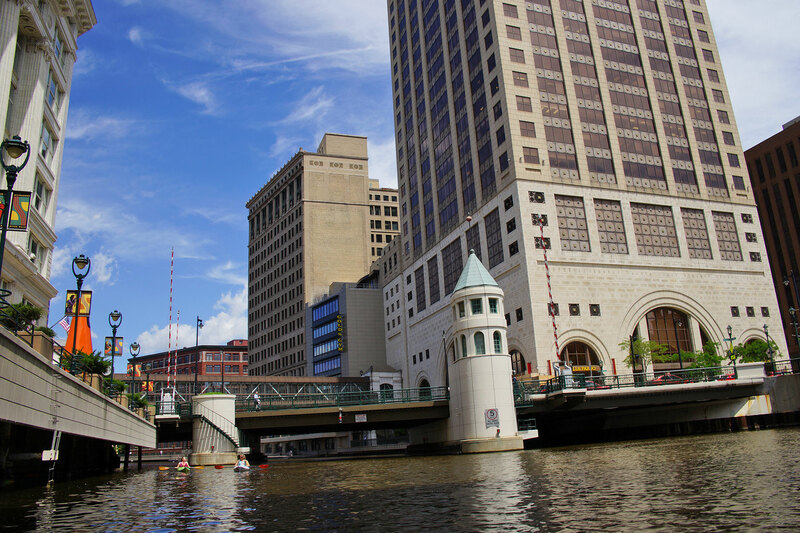 In the early 1970s, one of the tenants was the River Queen gay bar. 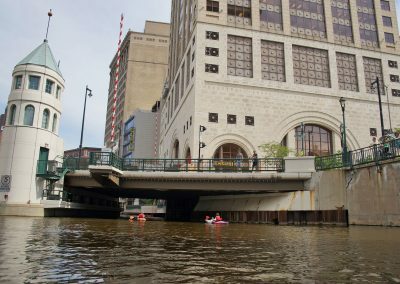 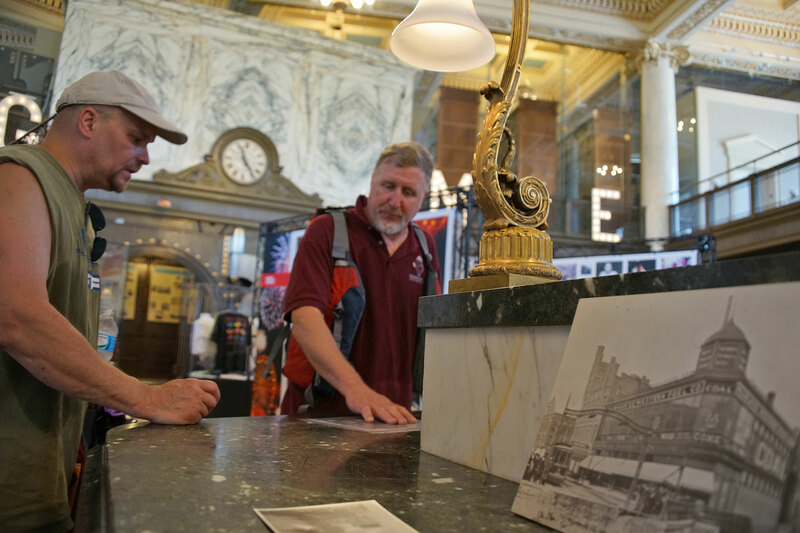 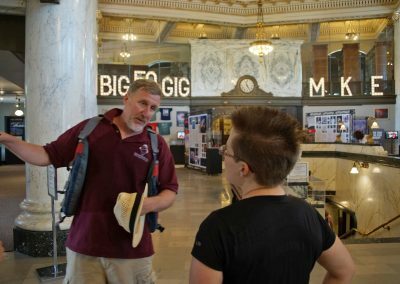 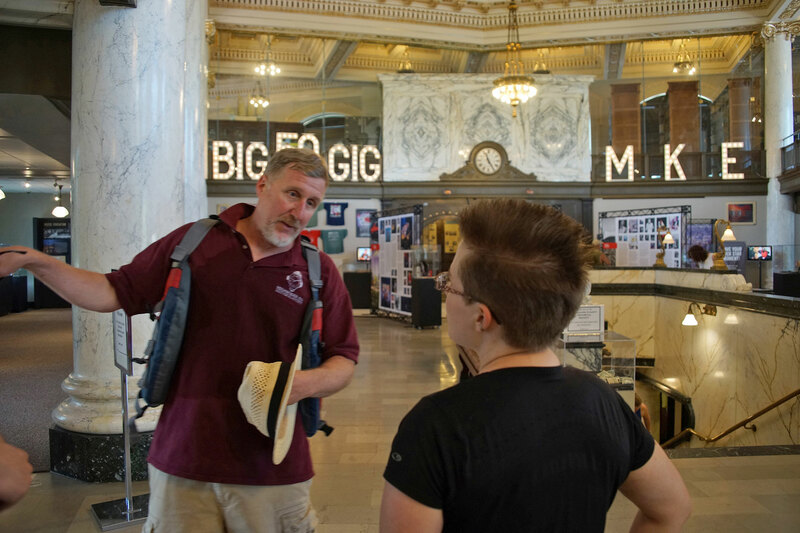 The Mitchell Building and the Grain Exchange (Mackie) Building are highlighted on the history tour because of their age and architectural significance, but also because of their commercial influence on the Milwaukee River. 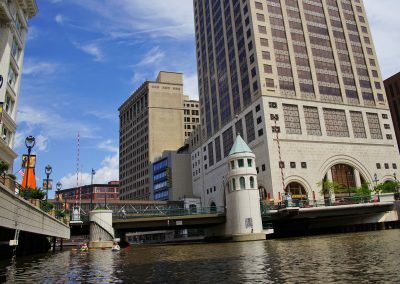 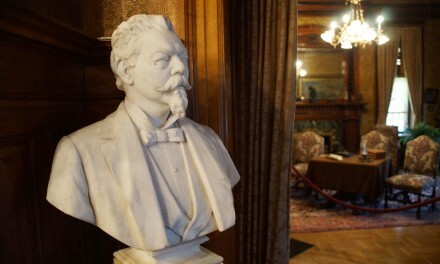 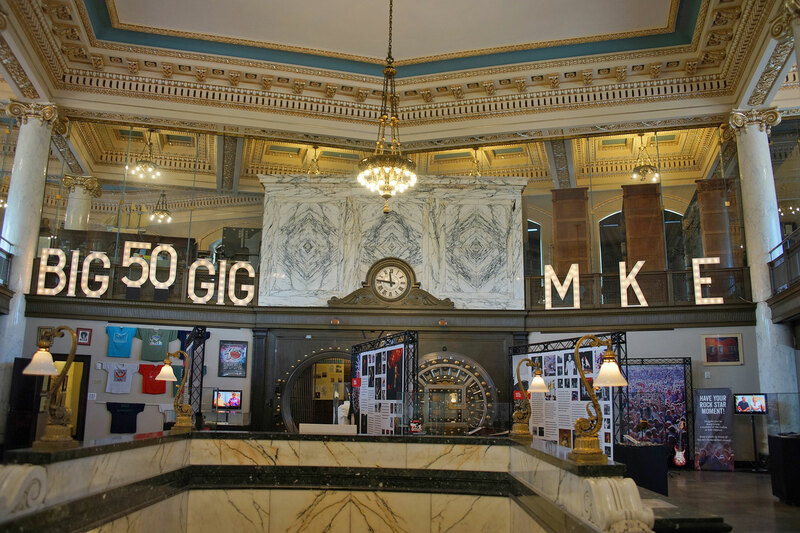 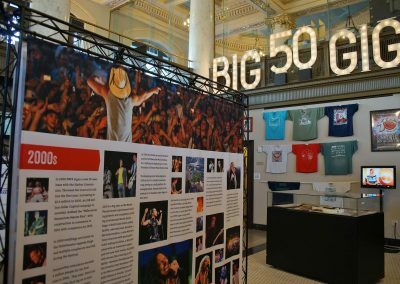 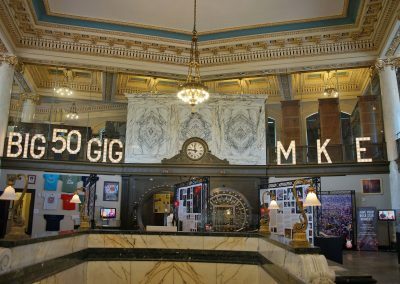 During the 1870s, Milwaukee was the largest grain shipping port in the World and the Grain Exchange was the epicenter of that activity in Milwaukee. The Milwaukee River had an especially important role in establishing the boundaries for the first three settlements that comprised Milwaukee, Juneautown, Kilbourntown, and Walker’s Point. 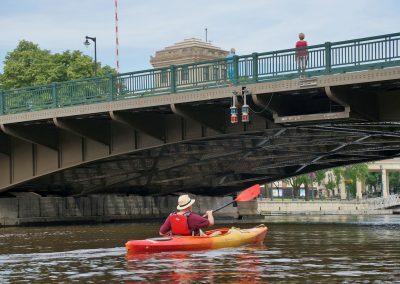 The competing ambitions of the founders, especially the acrimony between Solomon Juneau and Byron Kilbourn, can be seen in the angled bridges spanning the Milwaukee River, linking street grids the founders never intended to be united. 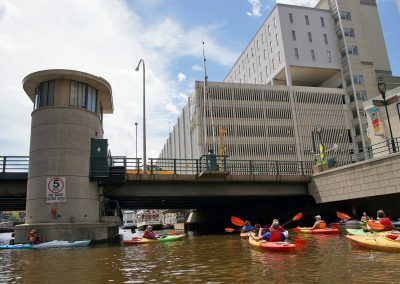 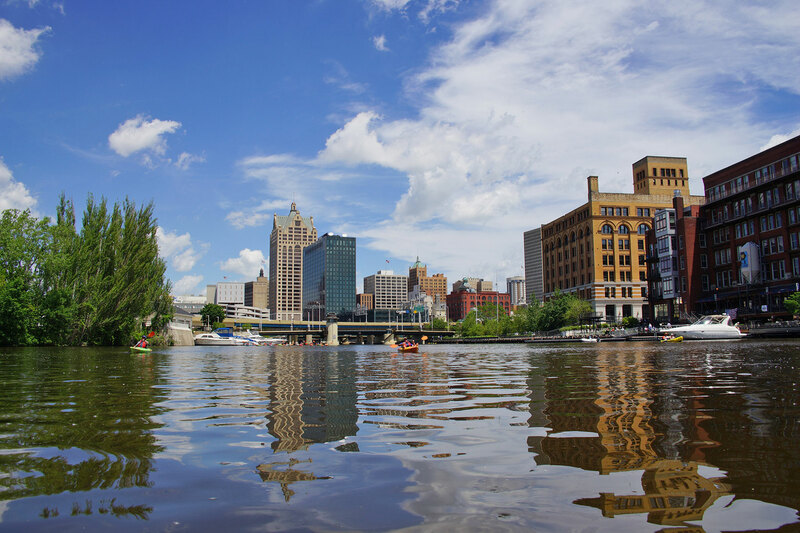 The Milwaukee River served many roles, as a source of power, recreation including fishing and swimming, and as a source for ice, critical to the early brewing industry. 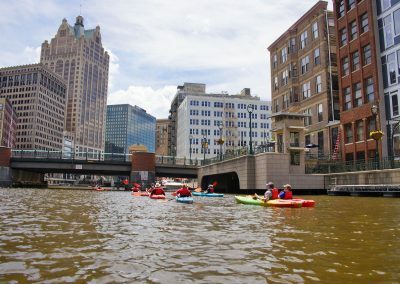 However, the Milwaukee River increasingly served as an economic artery for the city’s commercial and industrial expansion, especially after the “straight cut” of 1857 that simplified entry into the confluence of the KK and the Milwaukee River, created Jones Island, and established Milwaukee as a preeminent Great Lake Port and transportation hub. 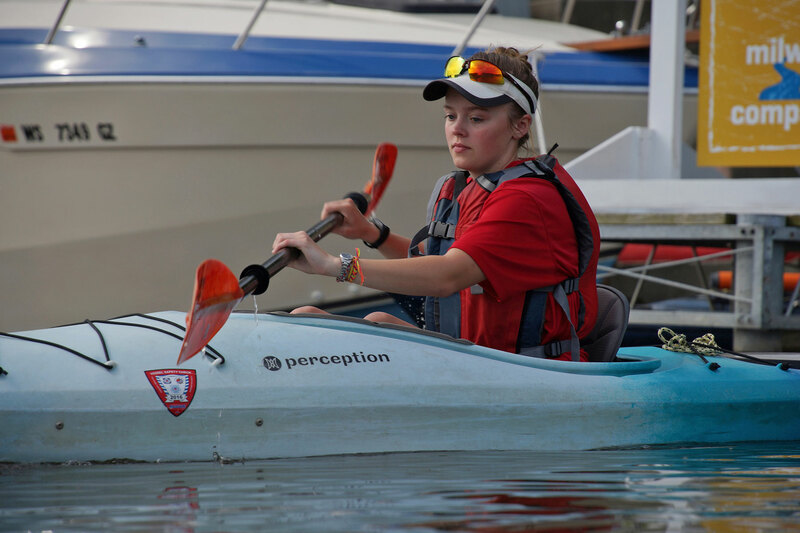 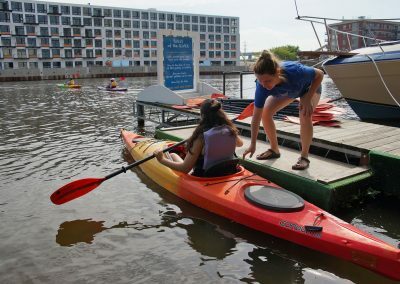 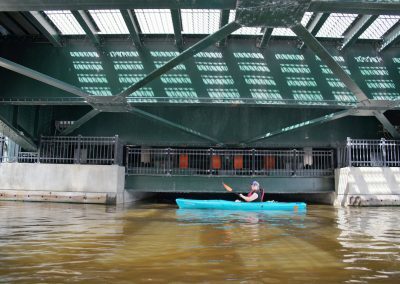 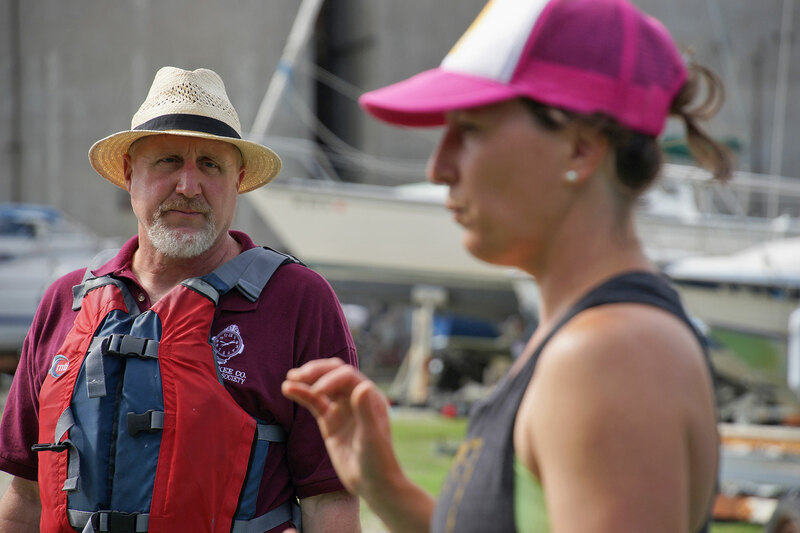 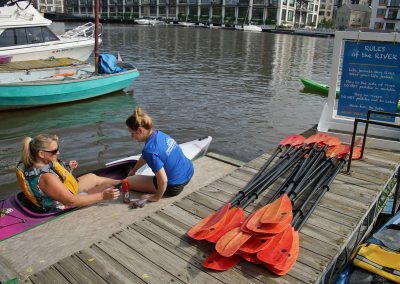 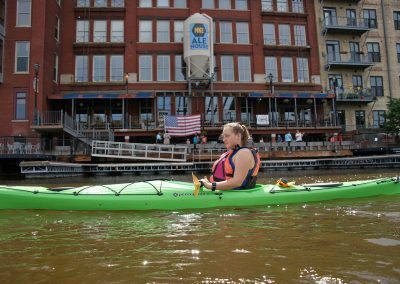 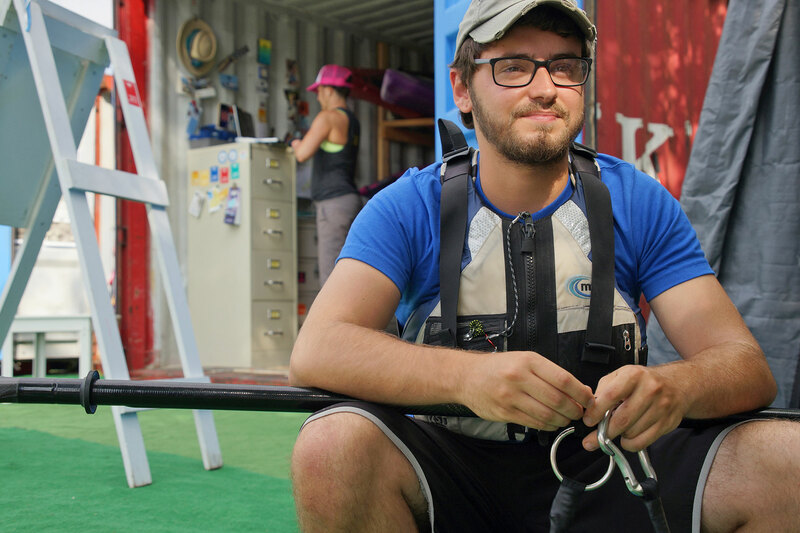 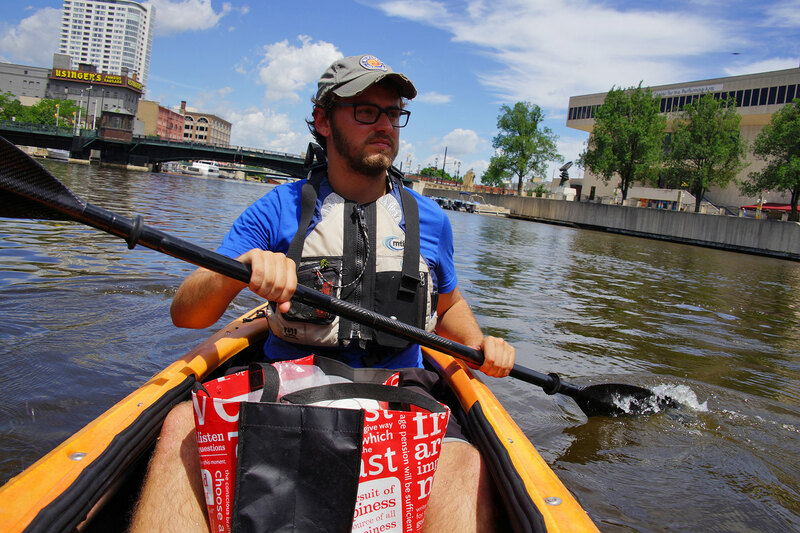 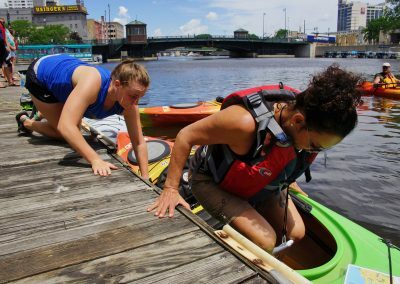 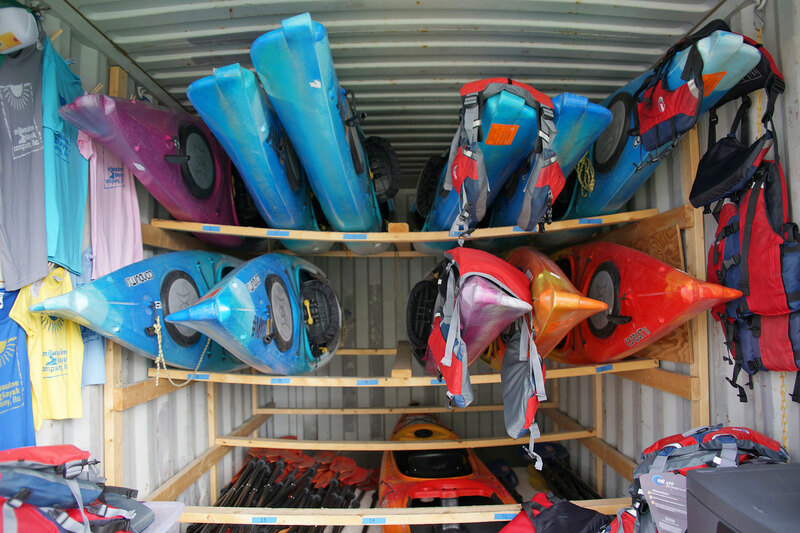 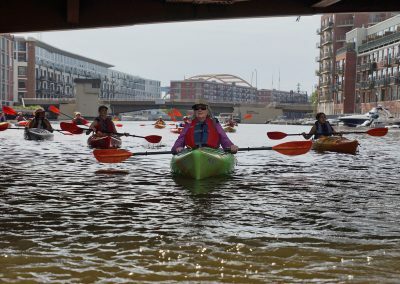 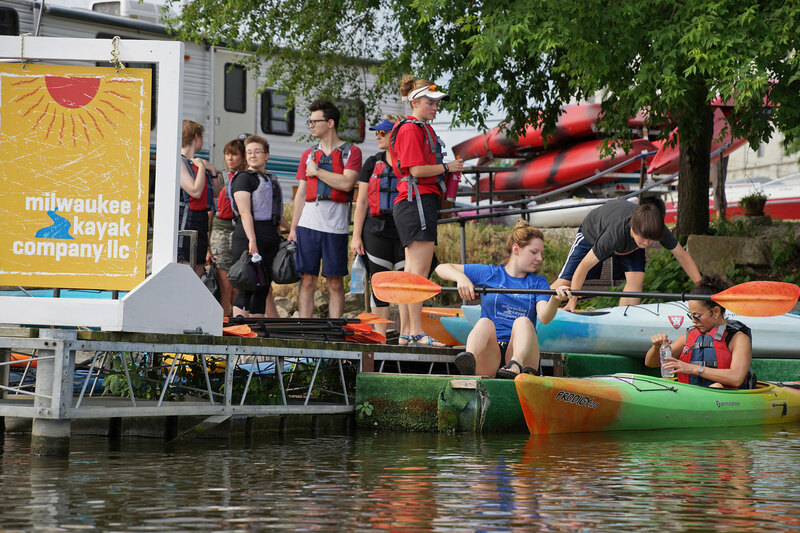 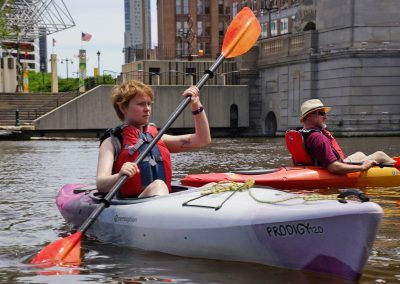 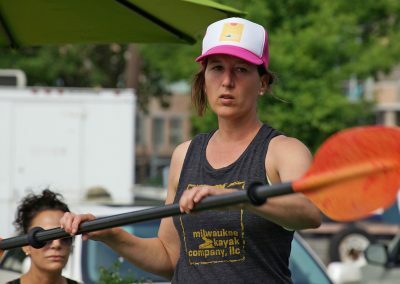 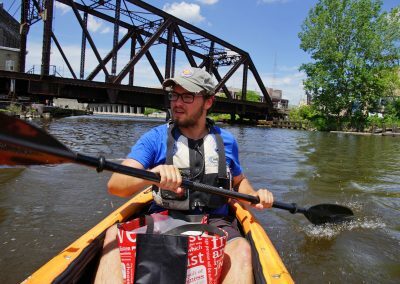 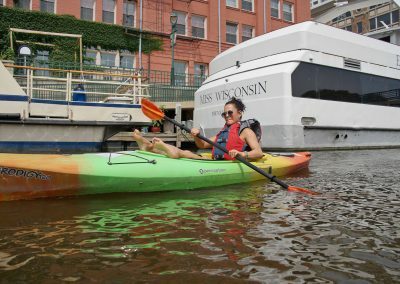 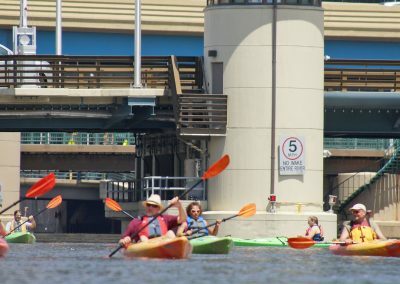 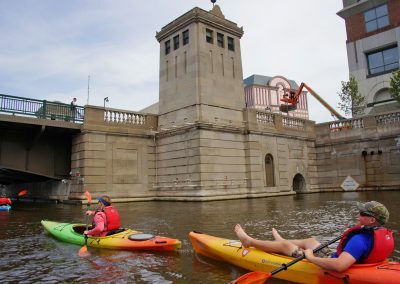 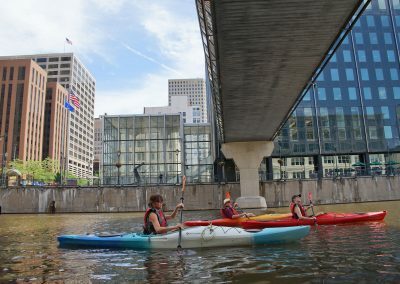 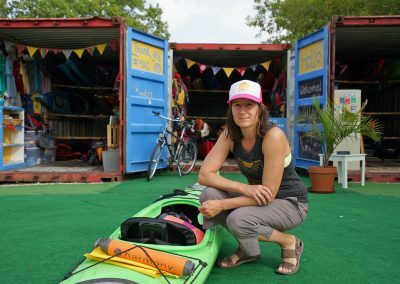 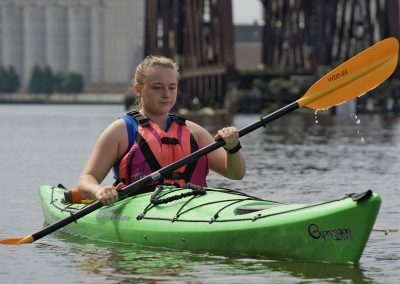 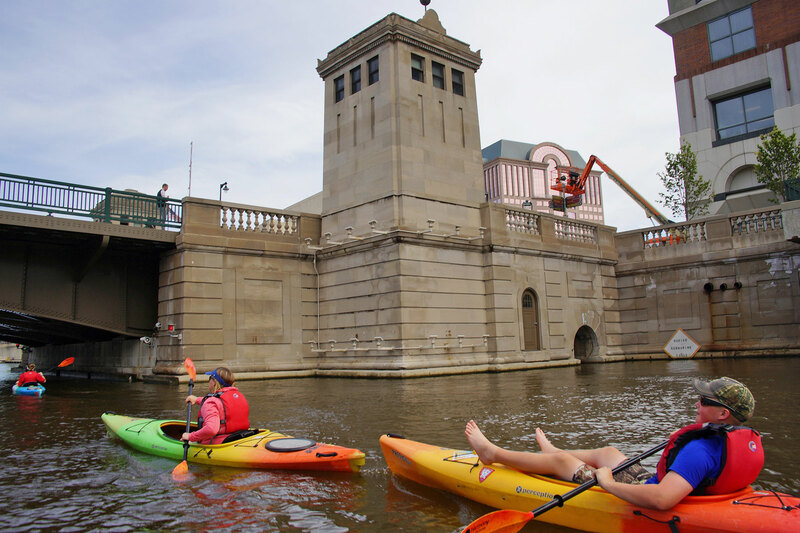 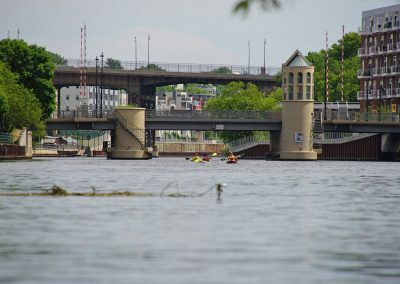 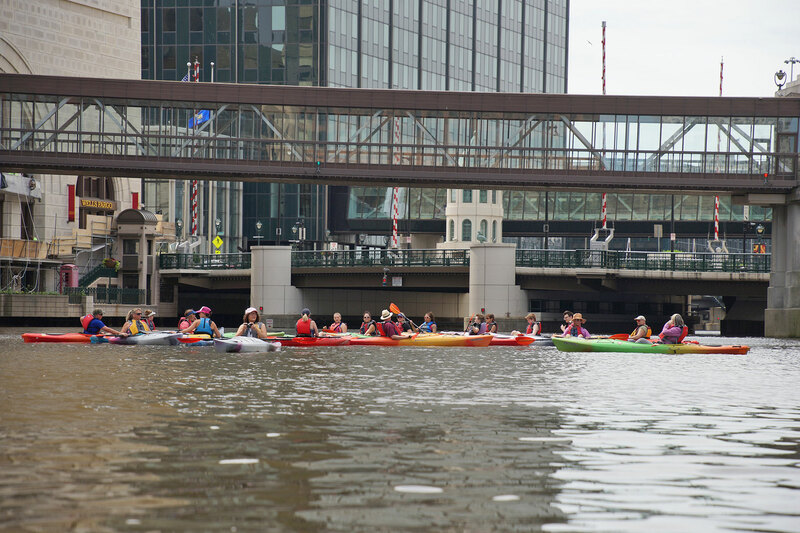 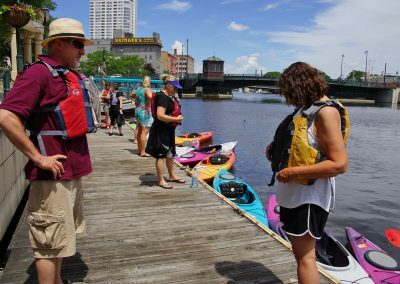 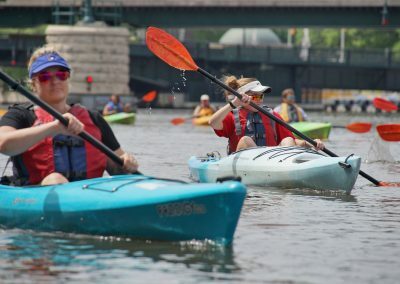 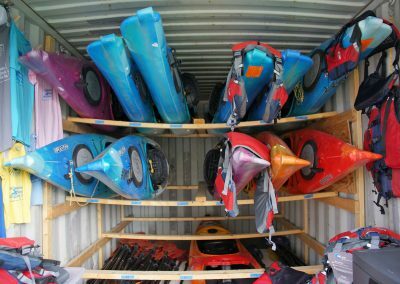 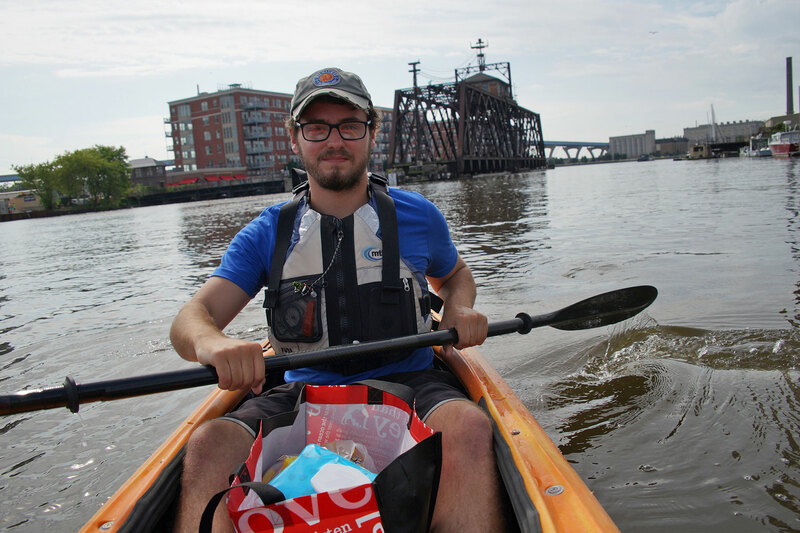 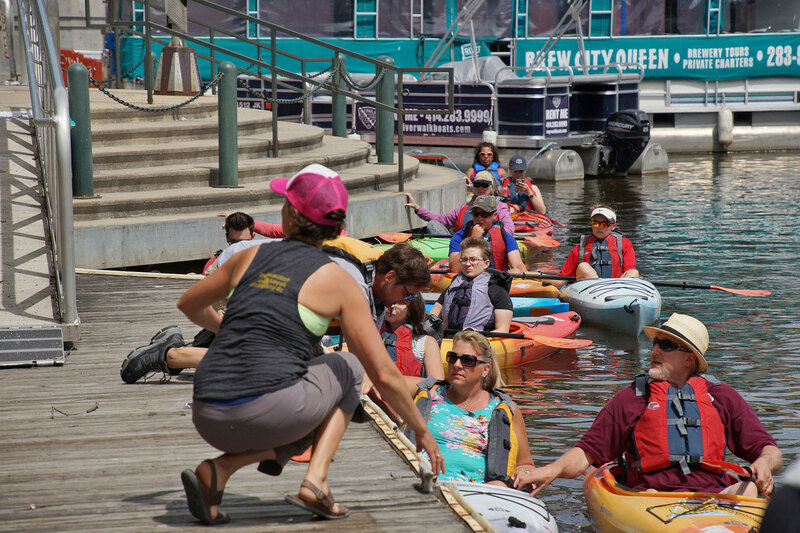 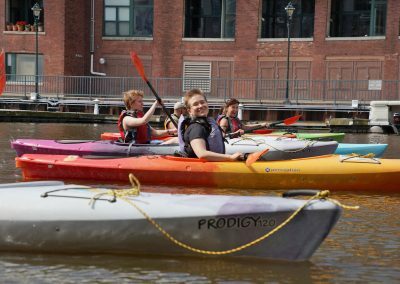 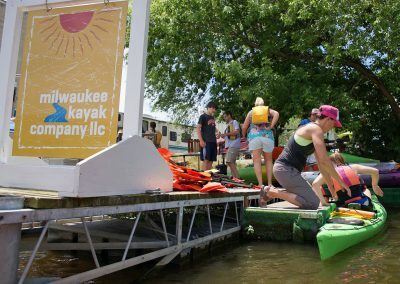 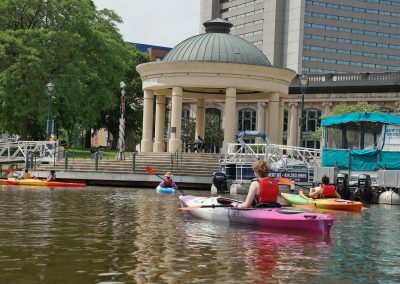 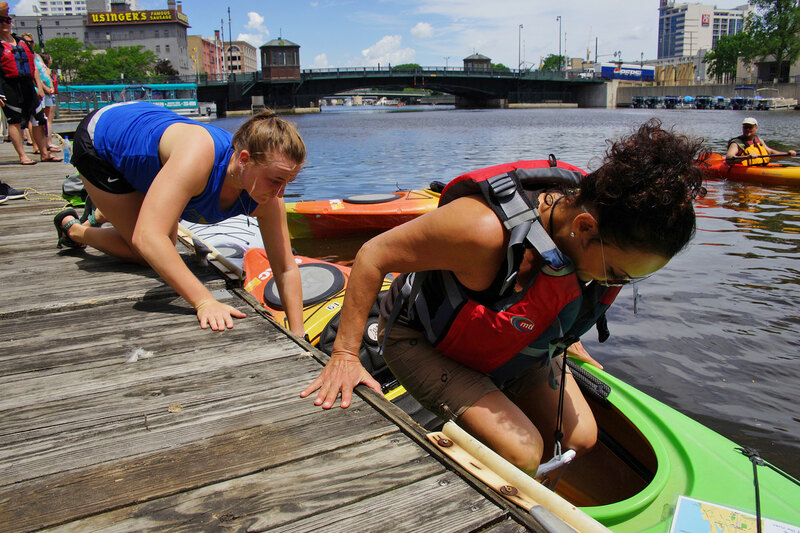 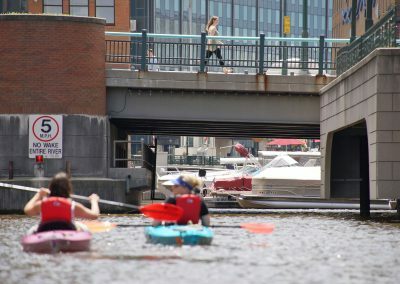 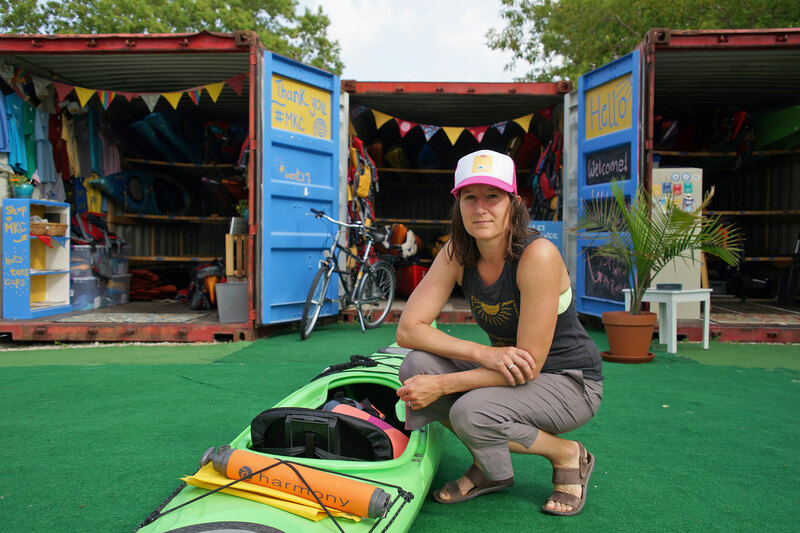 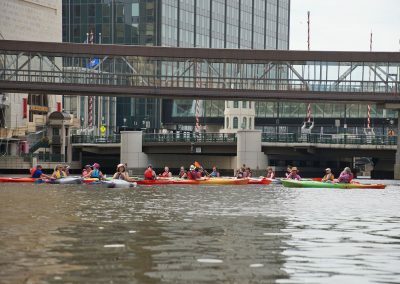 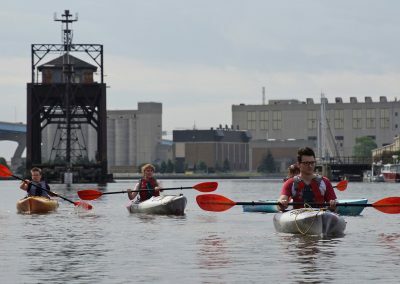 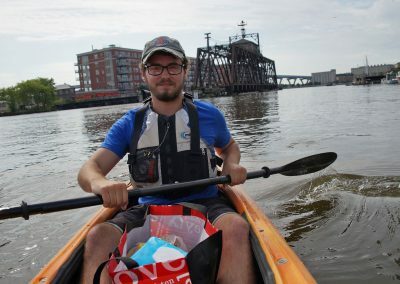 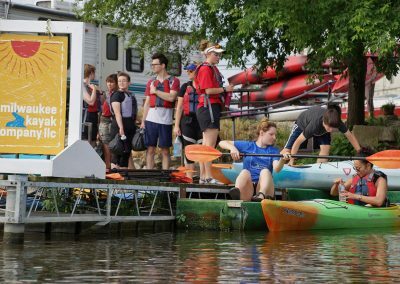 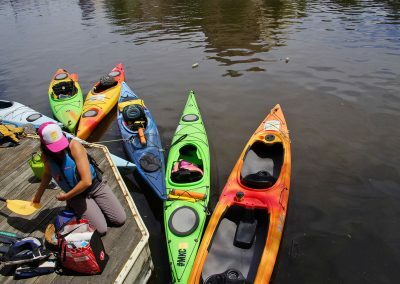 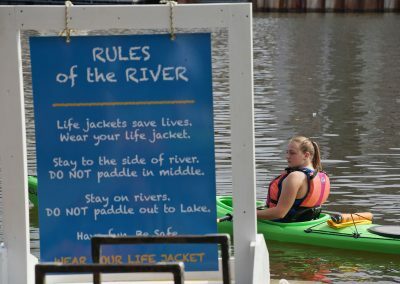 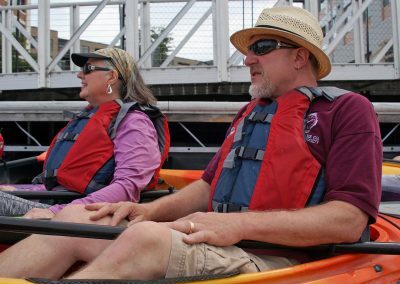 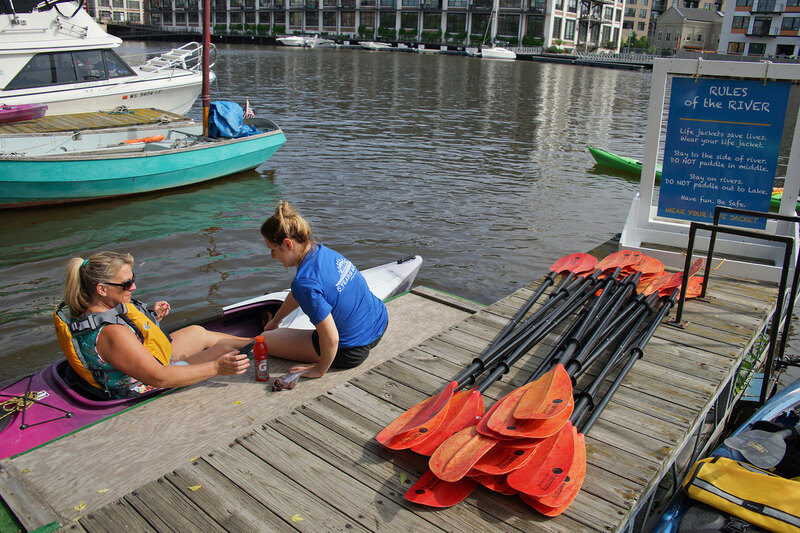 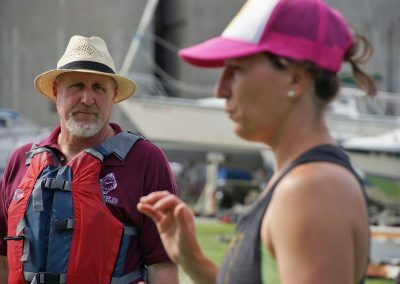 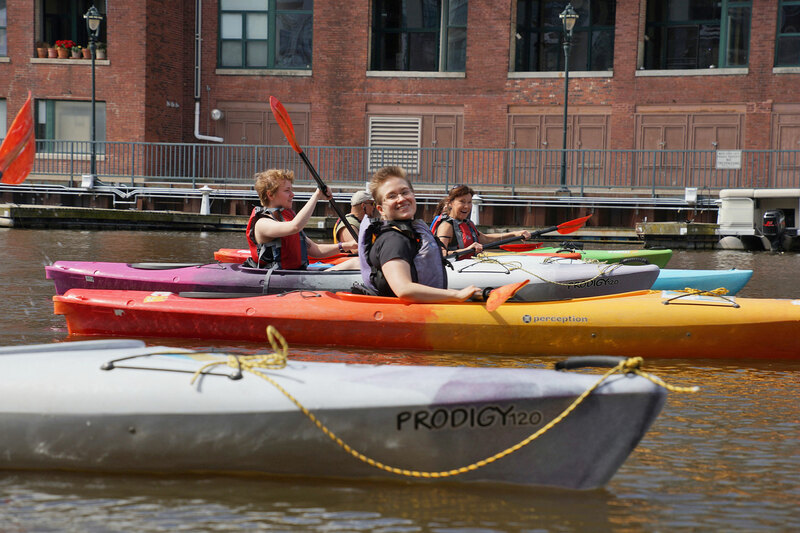 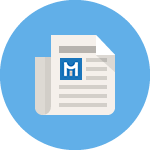 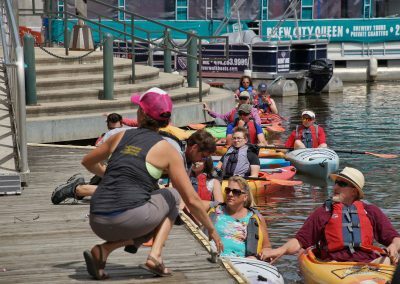 For this news feature, the Milwaukee Independent traveled in a tandem kayak due to the logistics of simultaneous rowing and photography. 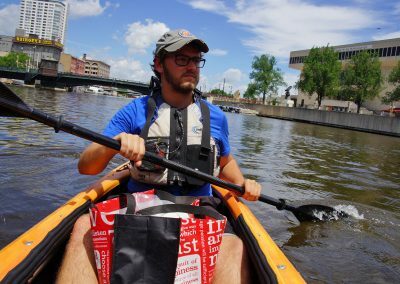 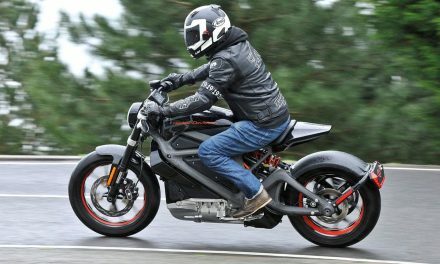 Brandon Skinkis deserves credit for his navigation skills and stamina.